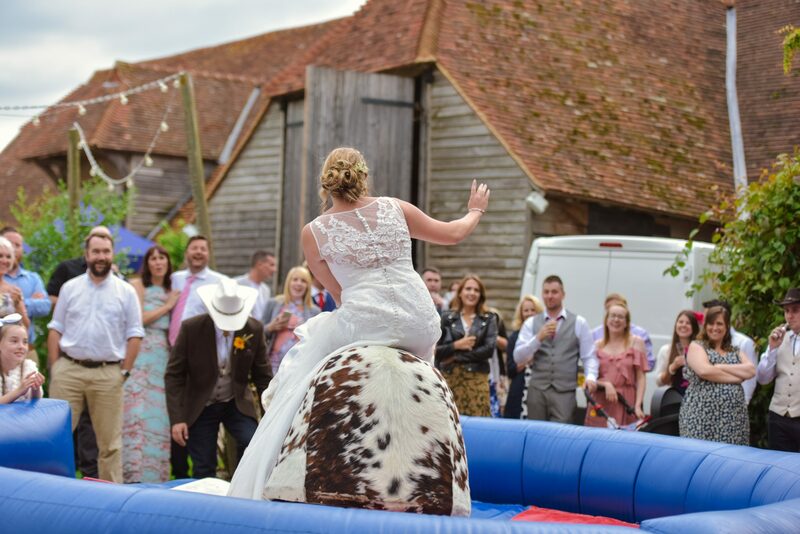 From the second that we met Ellie and Mike (now Mr. & Mrs. Spencer) we knew that they had a certain style, real attention to detail and an eye for wowing the crowd. 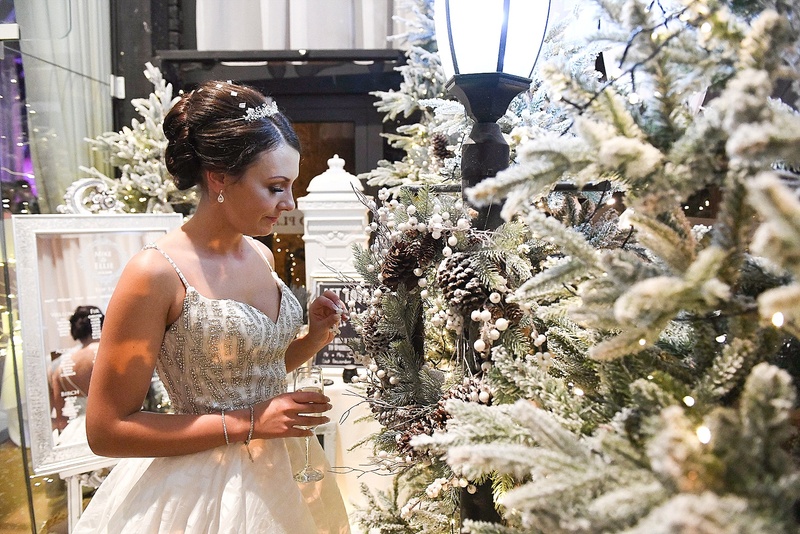 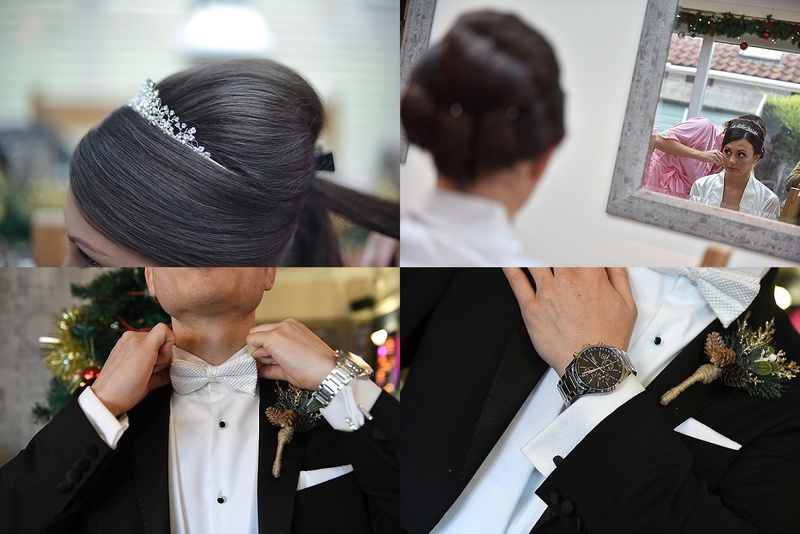 Word on the ‘wedding Grapevine’ amongst fellow wedding suppliers had started whispering of Lamp posts, Christmas Trees, bejewelled table centres and stylish Dinner Jackets. 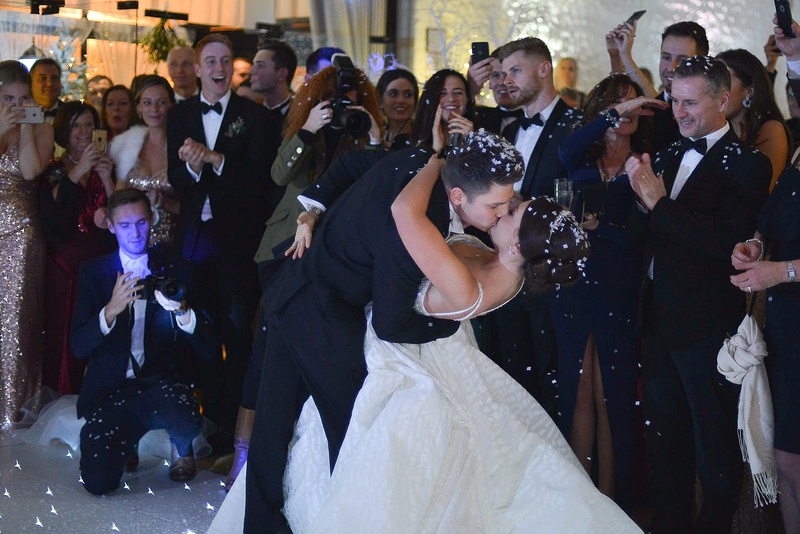 It’s fair to say that we were all looking forward to this one – our last of 2018. 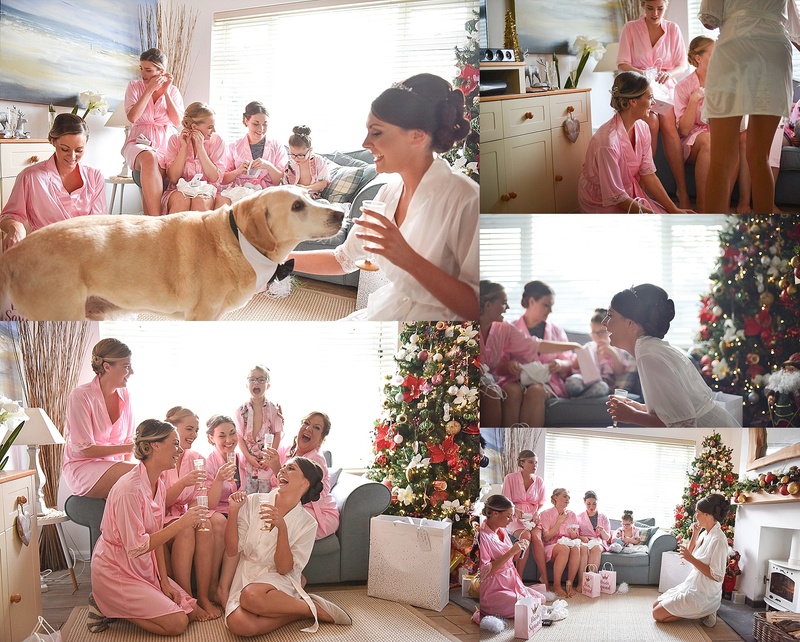 The big day arrived and Julie dropped into meet the Bride and her six Bridesmaids where a Christmas Tree and bags of goodies awaited each of them. 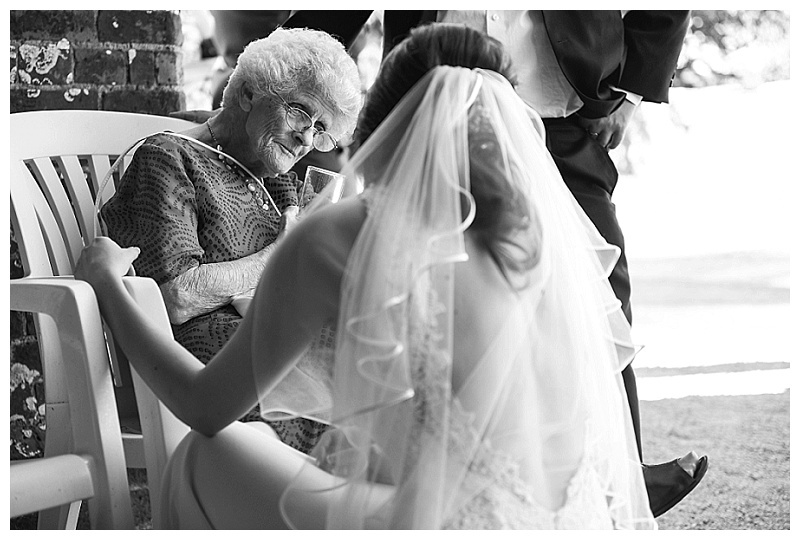 Ellie looked radiant, even before her hair and make-up was done, but then she always does. 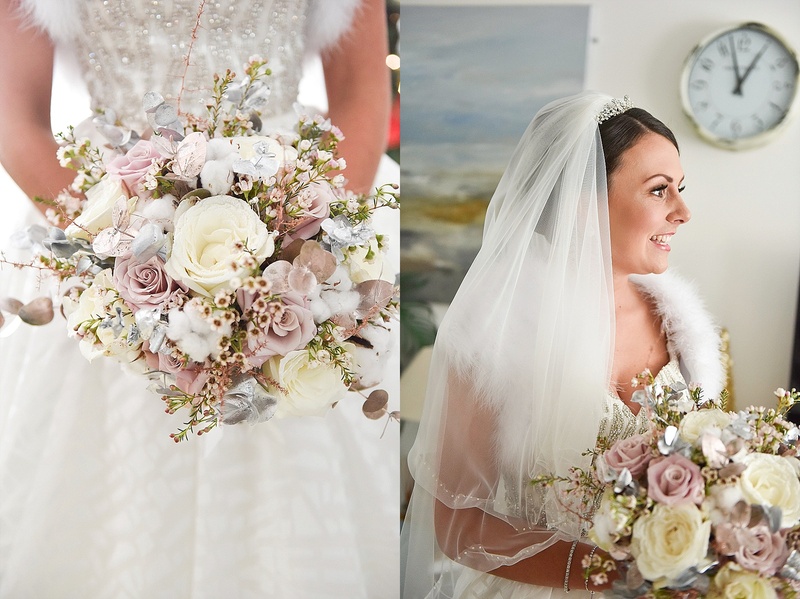 When she was prepared by her team and wearing her dress she took her gorgeous bouquet provided by Flowers4 and walked in to see her Dad who had been waiting nervously for her in the other room. 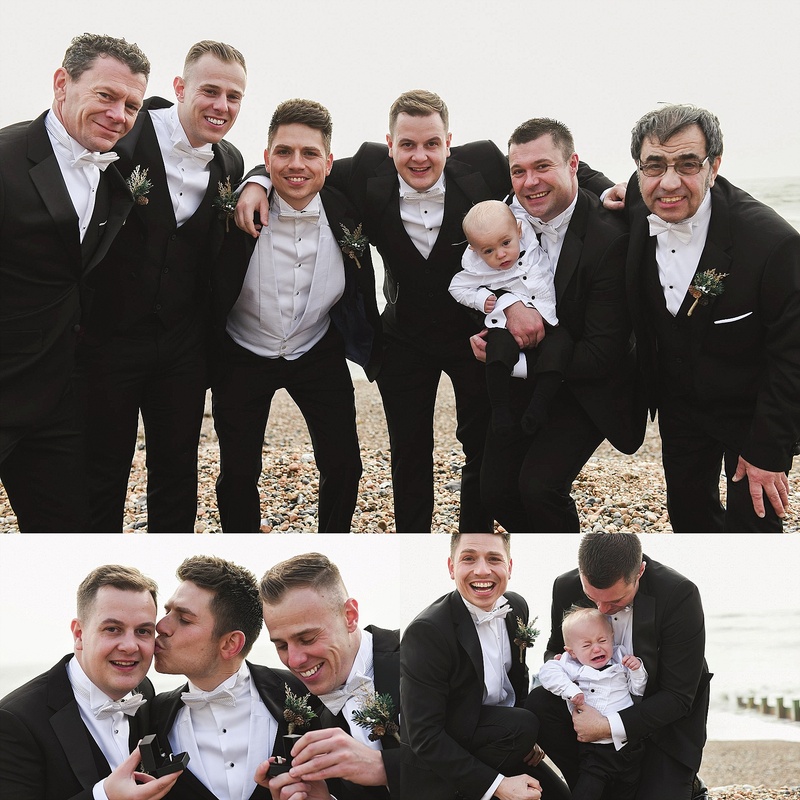 Rod dropped in to Mike and his Groomsmen (six counting the Dads) all dressed in fabulous Tuxedos with white bow ties. 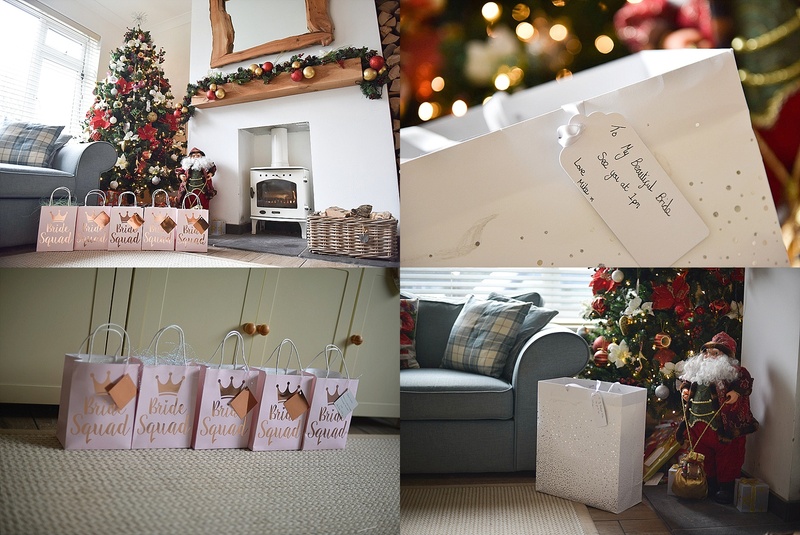 Their wedding day was underway and many, many presents were exchanged! 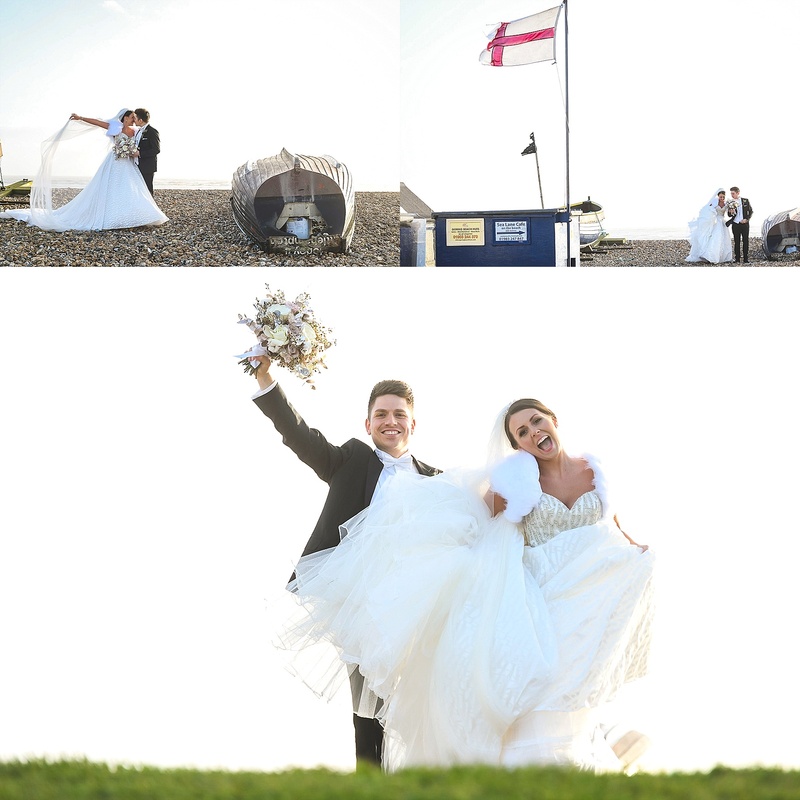 Then to St. Marys Church by the seaside in Worthing. 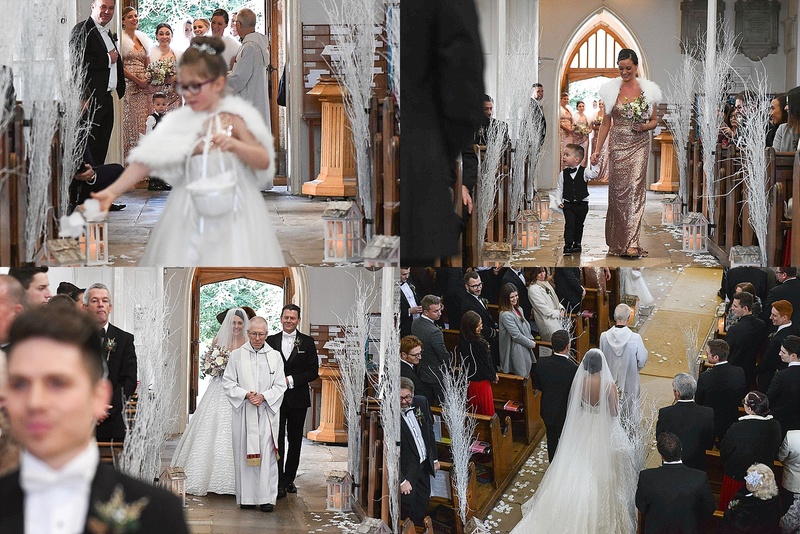 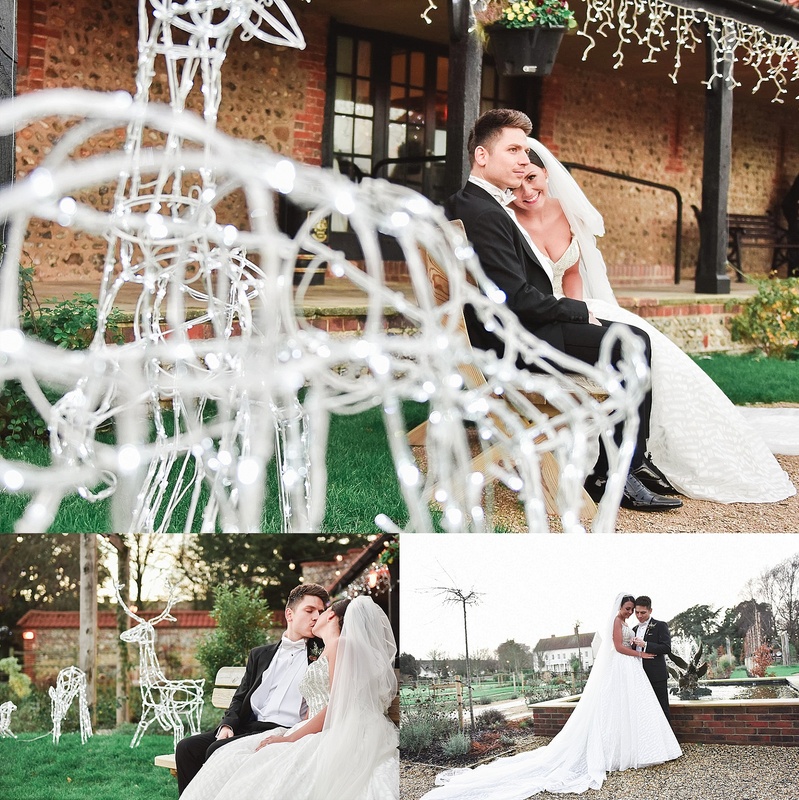 This was a real fairy tale setting and just perfect for their wedding, and, of course, a huge Christmas tree took centre stage. 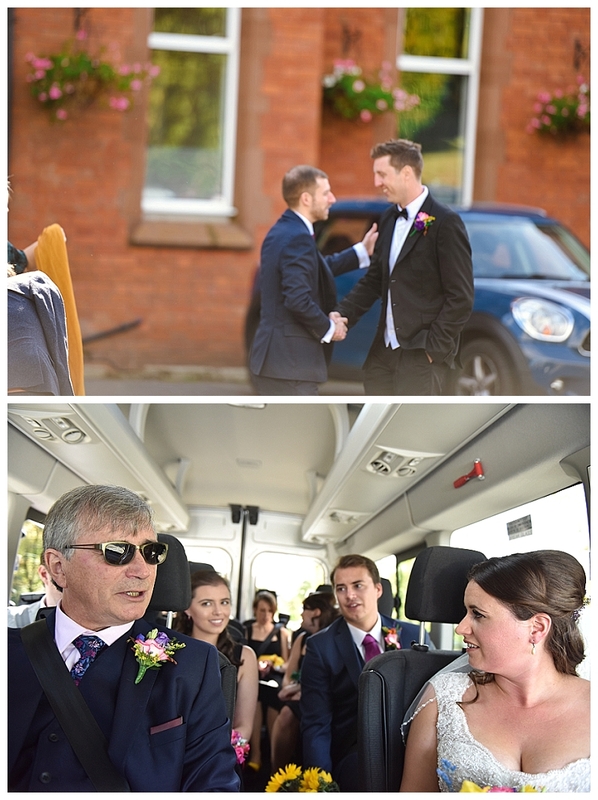 Ellie arrived suitably and traditionally late and the nuptials began. 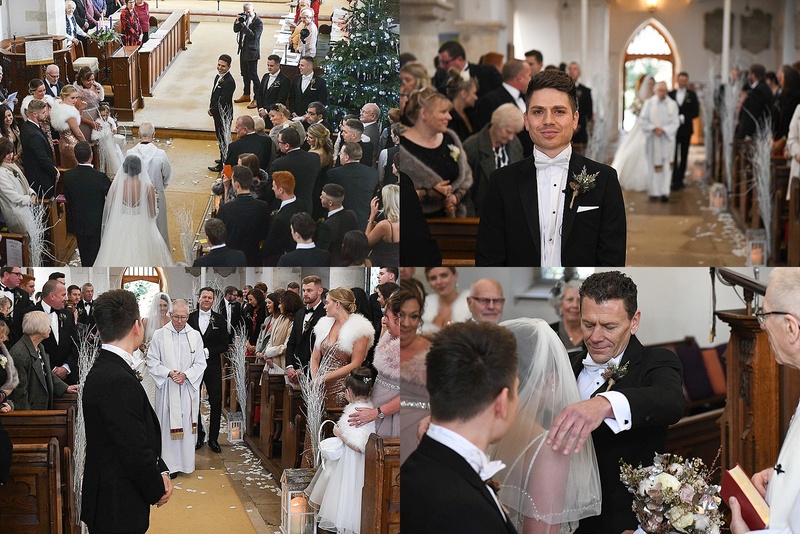 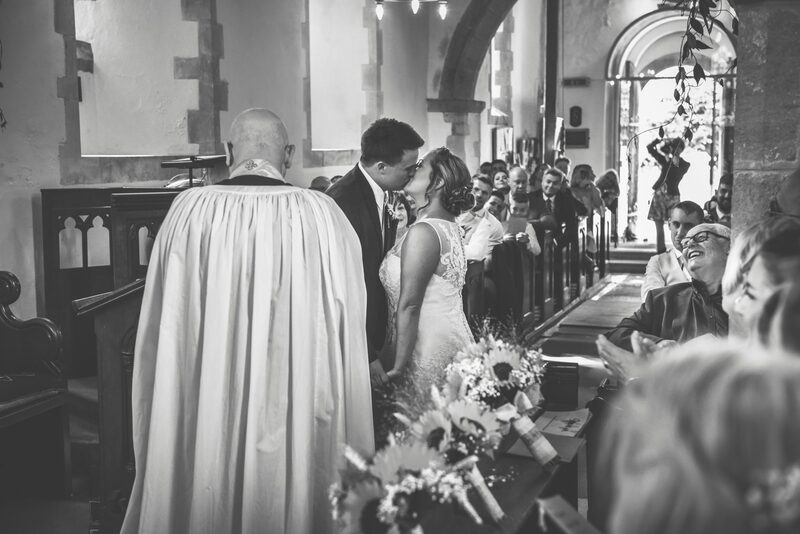 Our cameras caught Dad shedding a tear along with a few members of the congregation and everyone’s neck hair tingled and goosebumps fizzled when the Choir began to sing – for this was no ordinary choir but one straight from the movies! 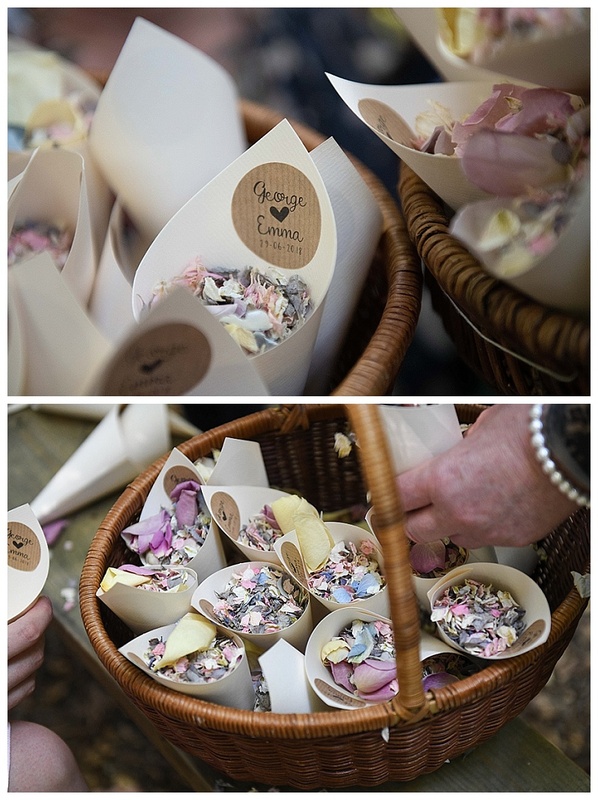 Confetti of course, and lot’s of it! 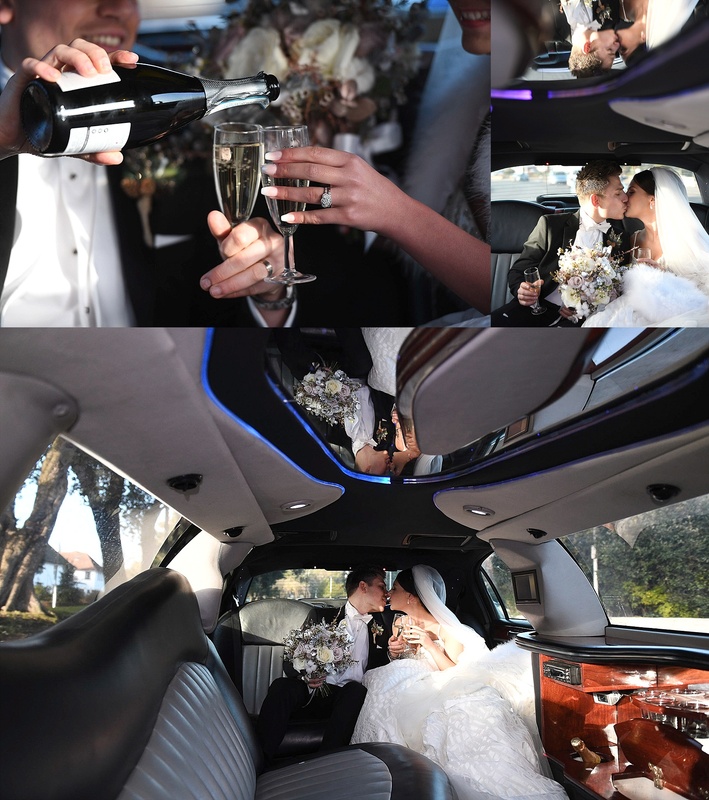 After the service the couple slipped into a stretch limousine and, with their trusty photographer, headed down to the beach for some chilly, windswept, veil whisking photographs before heading off to their reception. 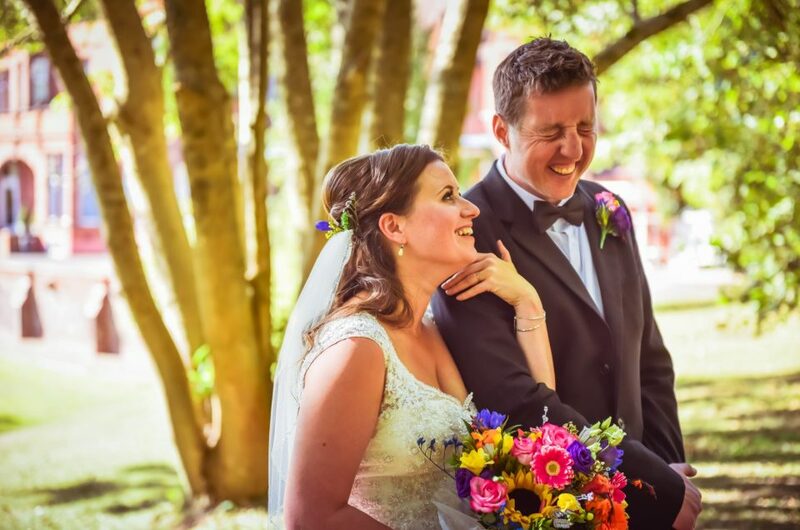 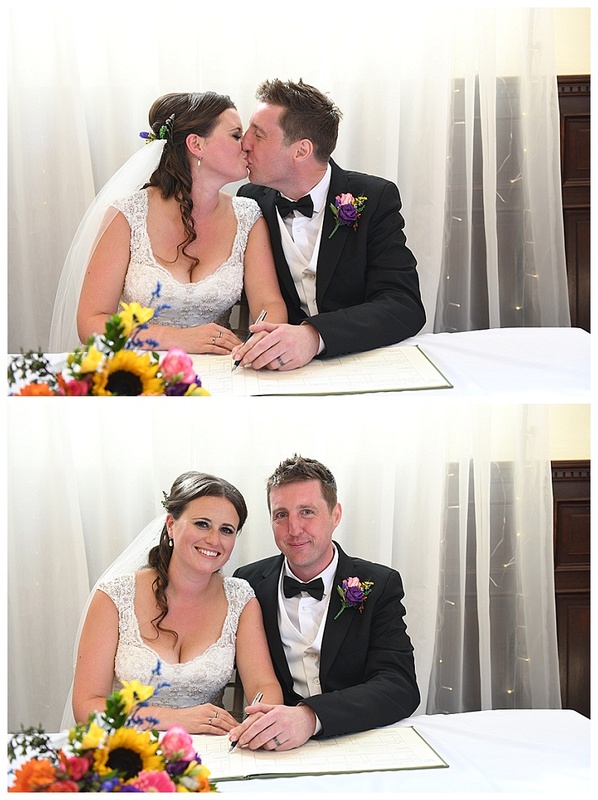 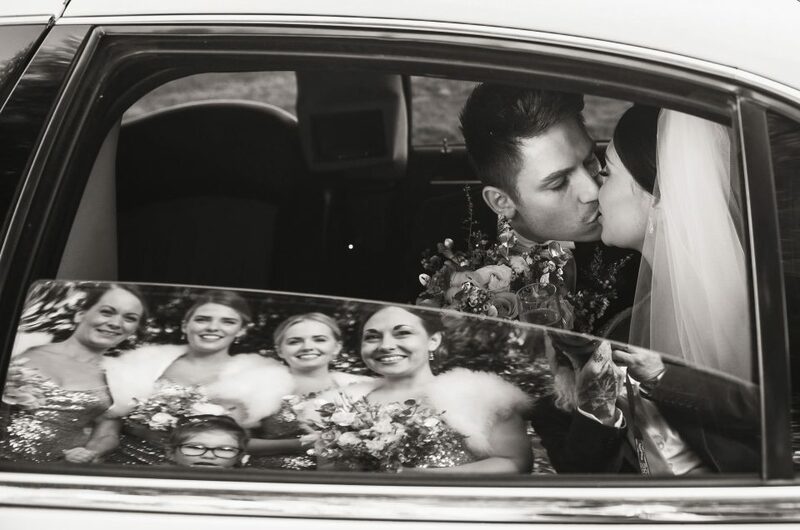 Ellie and Mike were greeted by the amazing staff at Field Place where this photographer witnessed a beautiful caring moment where Amanda (their coordinator) opened their car door and the look on her face when she saw them was pure delight! 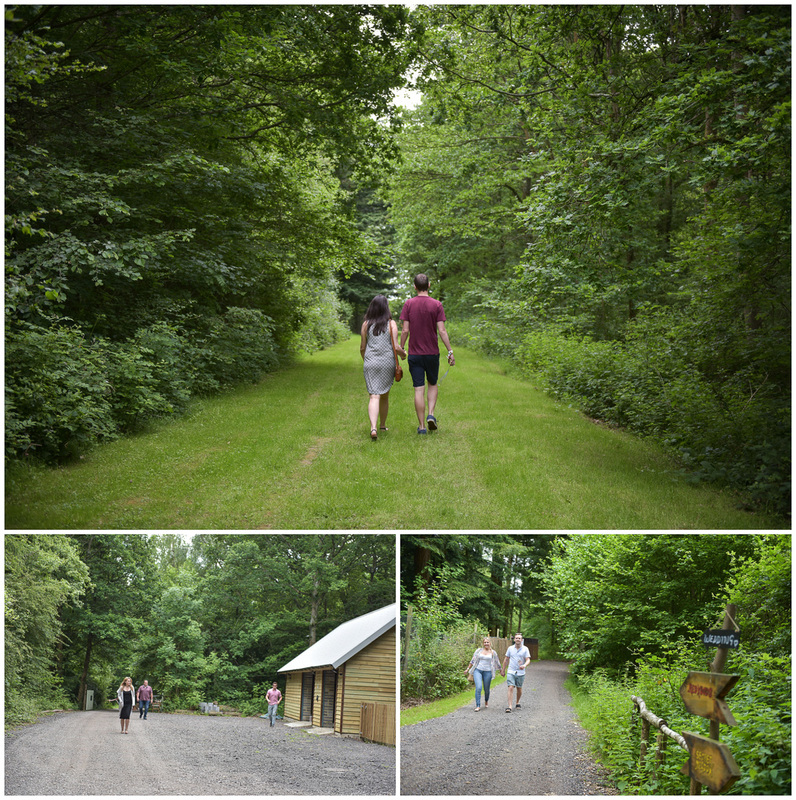 After a few photographs with Friends and Family on the new courtyard, Amanda showed them to one of the two Barns that would host their day. 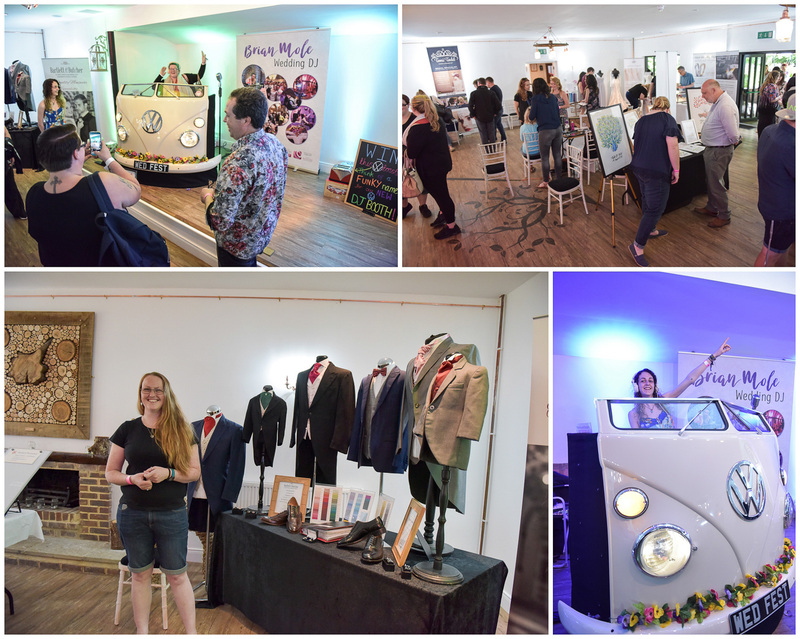 This is where all of the hard work, planning, reading magazines, saving, practising and downright creative juice melting all came into play. 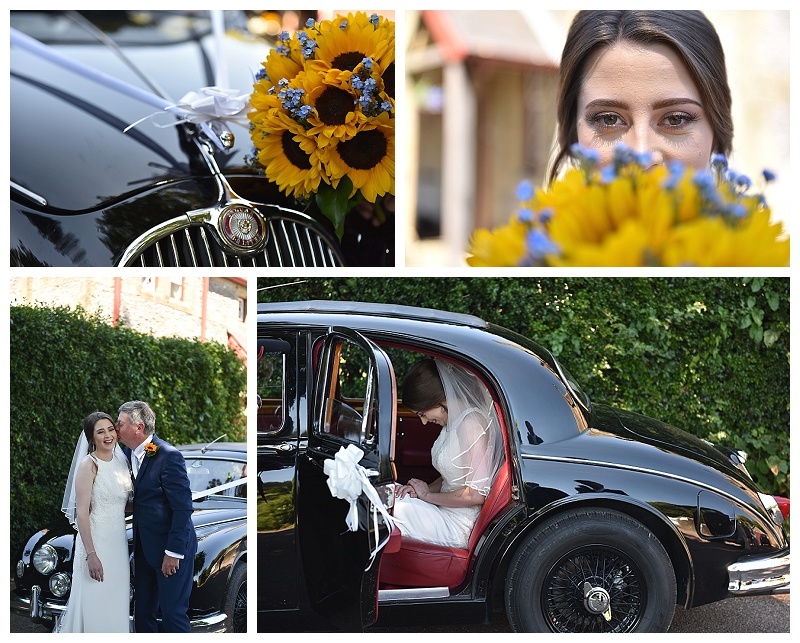 As, the doors swung open and the couple came face to face with their dream beautifully bought to life by the very clever and lovely people at Hire Your Day. 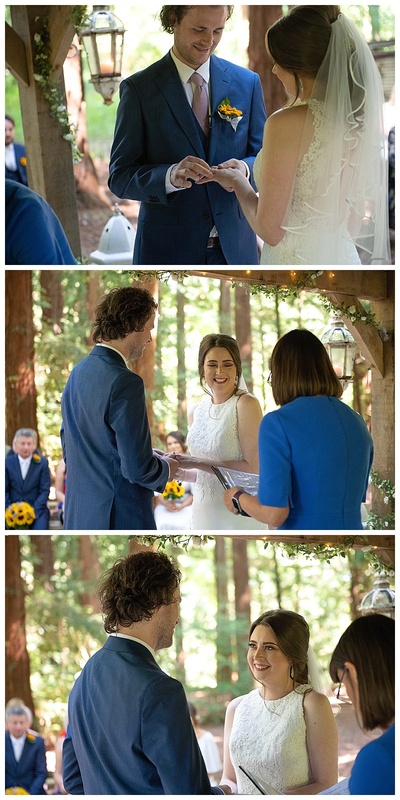 Of course everybody cried. 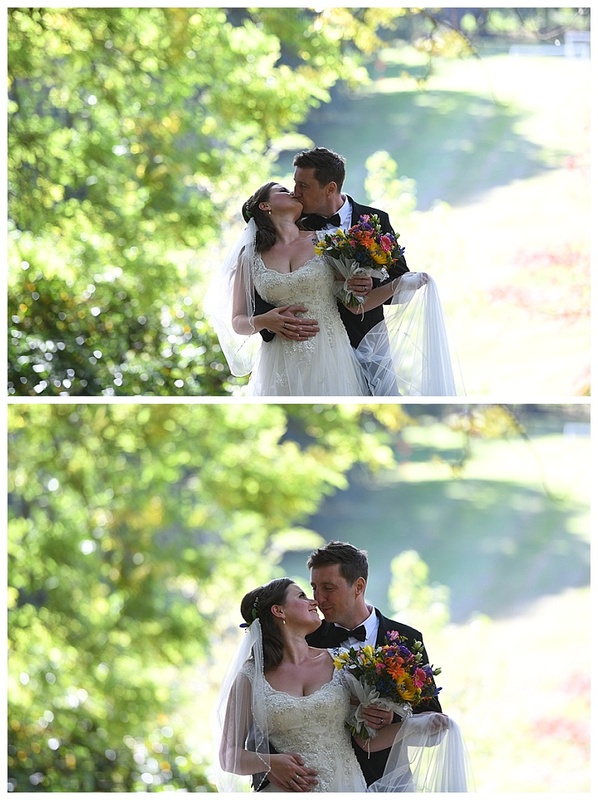 It was just too beautiful not to. 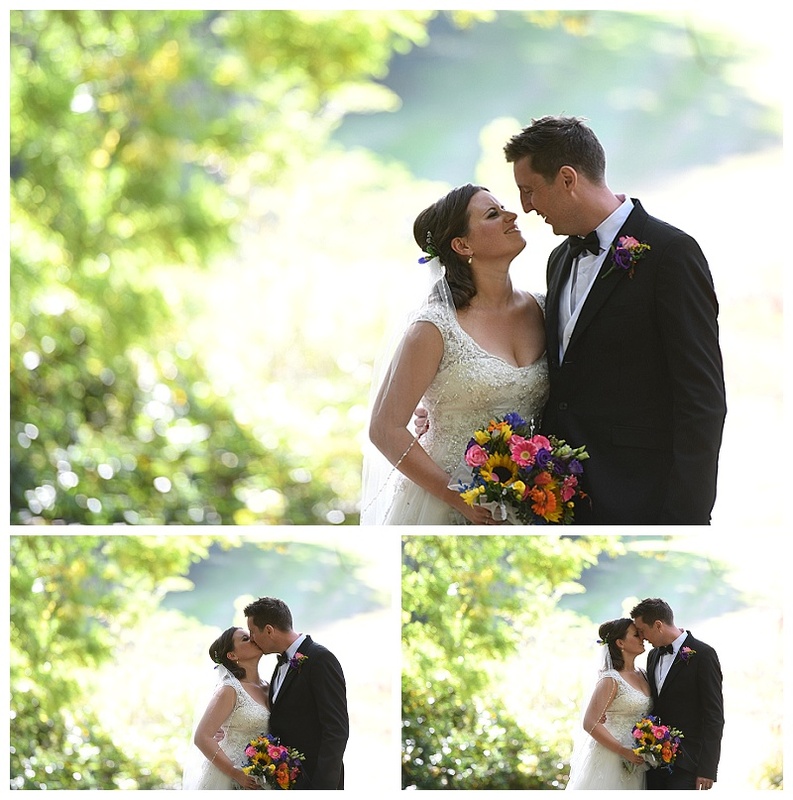 Ellie and Mike had a sneaky kiss under the Mistletoe and the couple walked around their room. 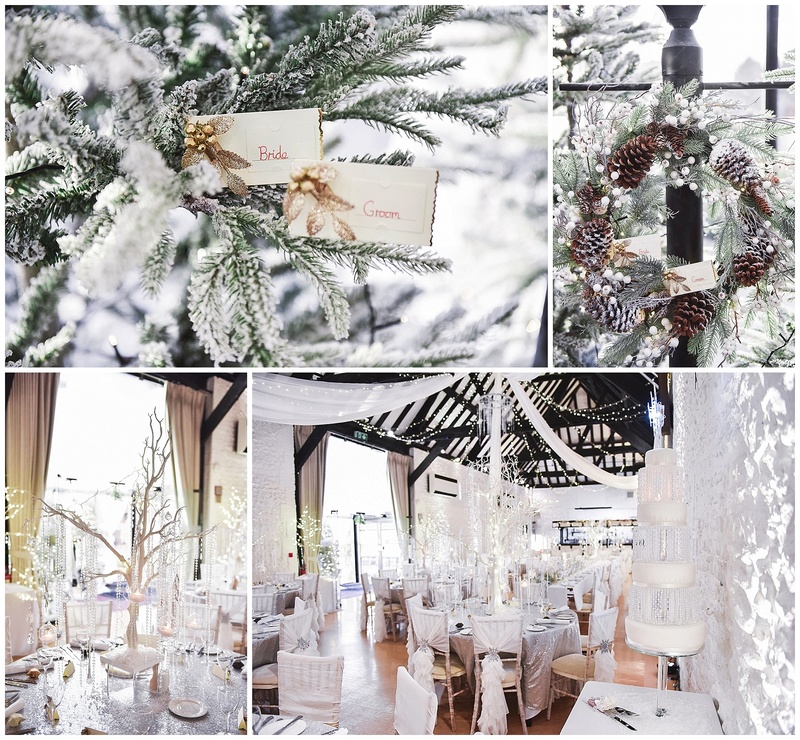 So many Christmas trees and vintage lamp posts covered in snow. 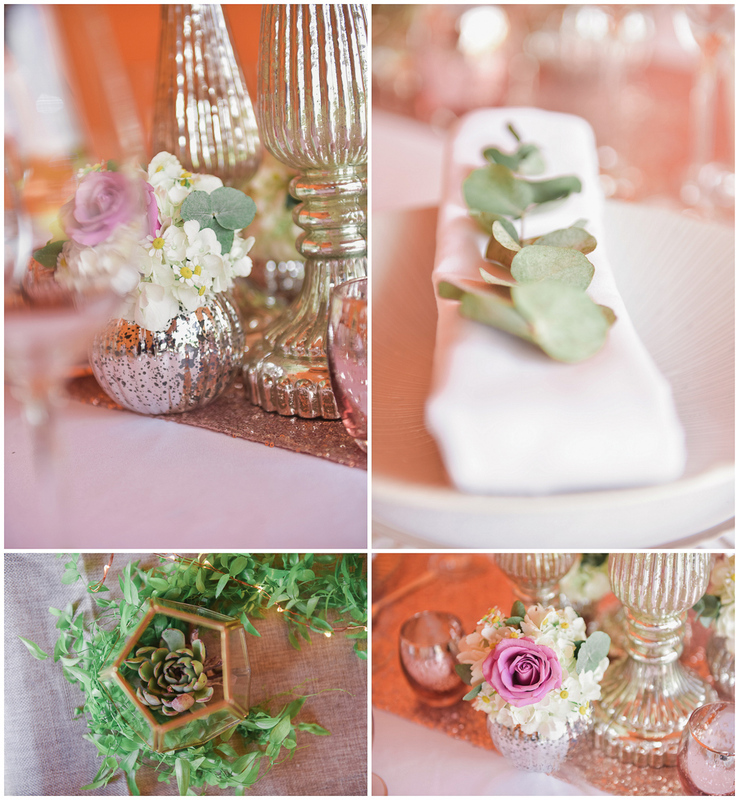 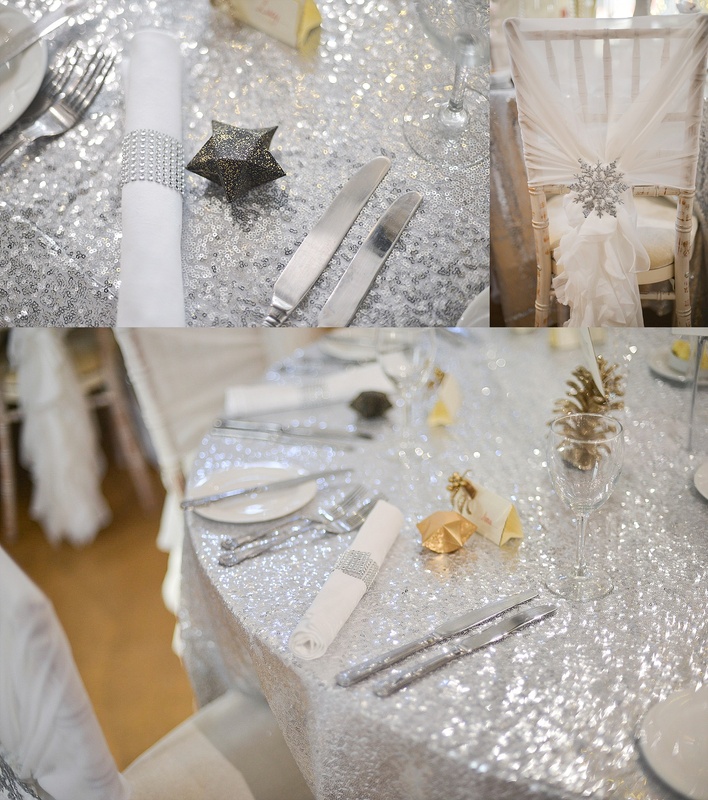 Stunning white tables all set with sequins and little trees adorned with jewels. 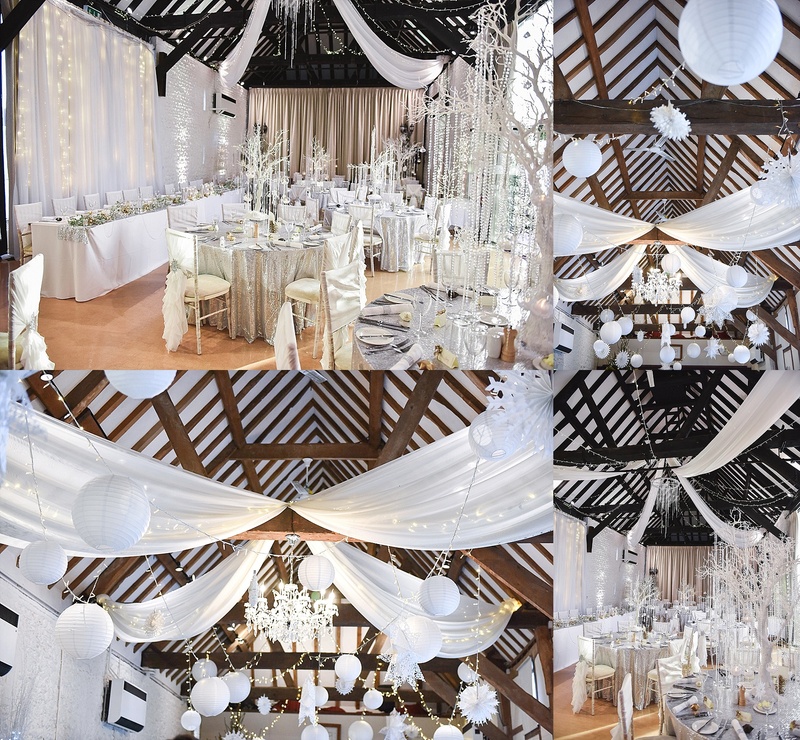 Giant snowflakes and drapes hanging from the ceiling and so many twinkly, sparkly lights that you couldn’t help but gasp with joy. 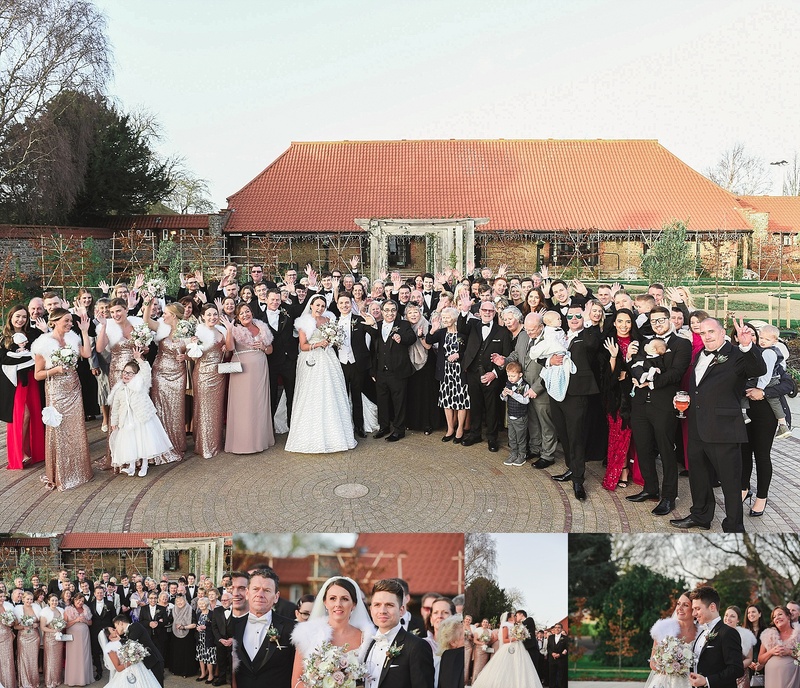 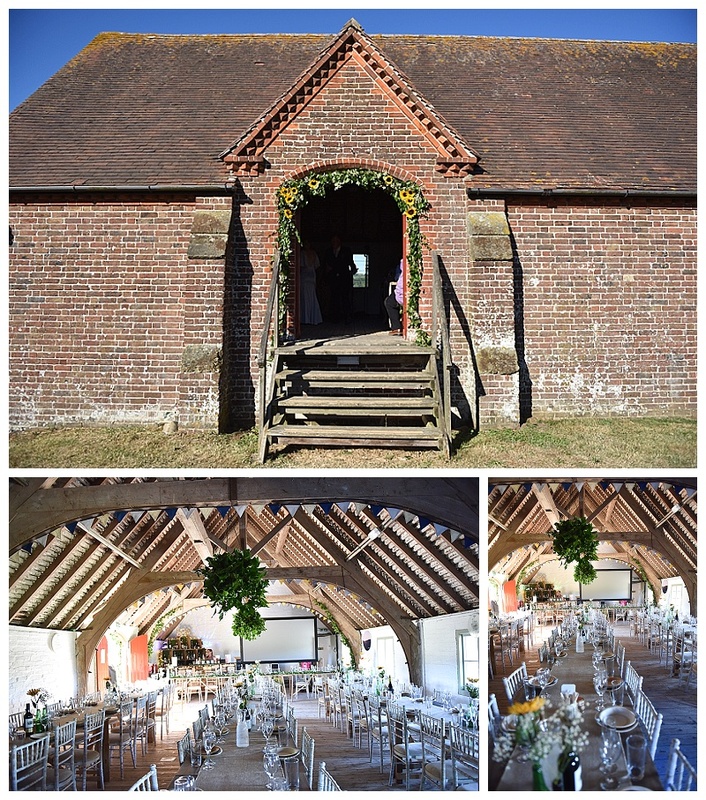 It was cold outside and the guests were whisked into the Pavilion Barn for canapes and drinks. 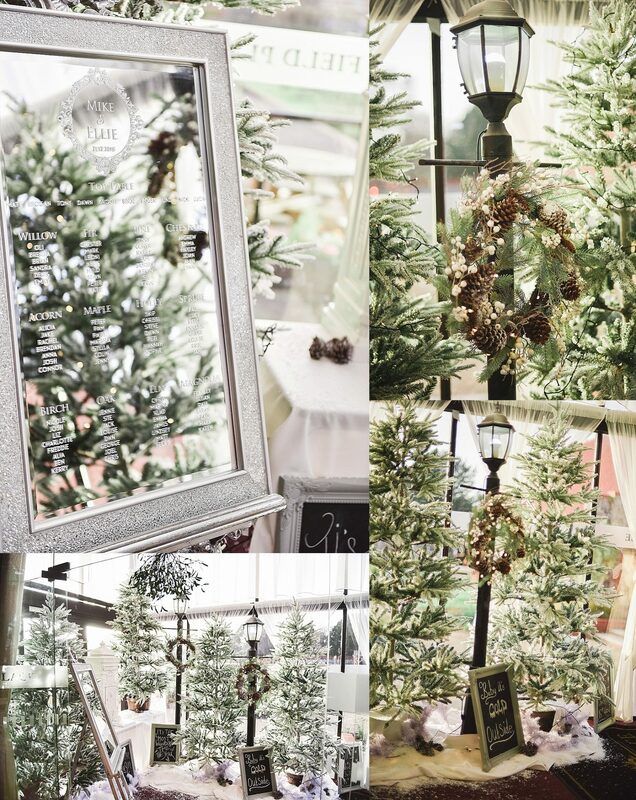 That too had a huge Christmas tree and lot’s of matching decor. 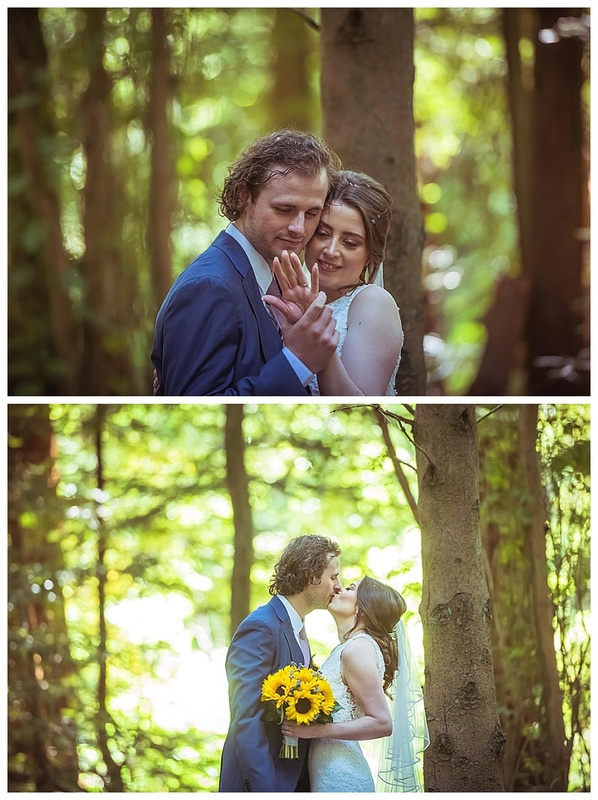 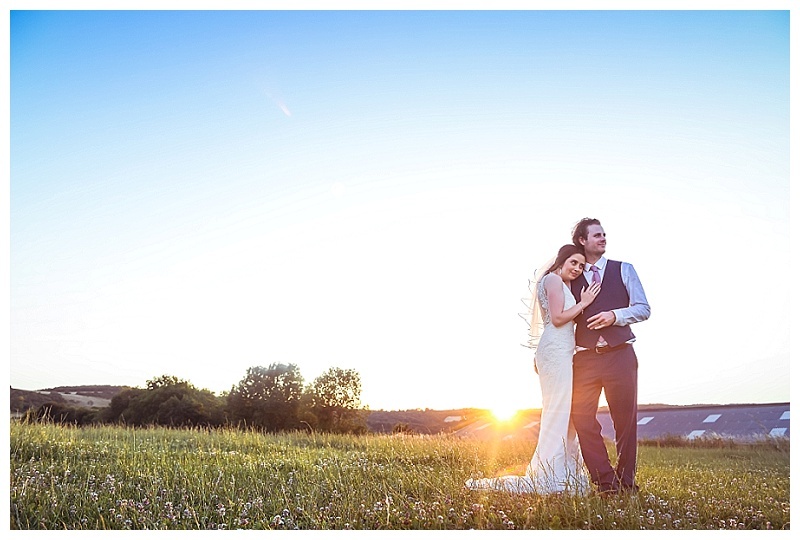 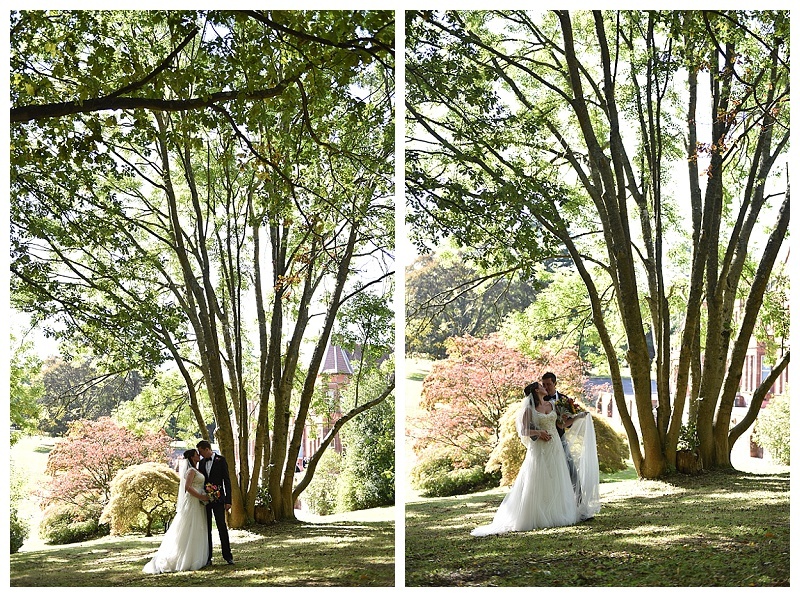 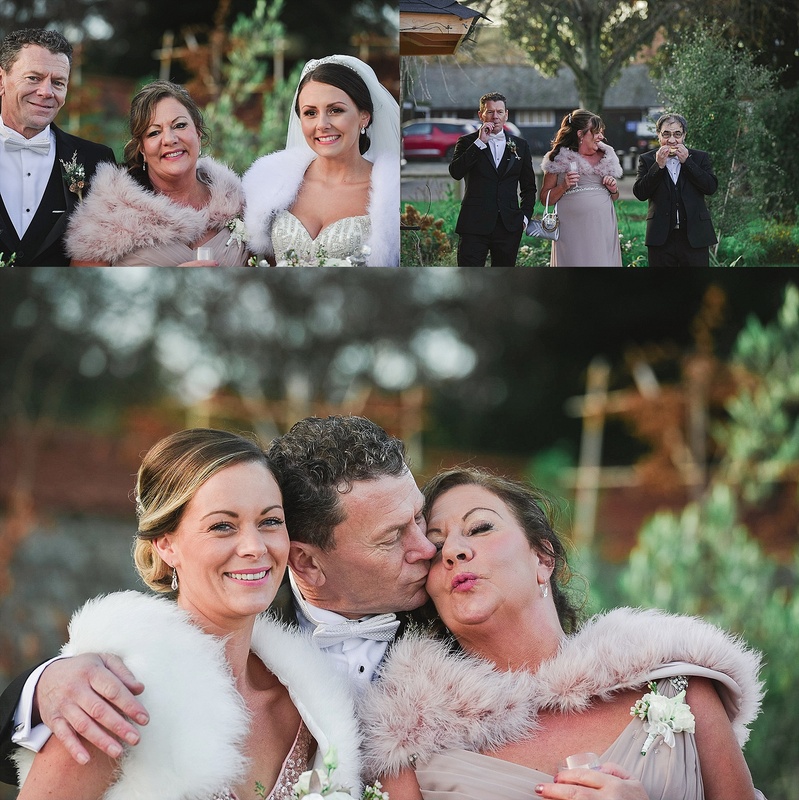 After some mingling, hugging and hand shaking we managed to sneak the couple off for a few shot’s around the grounds where they had a little practice of their First Dance – we had no idea (more later)!! 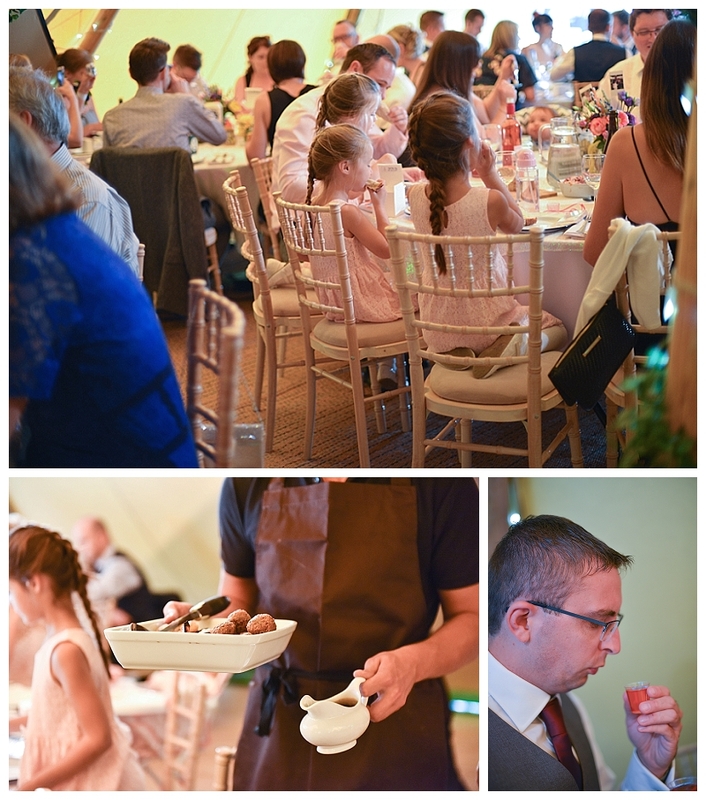 The food was , as expected, delicious and served hot and in apt style by the team at Hardings. 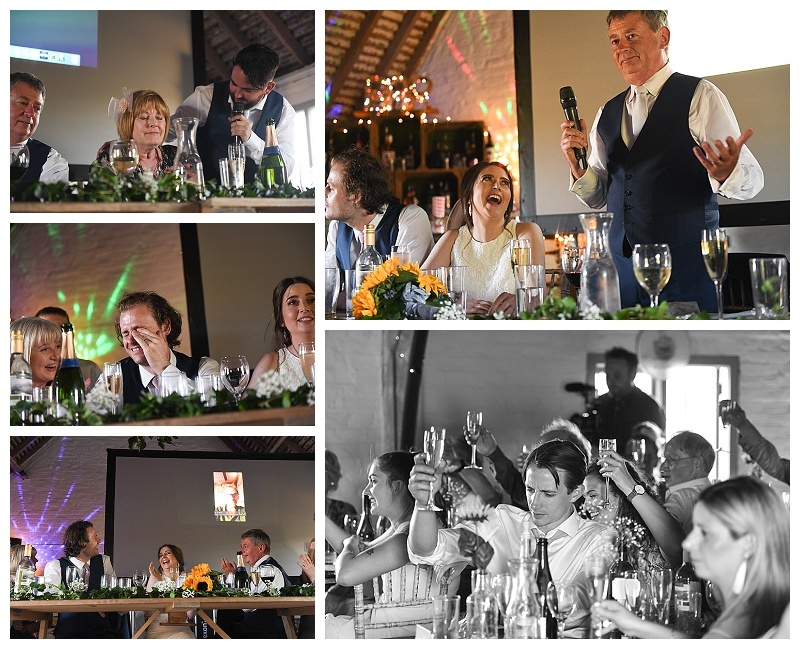 Then time for some of the best speeches that we have heard and so many tears that we , just maybe, had to join in with a few of our own (hidden behind the cameras we can just about get away with a wet nose). 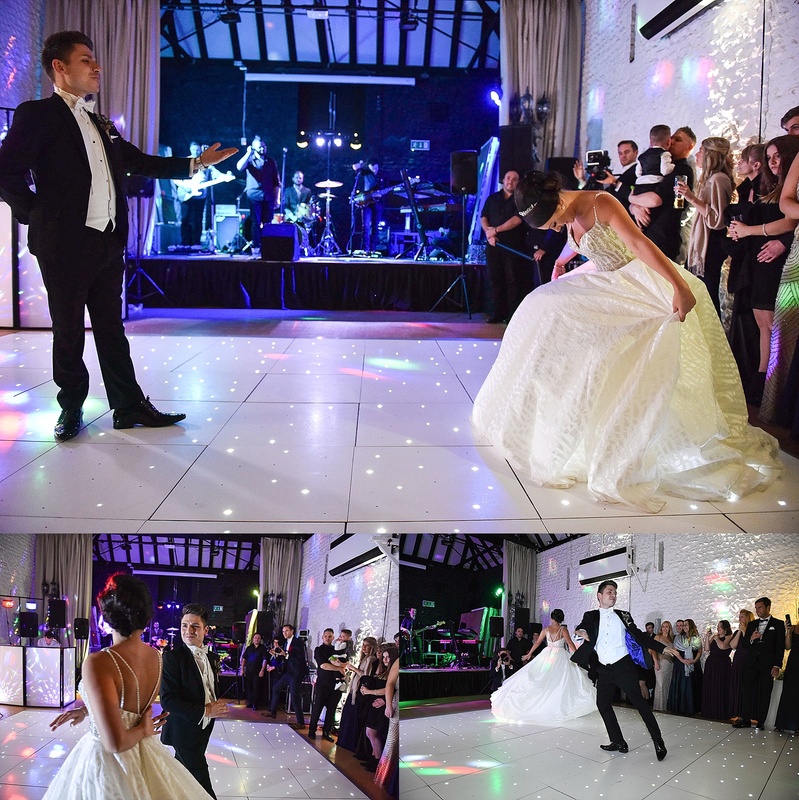 Darkness fell and we took photos of guests around the Christmas tree in the Pavillion Barn before heading in to see the main Barn transformed into a stunning evening setting with a lit up dance floor, coloured lighting and a huge stage ready to host one of our favourite bands and DJ’s. 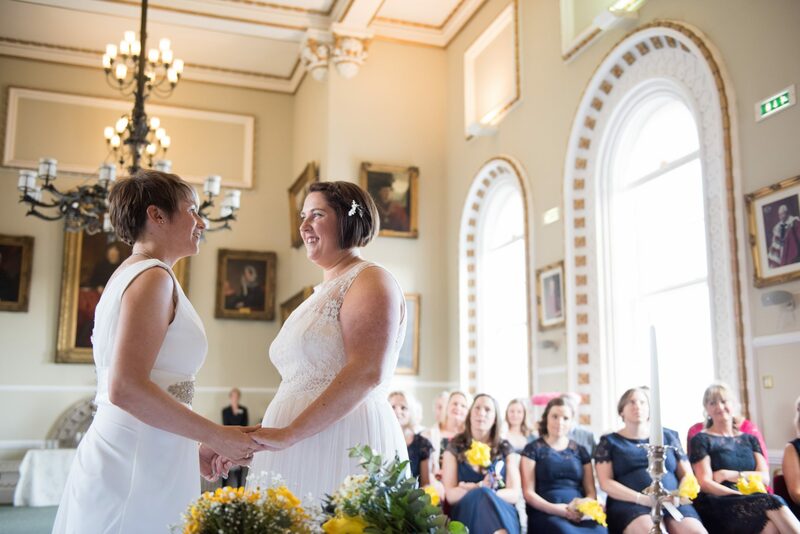 Guests were ushered through and you could almost cut the excitement with a knife as their eyes saw the room for the first time and echoed with gasps of amazement. 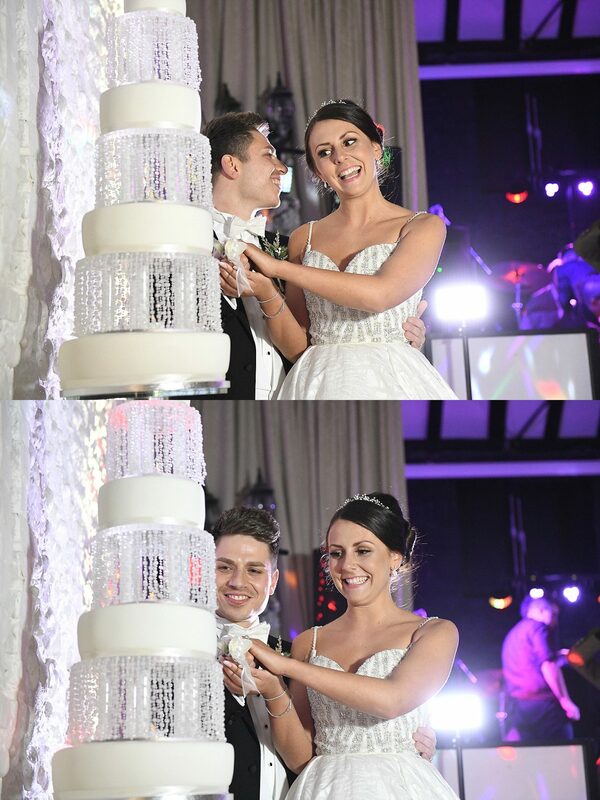 Time to cut the cake. 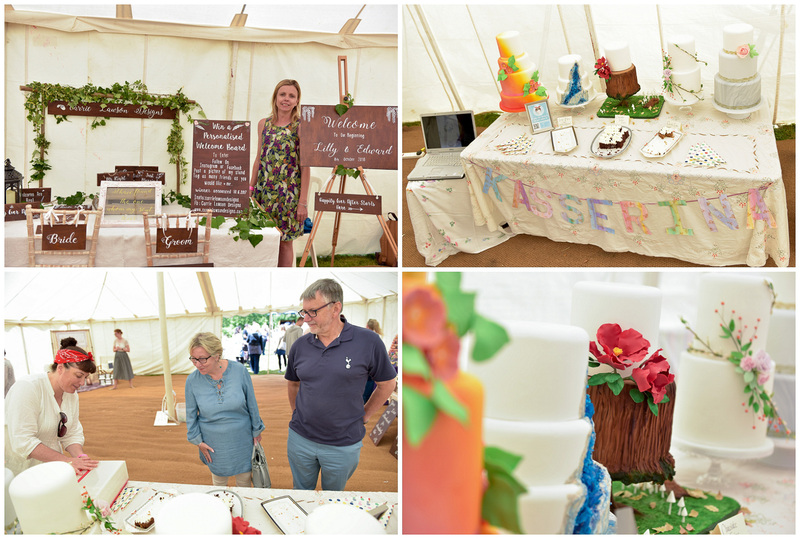 Not just any old cake but a huge 7 tiered cake adorned with sparkles, twinkly lights and topped with a large star – how it stayed upright we have no idea. 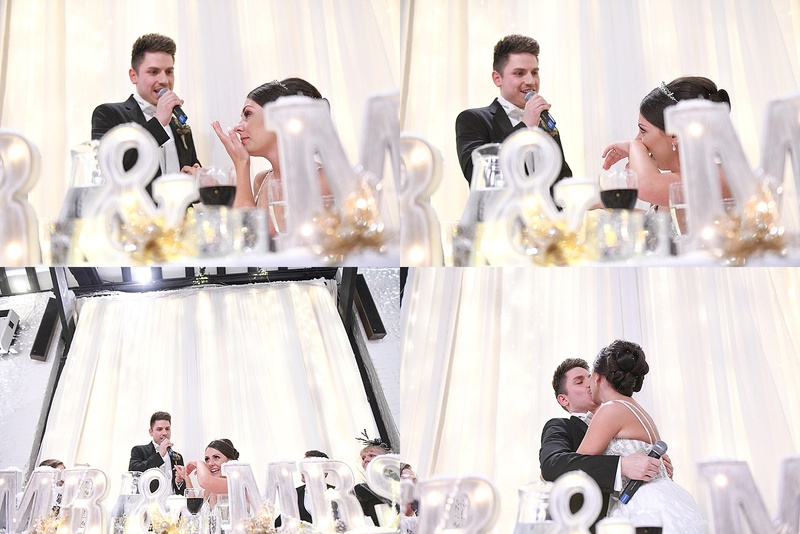 The DJ fired up the couples chosen song, the ballad from Beauty and the Beast, and Ellie and Mike danced and danced and lifted and twirled and curtsied and danced to the amazement and admiration of the whole room – for this was choreographed and practiced and put together with such detail that it could be televised for sure! 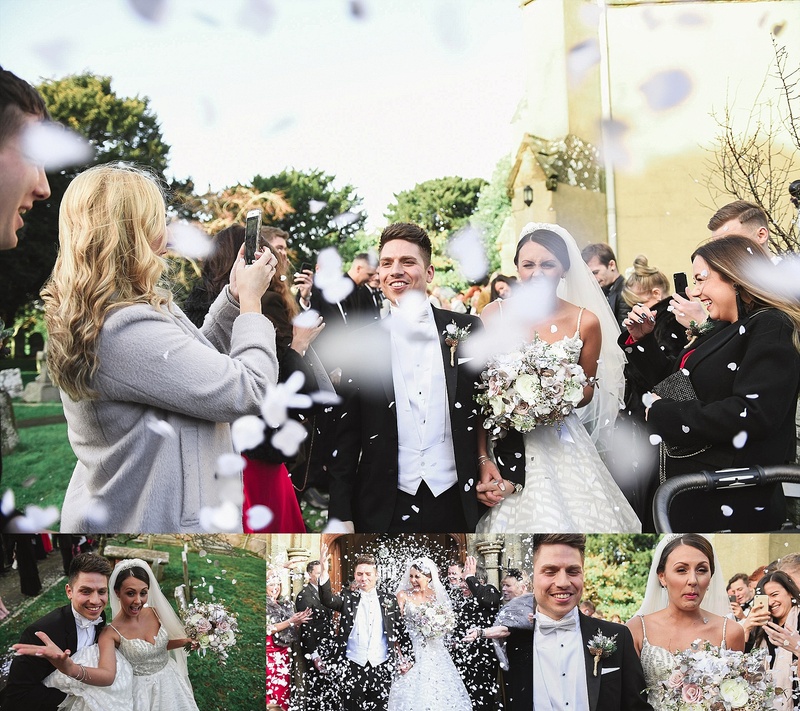 Confetti canons fired, the music cranked up and they danced even more as the crowd clapped and cheered. 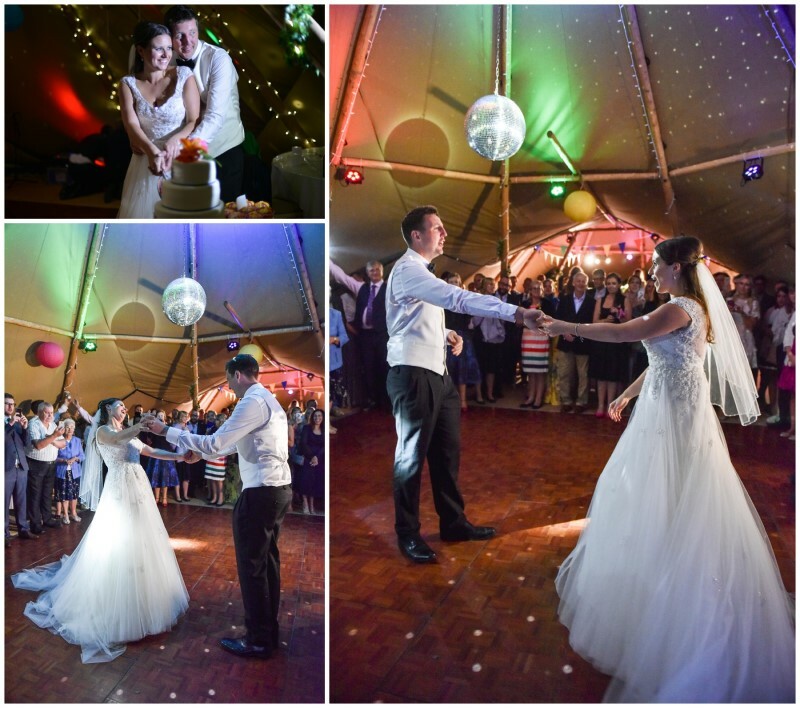 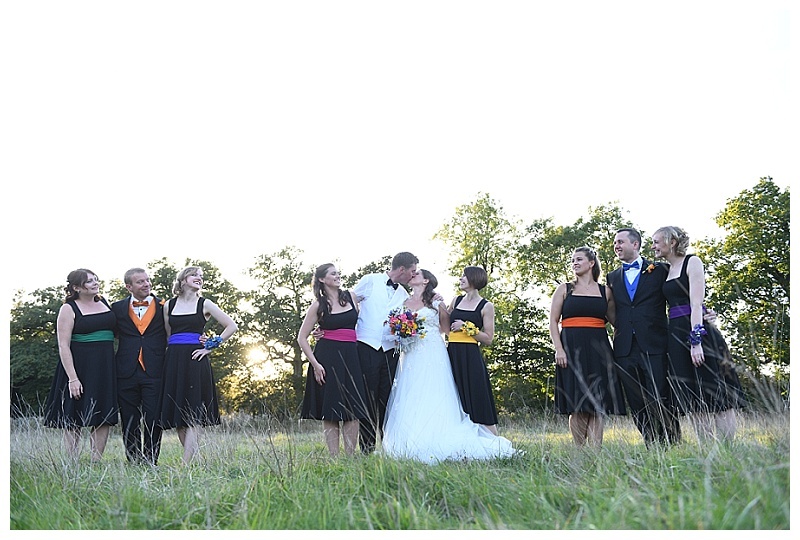 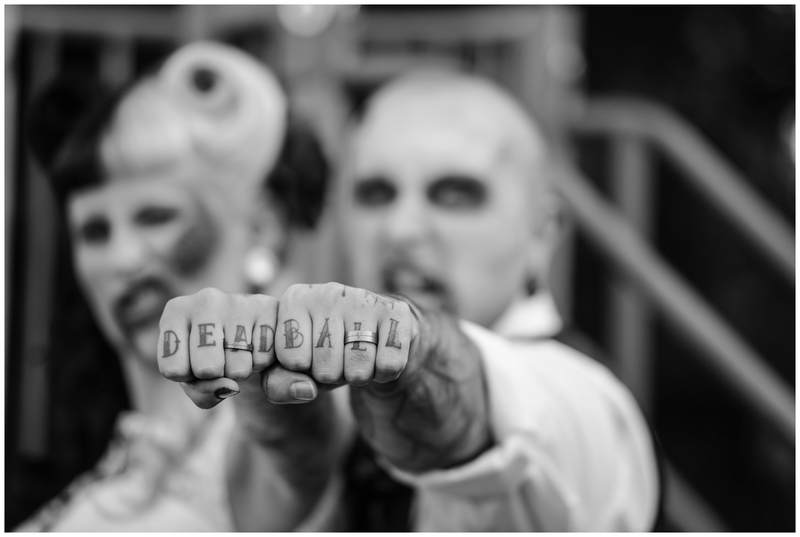 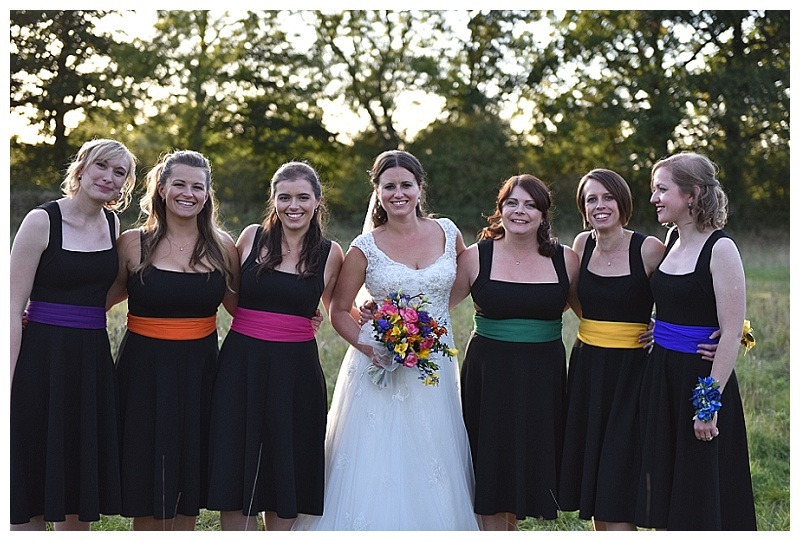 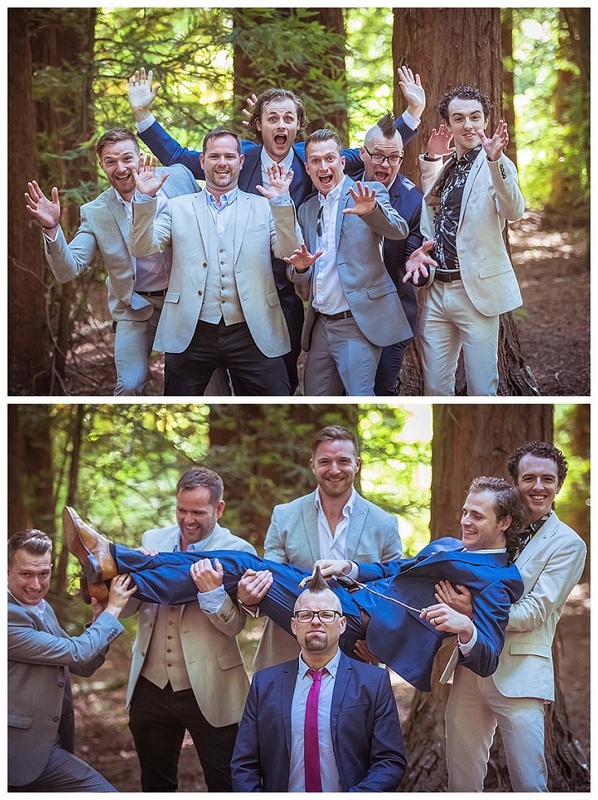 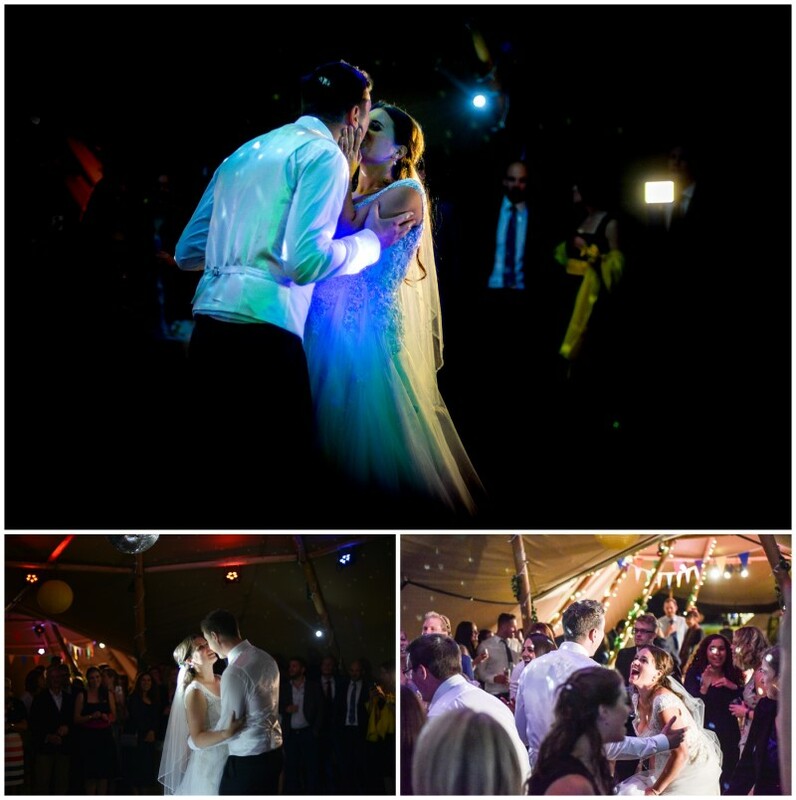 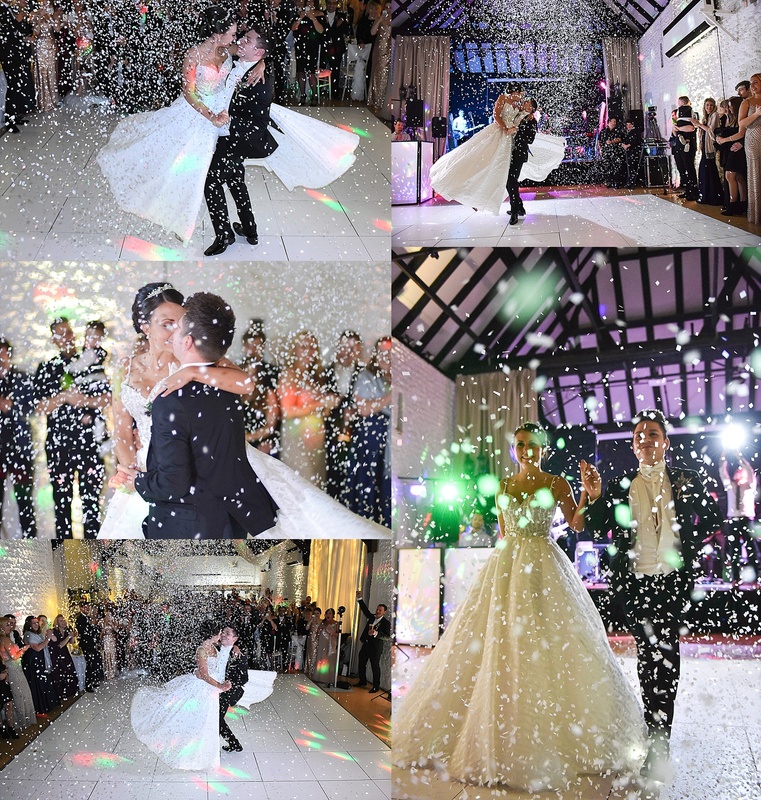 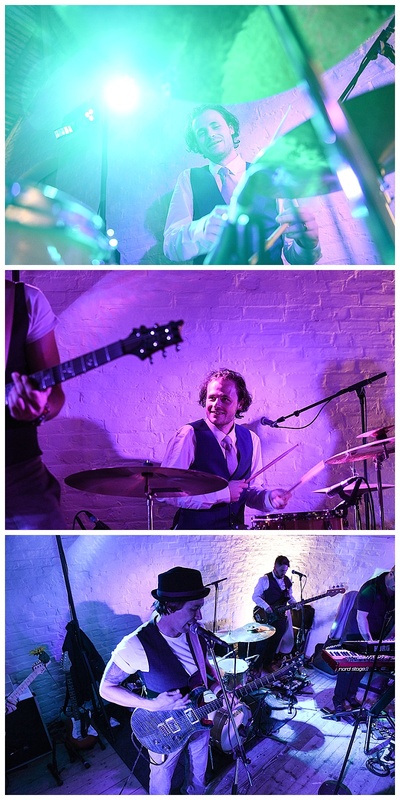 The band introduced themselves as Murdochs Crazy Eyes and shouted out ‘best First Dance – EVER!!! 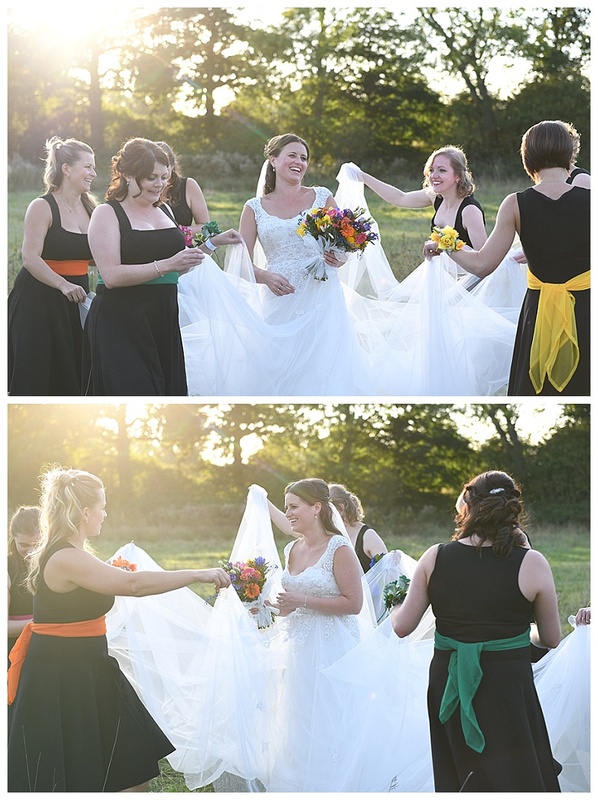 !’ to which we all clapped, nodded our heads and cheered in unison. 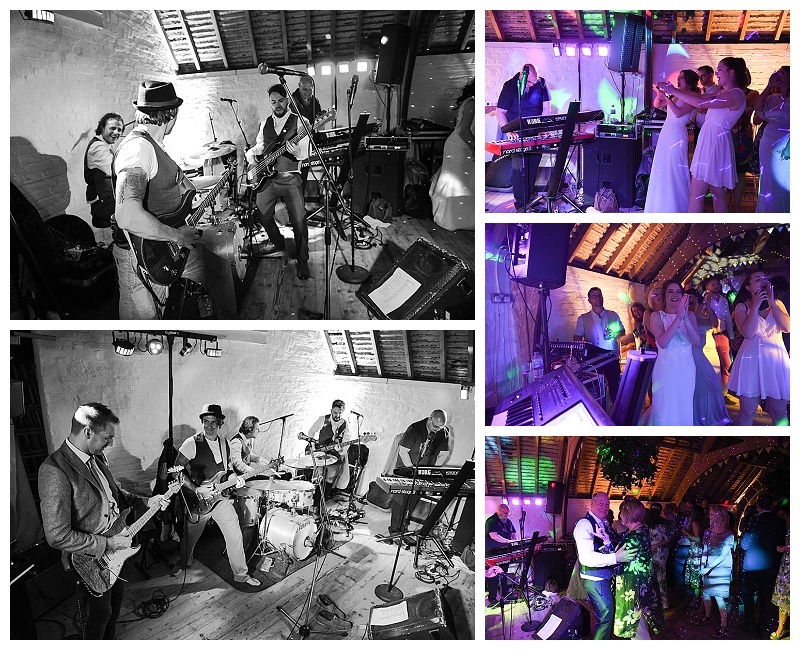 The Murdochs started their set which, as always, was awesome and nearly everyone was on the dance floor – fired up by the lead singers stage presence along with the on point instrumentals including a drummer that was one of our previous Grooms (see Emma and Georges wedding) – what a lovely surprise. 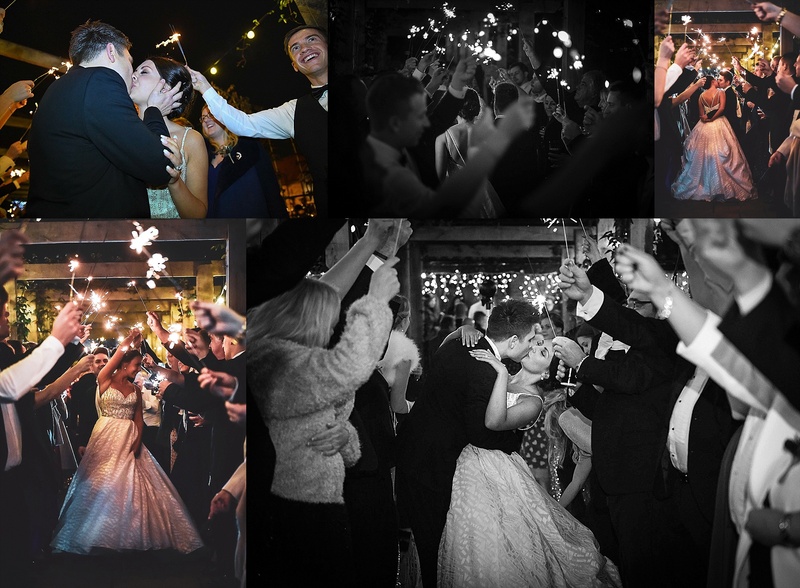 We waited until the band finished their first set and then had another surprise for the guests – hundreds of sparklers were handed out and we arranged a sparkler tunnel for the couple to walk through. 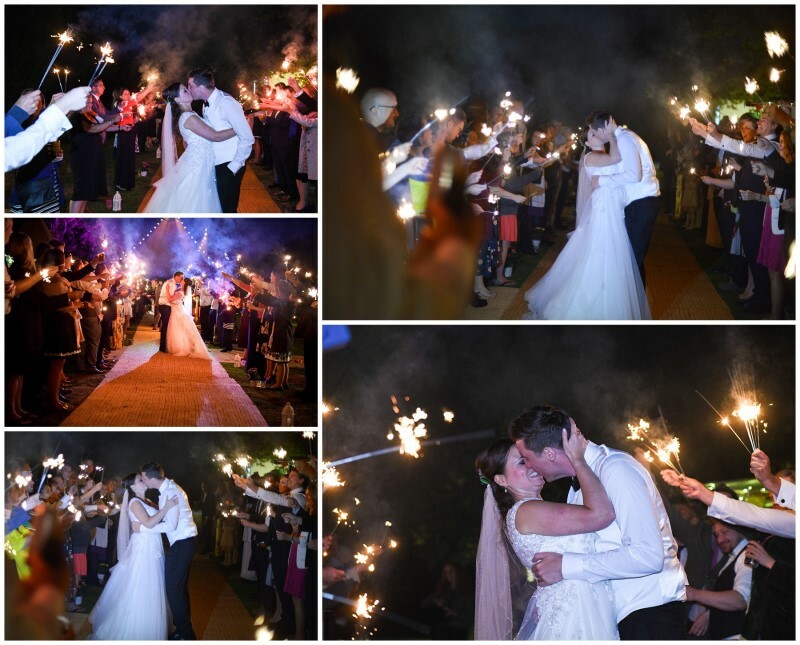 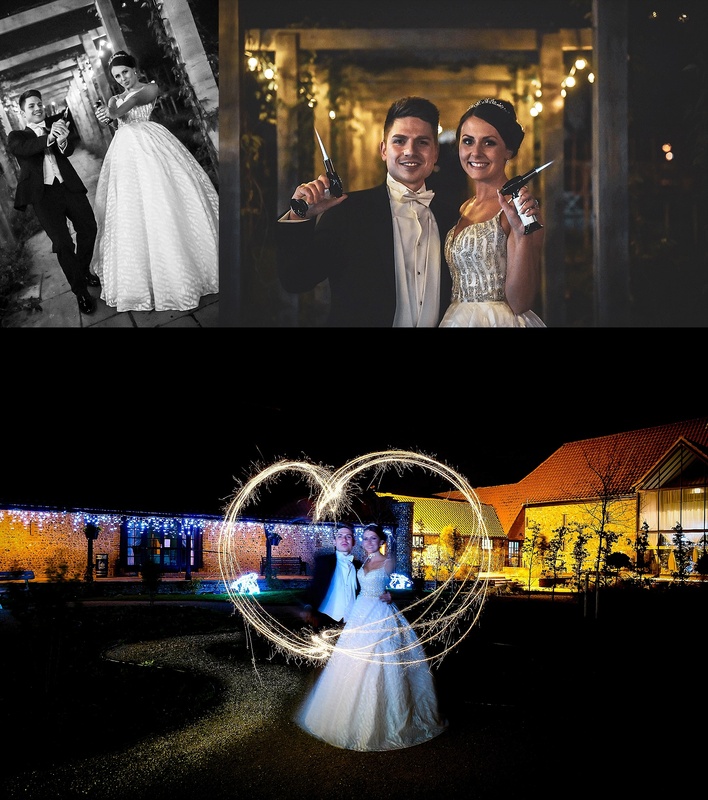 Sparklers always go down well, especially when the couple dance and kiss and spin amongst them (health and safety was of course monitored closely). 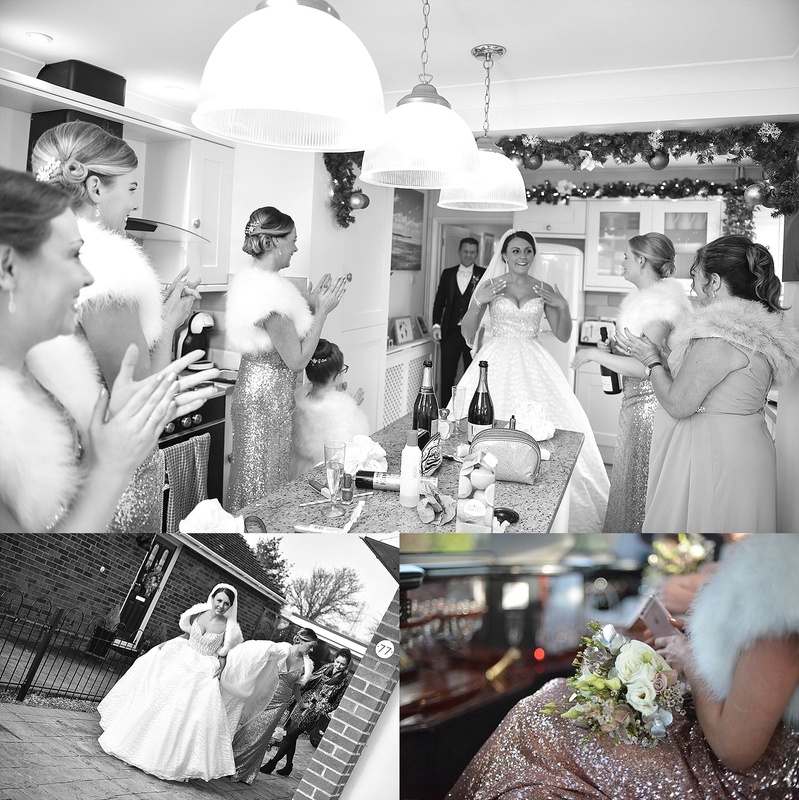 Finally the guests went back inside to dance some more, chat around the bar and play on the Magic Mirror and we said our farewells and slipped away into the cold night air, exhausted but very, very happy. 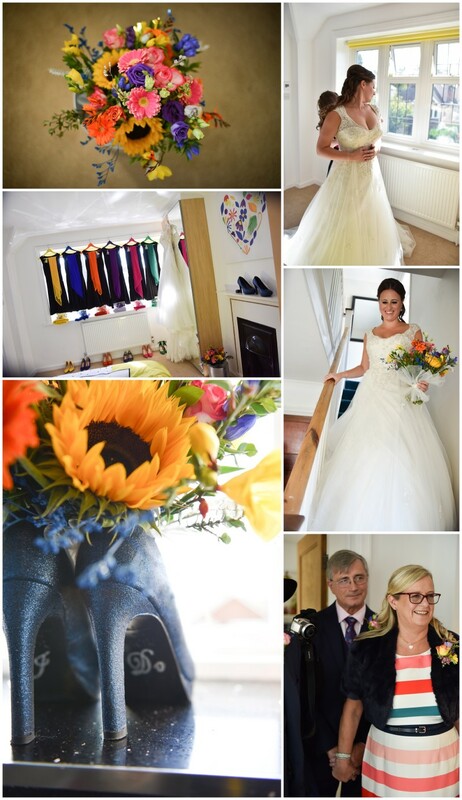 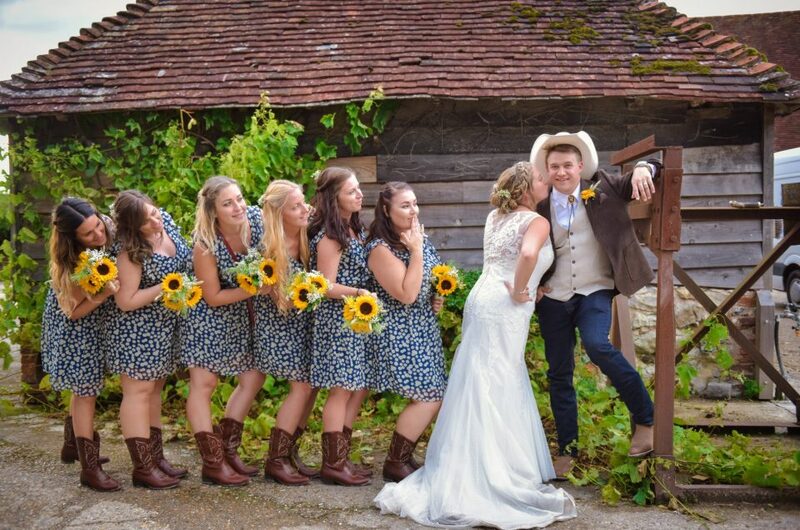 A rootin’ tootin’ hellava fine day was had by all as Ellen and Alex celebrated their big day yesterday. 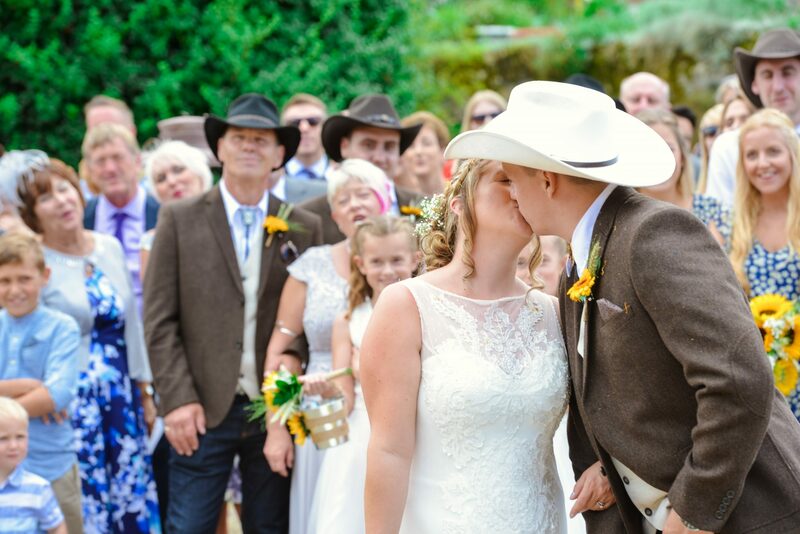 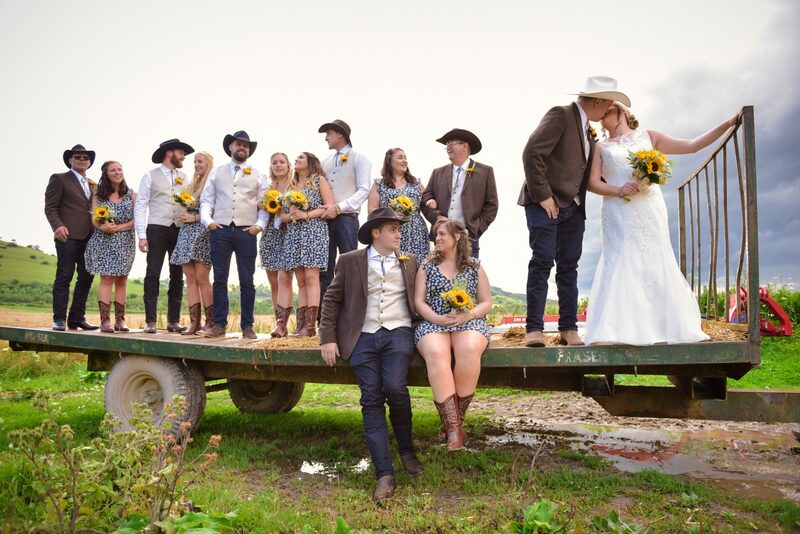 An ancient church, cowboys, cow girls, an americal horse with western saddle, a rodeo bull, beer flowing nicely, line dancing, a stunning barn packed to the beams with inspirational handmade decor, sunflowers a plenty and, of course, a beautiful gal and her man! 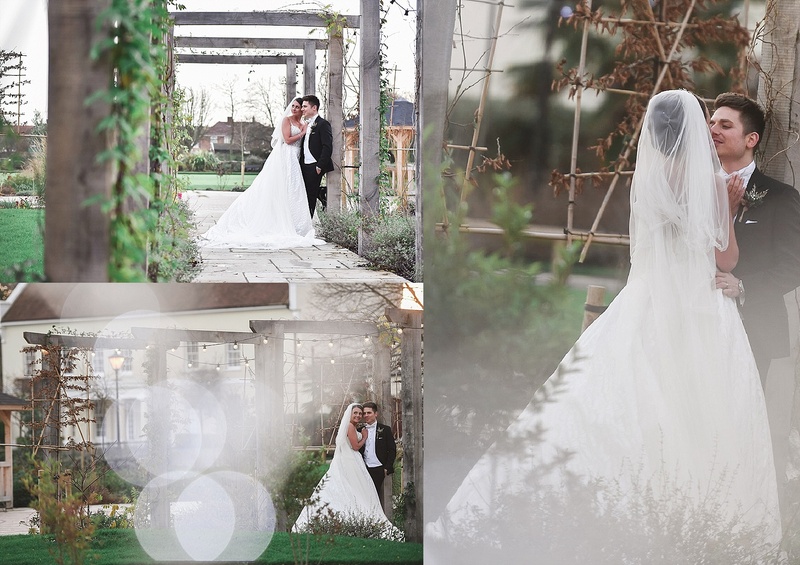 Even the torrential hailstorm couldn’t dampen the day! 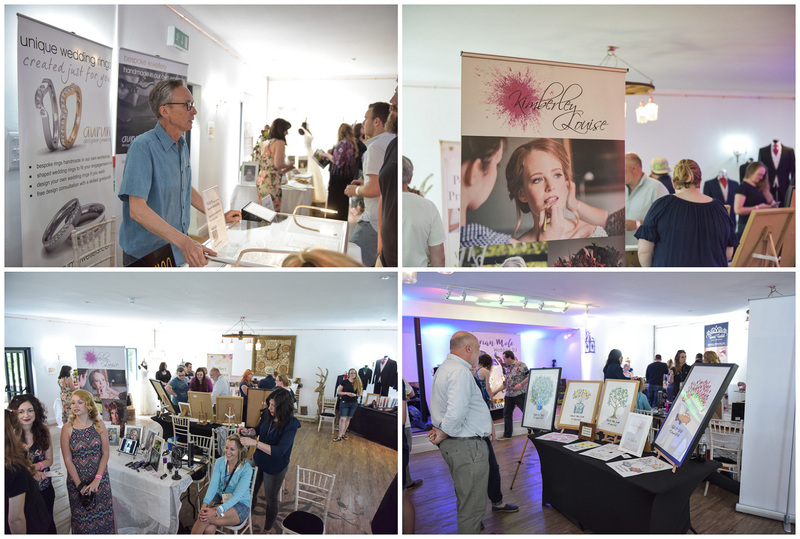 Great to see so many wonderful ideas coming to life! 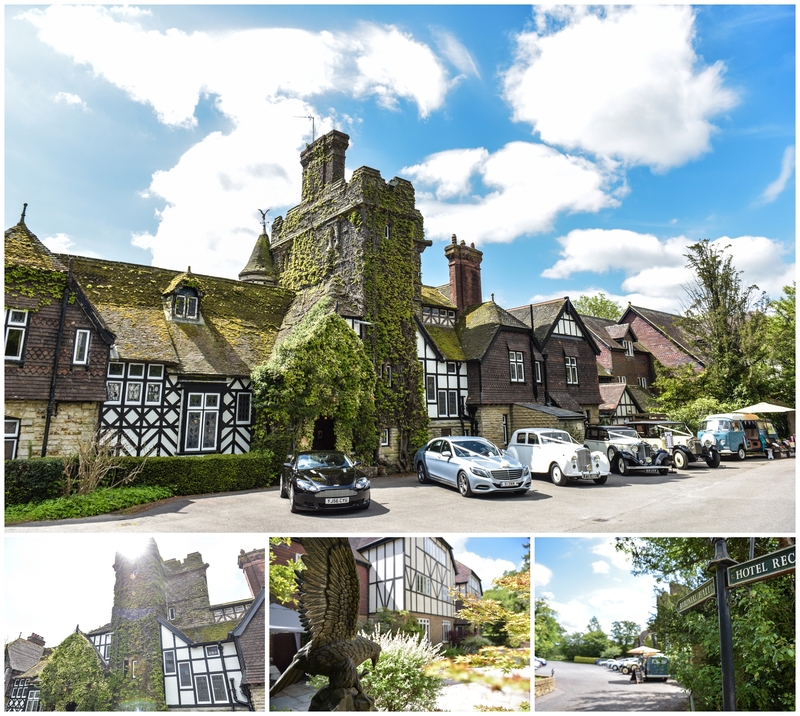 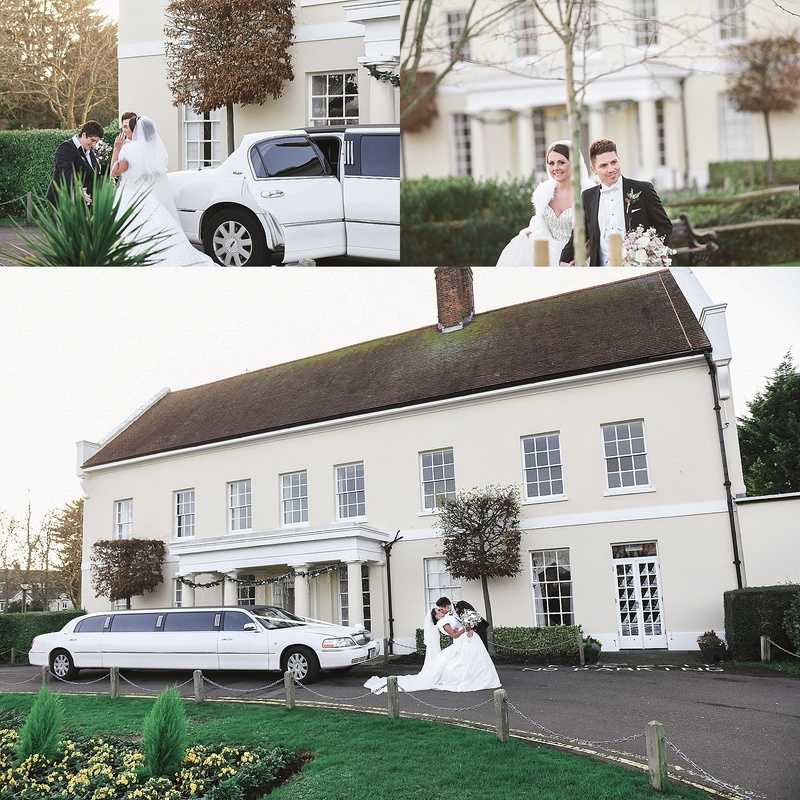 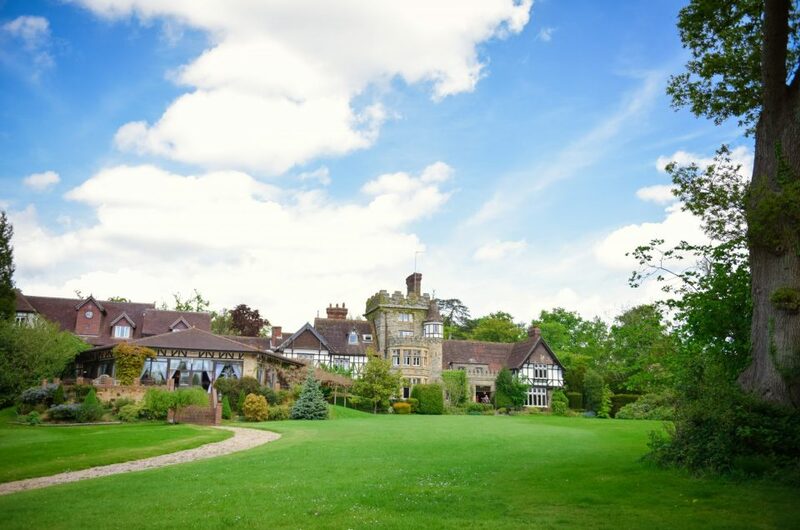 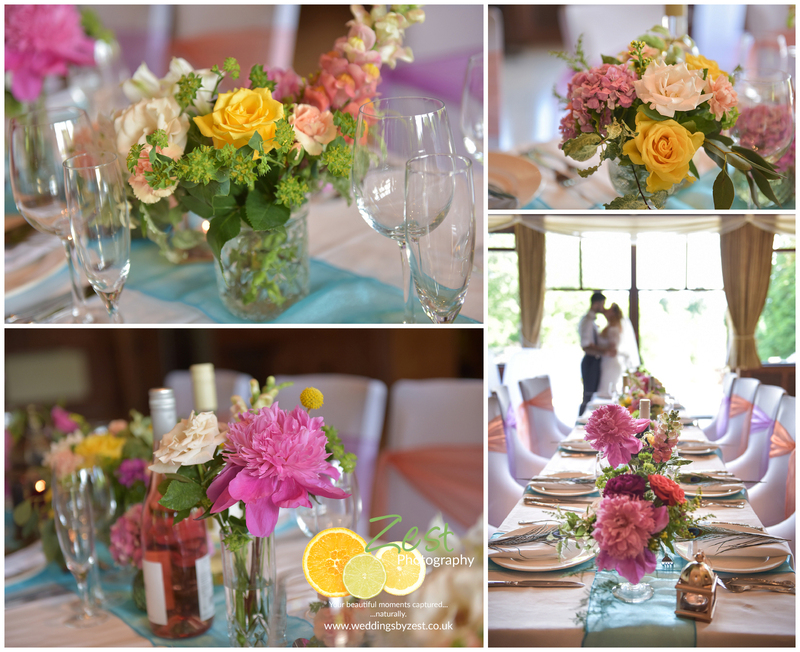 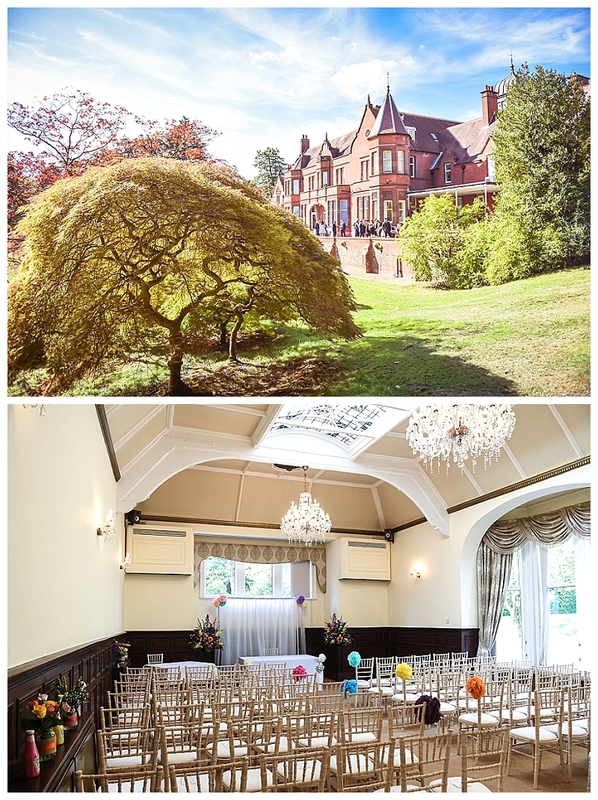 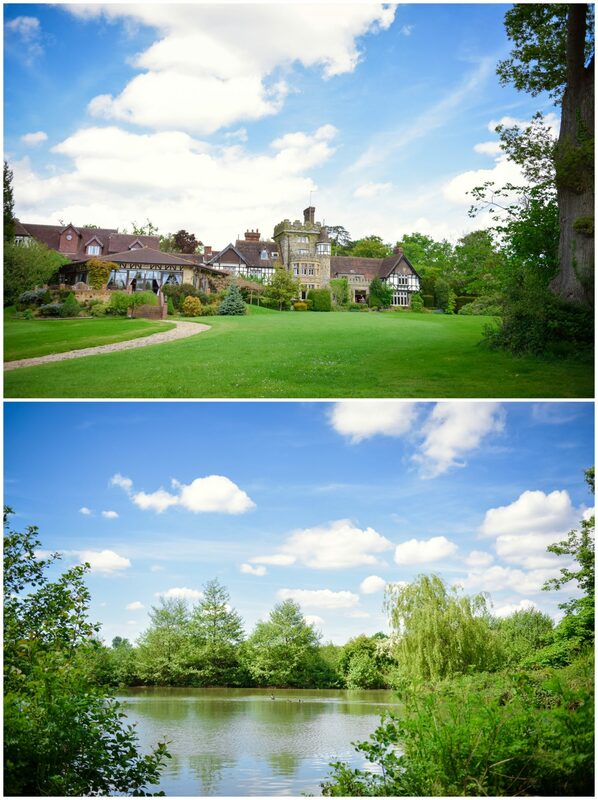 So you read our previous post about the wedding fayre at the magnificent Ravenswood in Sharpthorne, right? 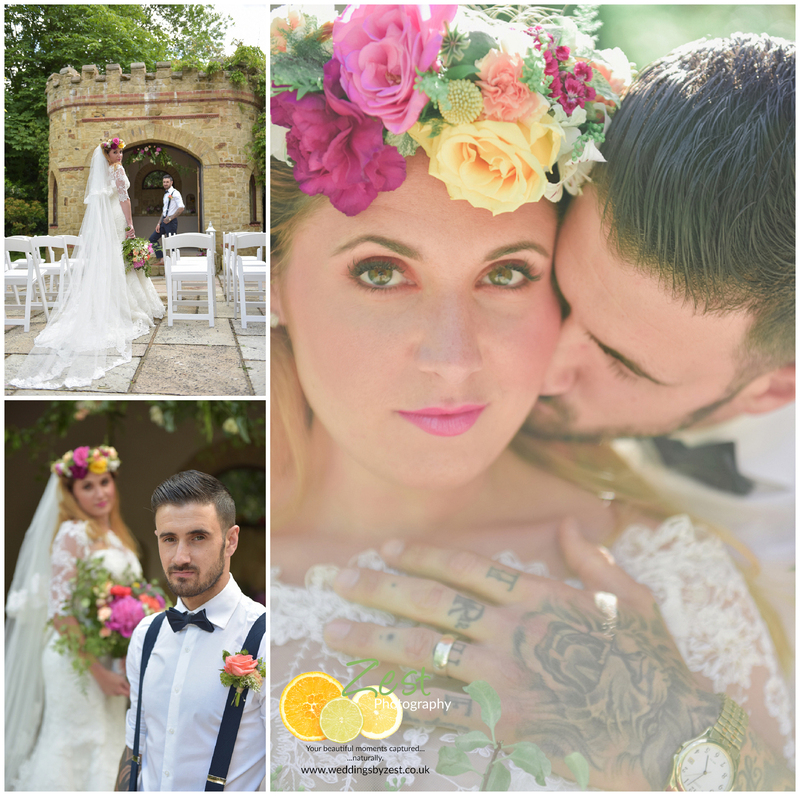 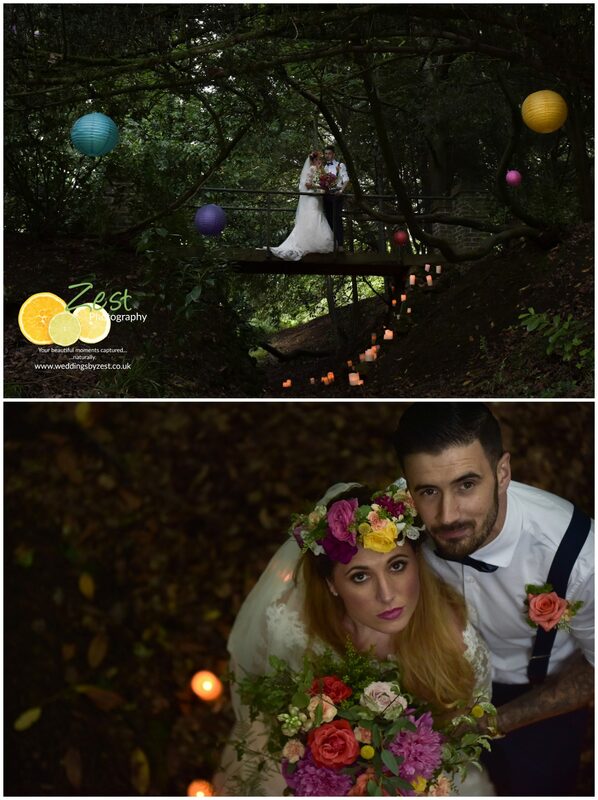 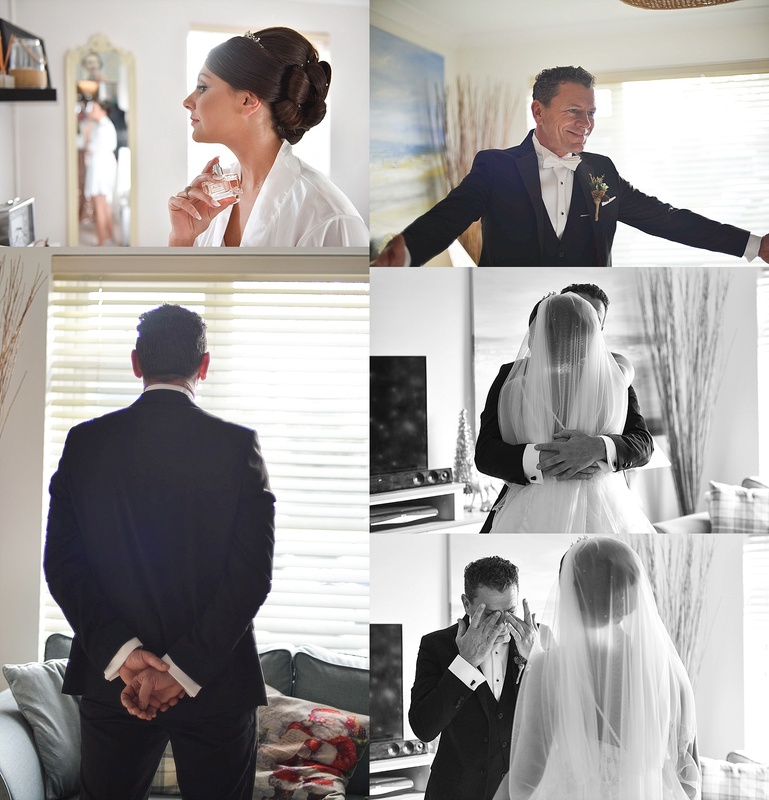 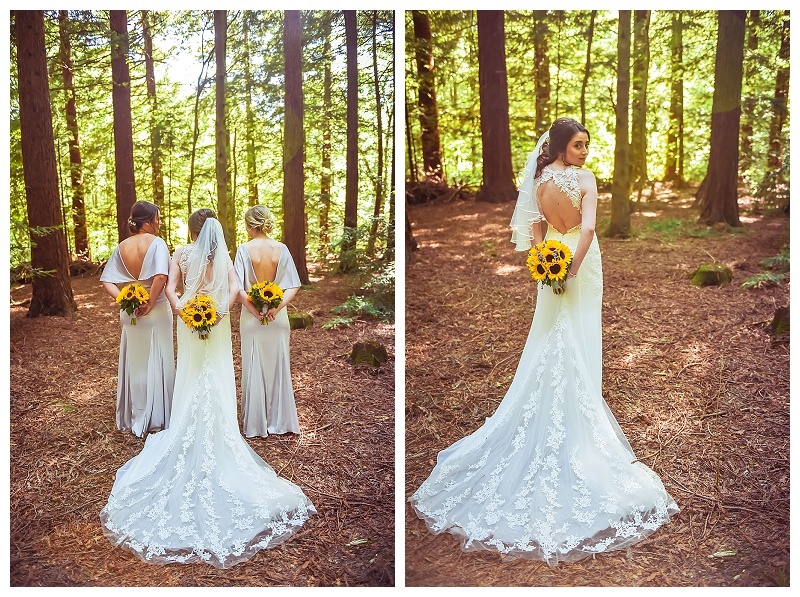 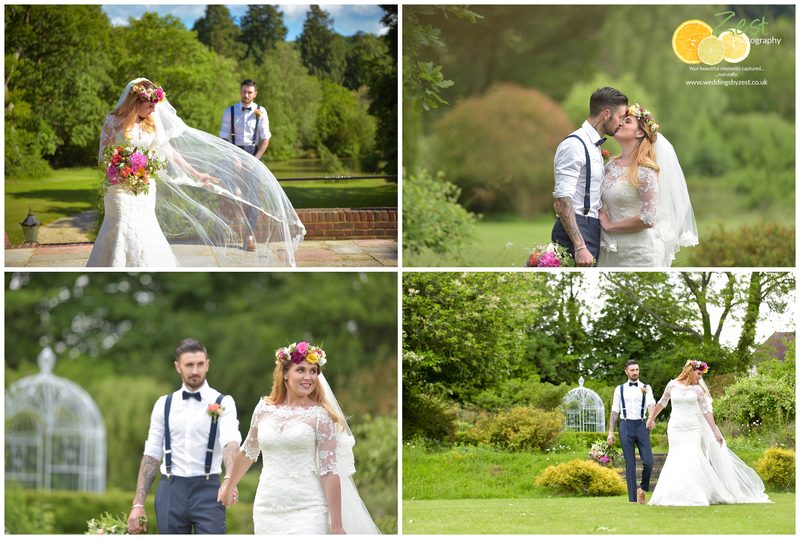 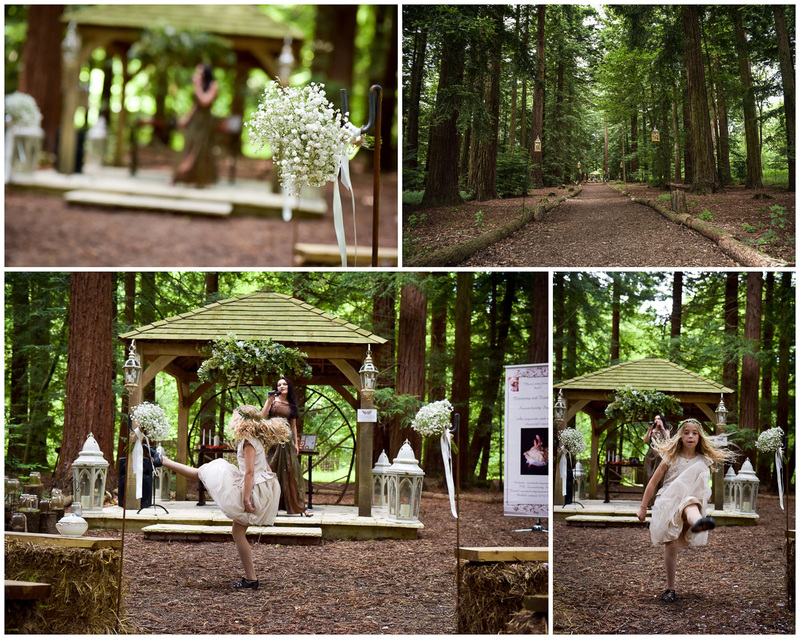 Well, how could we resist going back there when we were asked to set up a stylised shoot along with the dynamic duo that is Amanda from Hire Your Day and Lib from Bettie Rose flowers Hair and make up was by Amanda too! 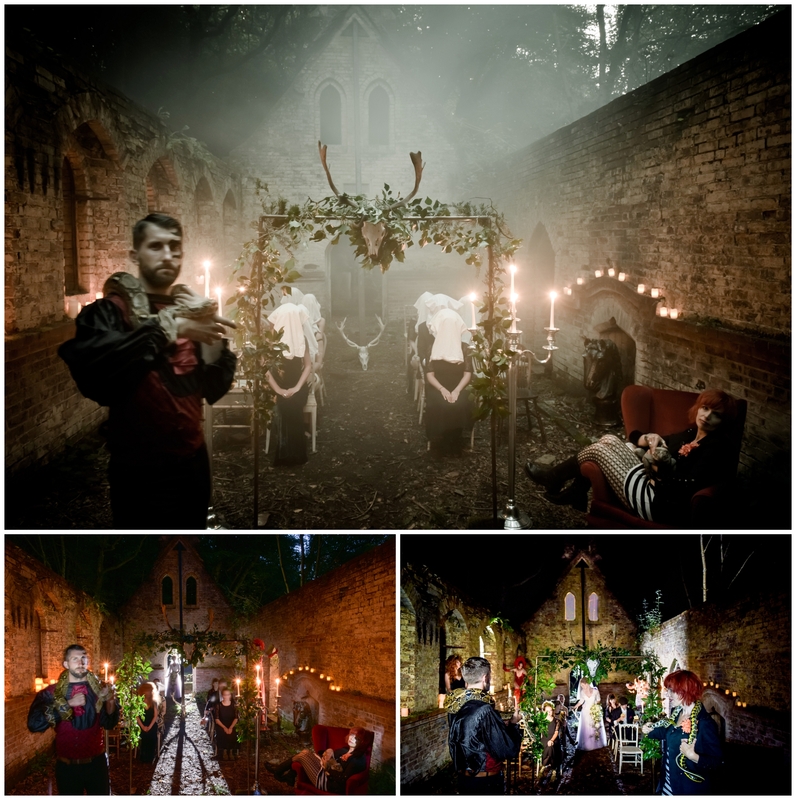 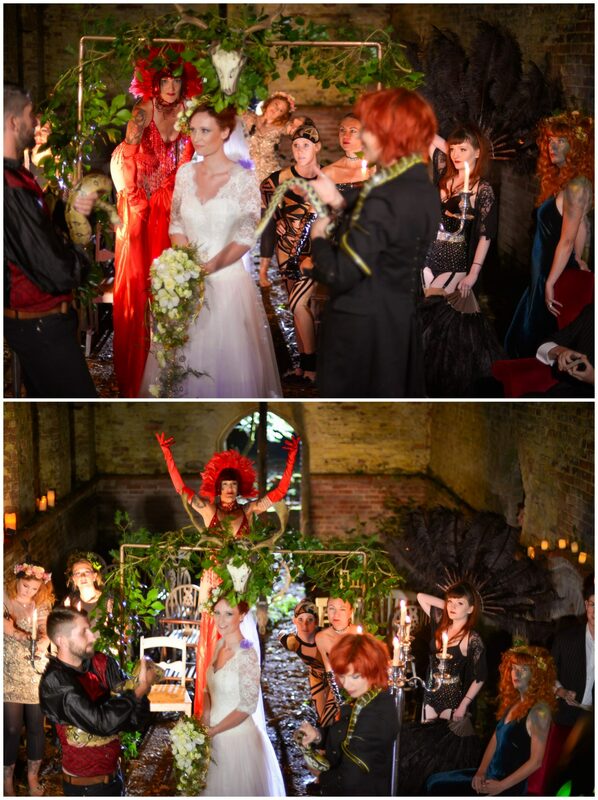 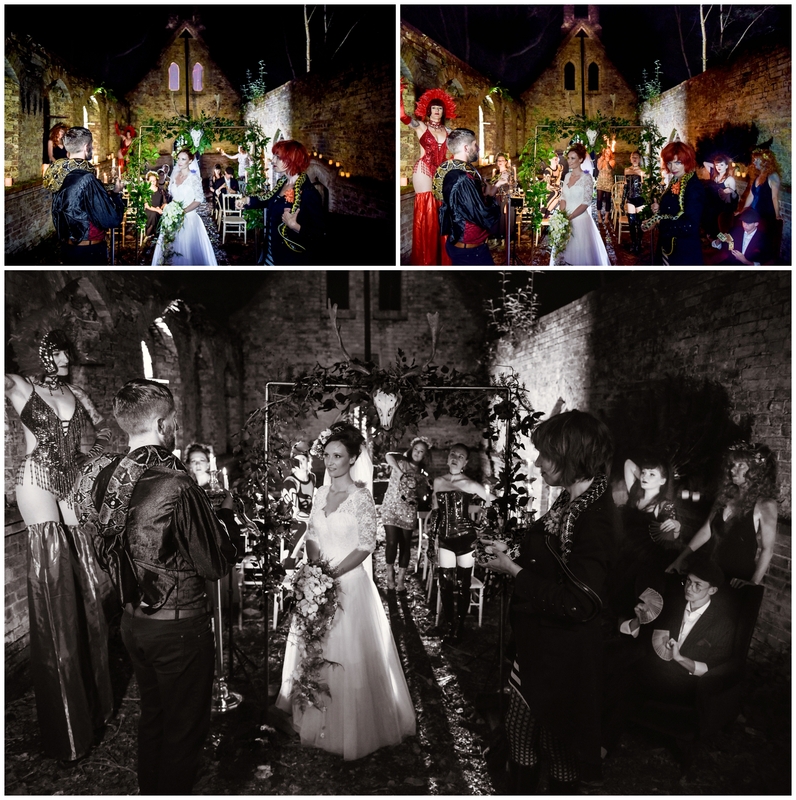 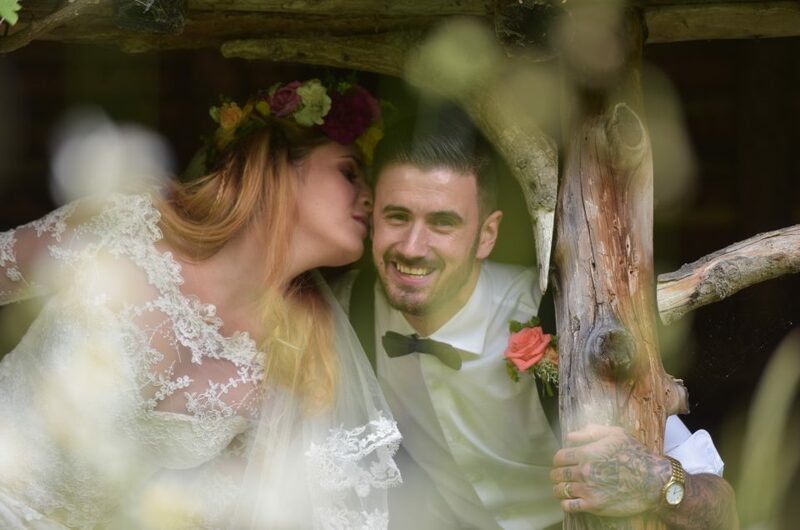 With the added canoodling provided by our very gorgeous models Dolly and Dan (even their names are cute),, a sprinkling of faery magic and a dash of pzazz you can see just what can be done when gothic splendour meets boho chic. 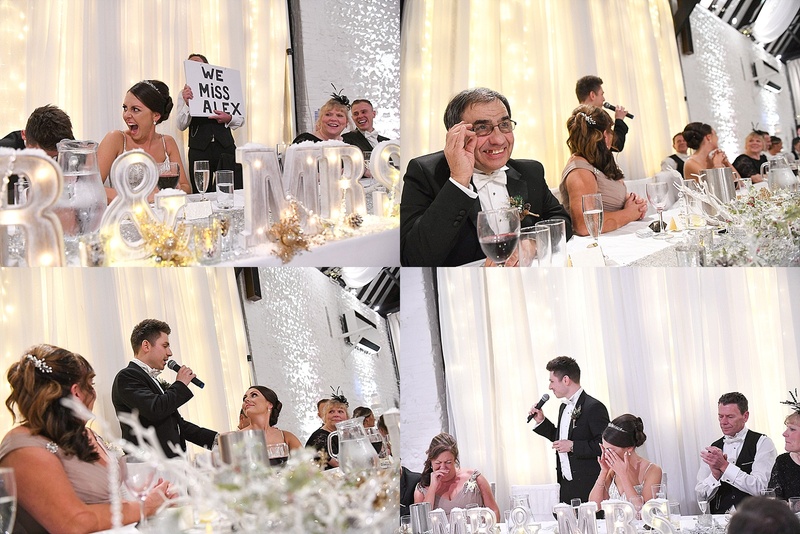 Now get on the blower and book your date there – it’s an order! 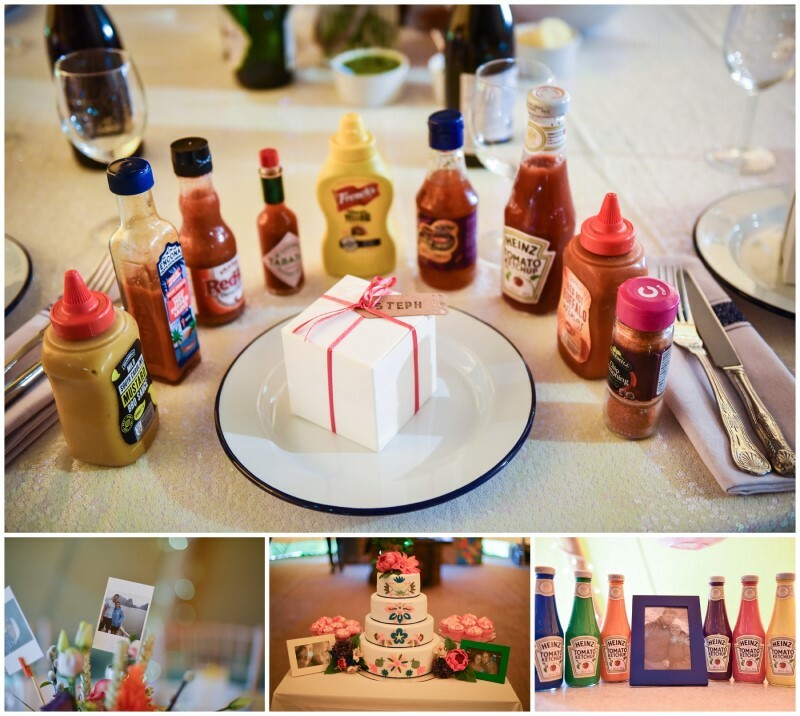 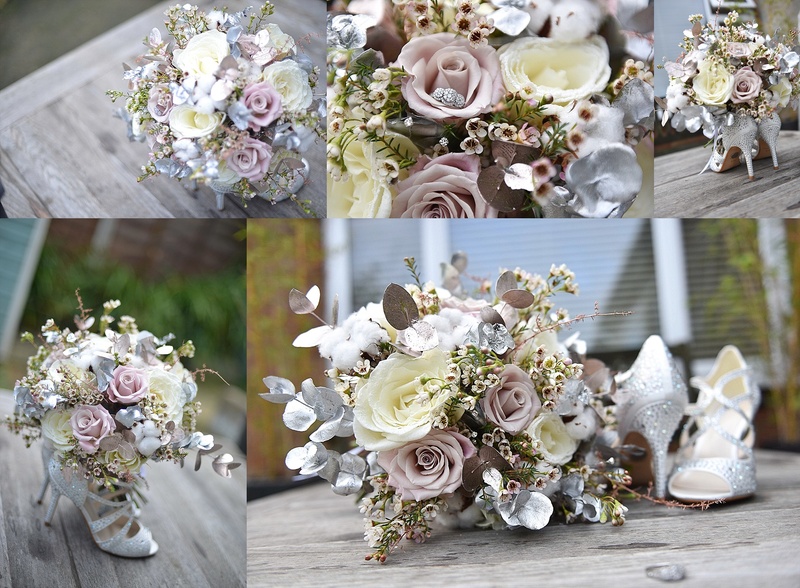 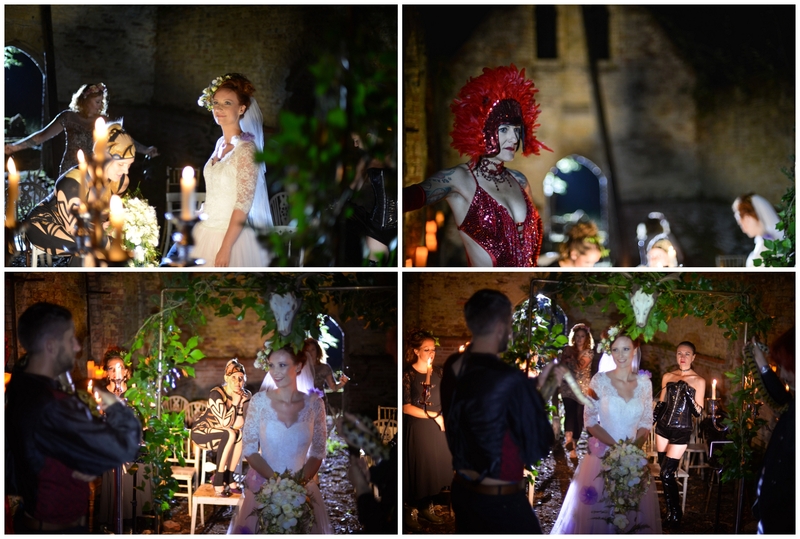 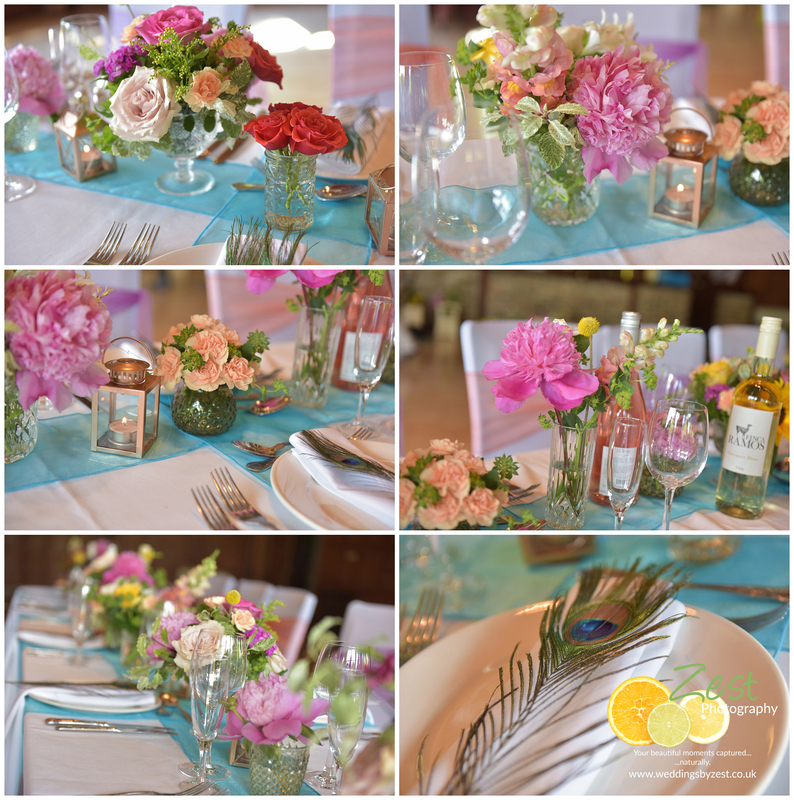 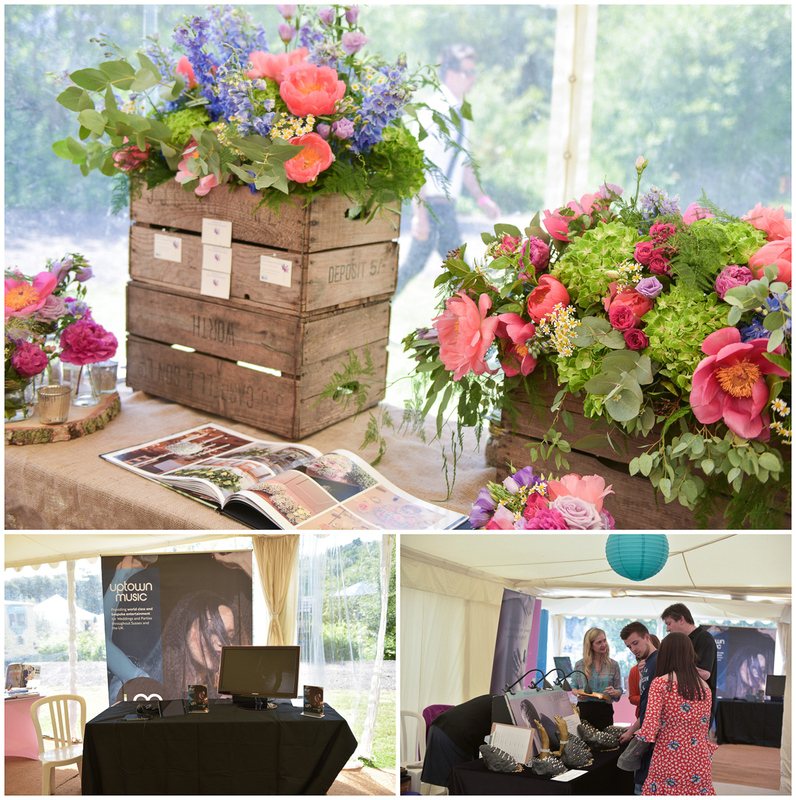 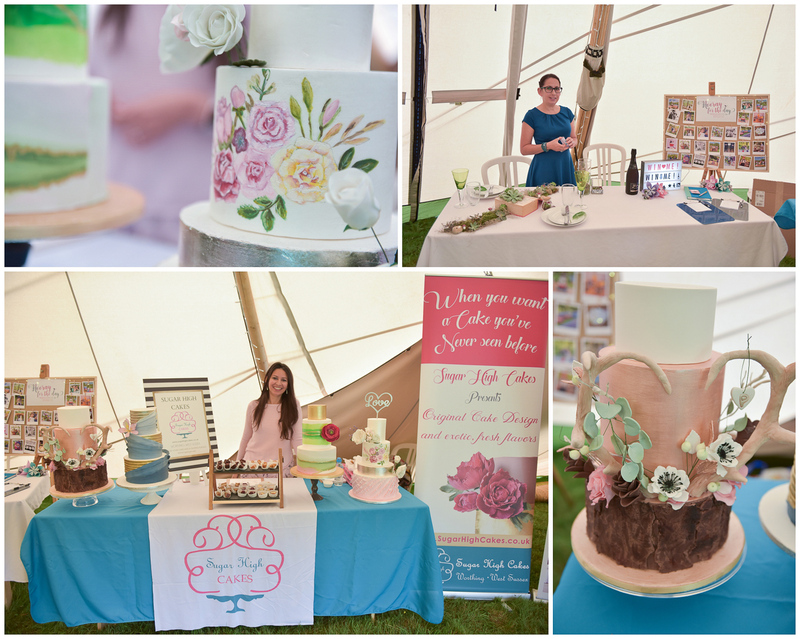 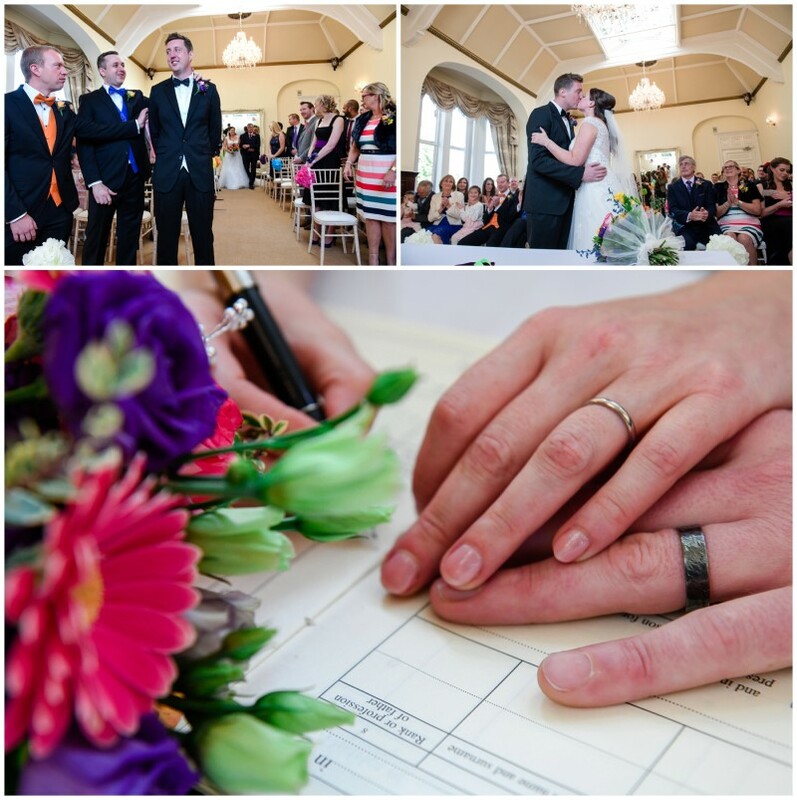 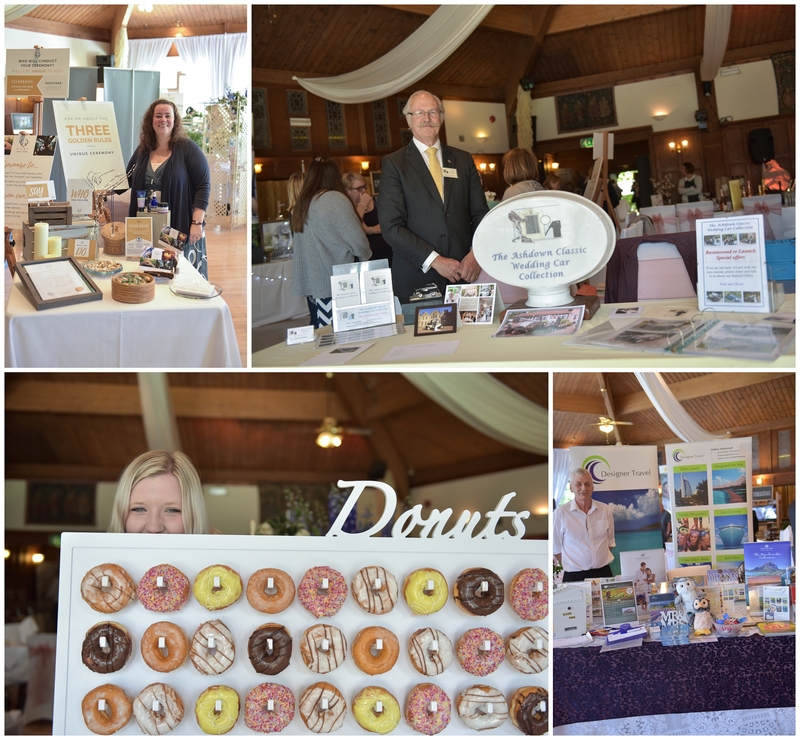 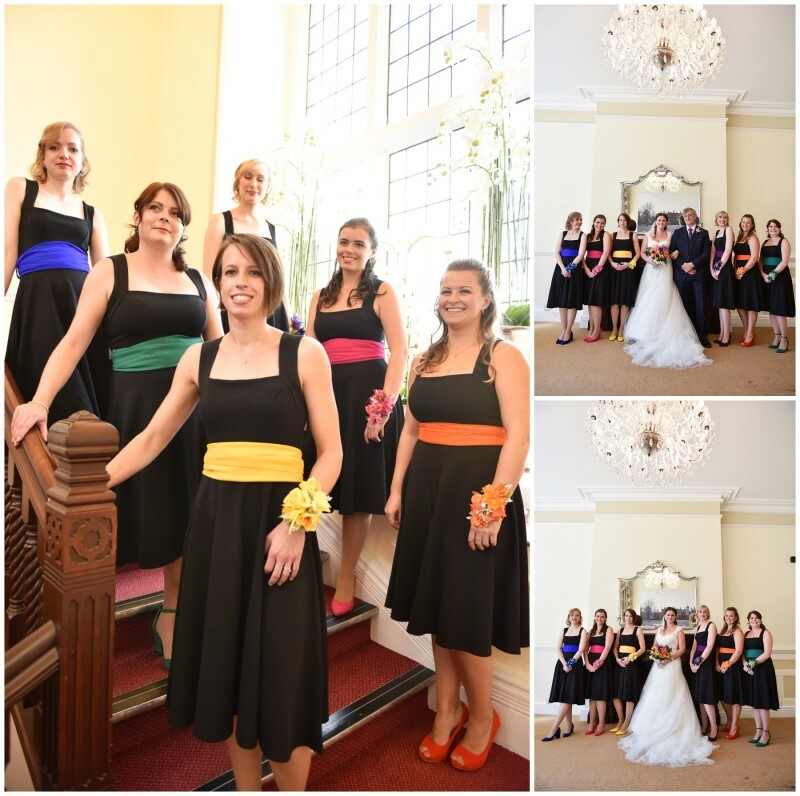 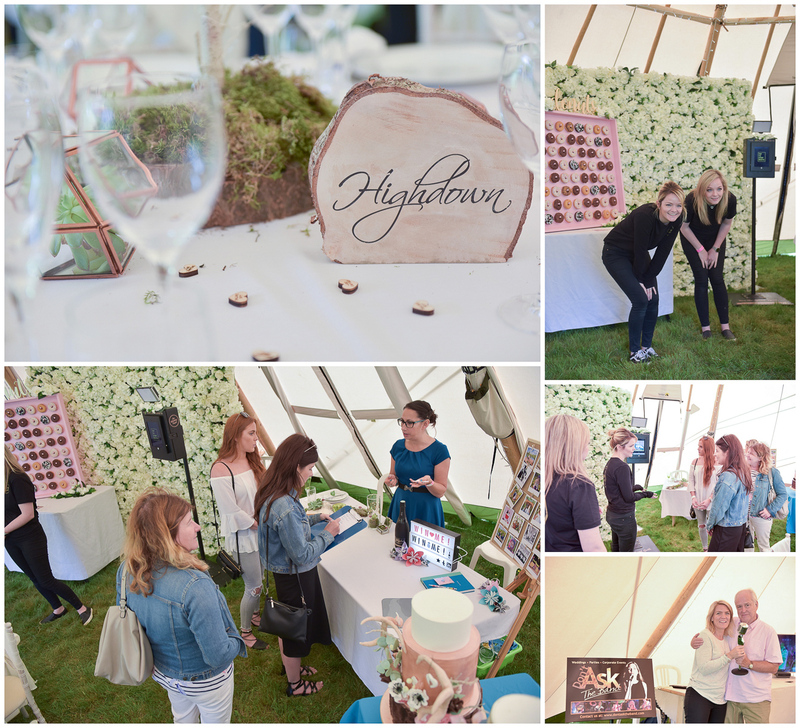 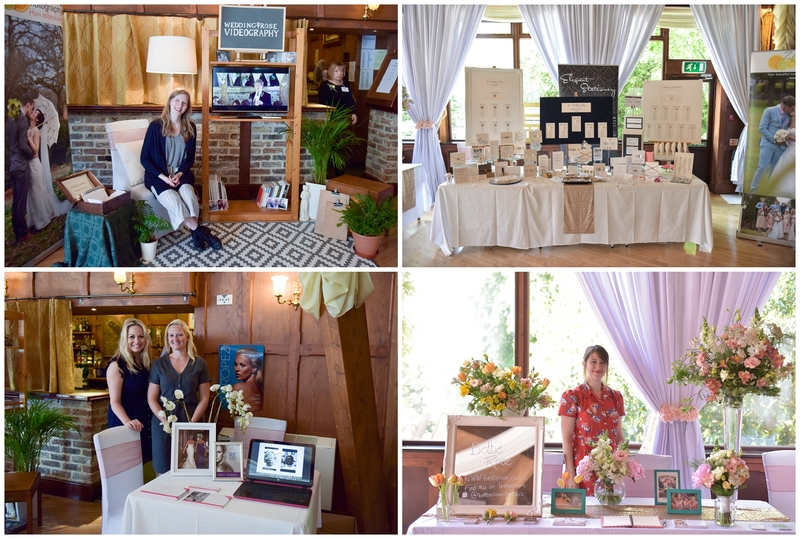 Ok, so you know that we do a lot of wedding fayres – right? 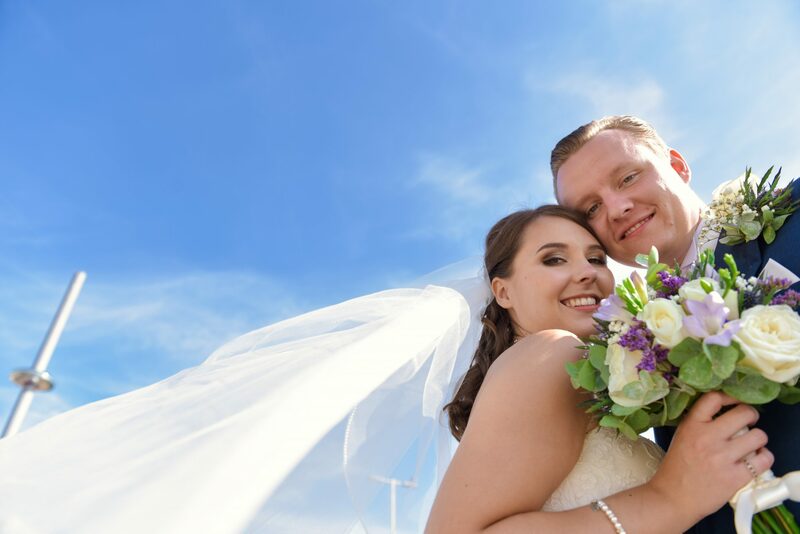 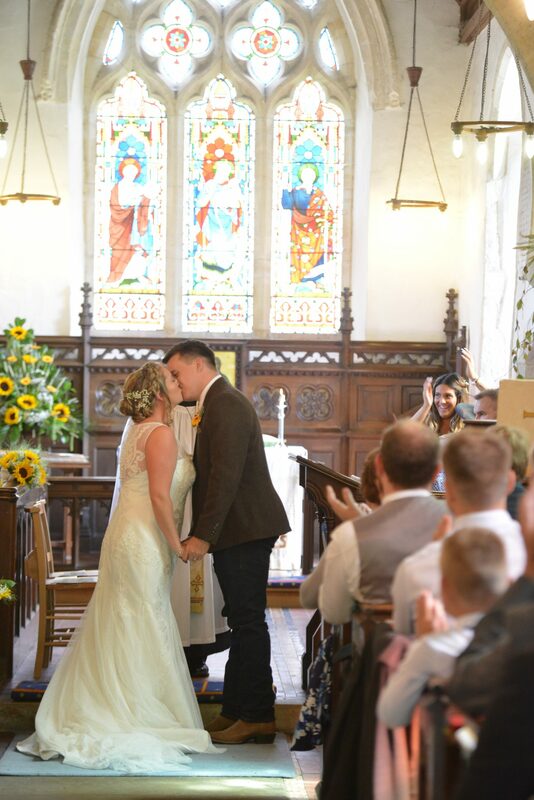 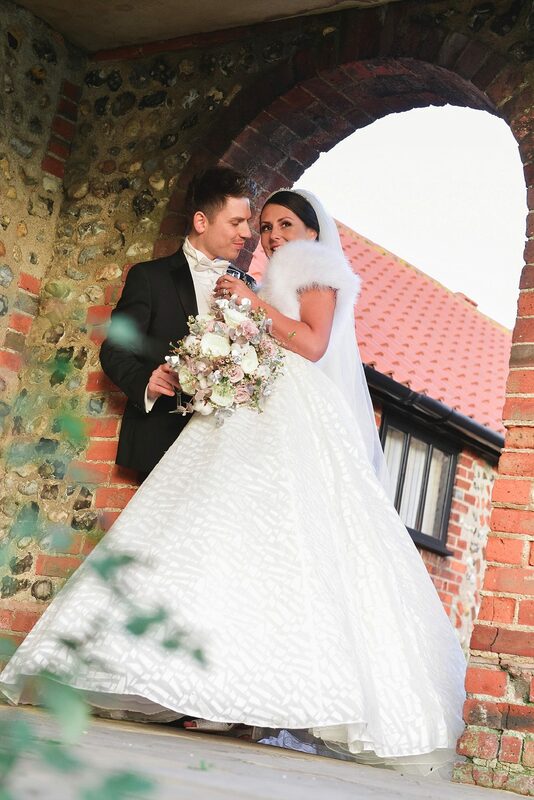 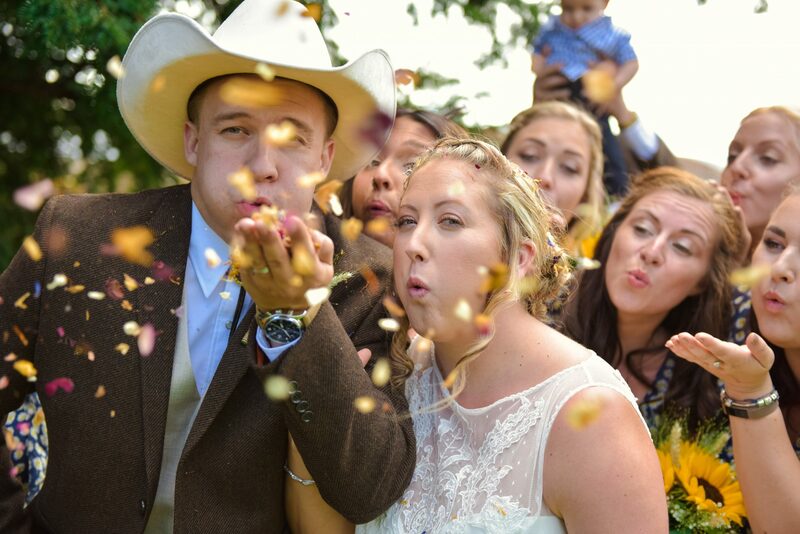 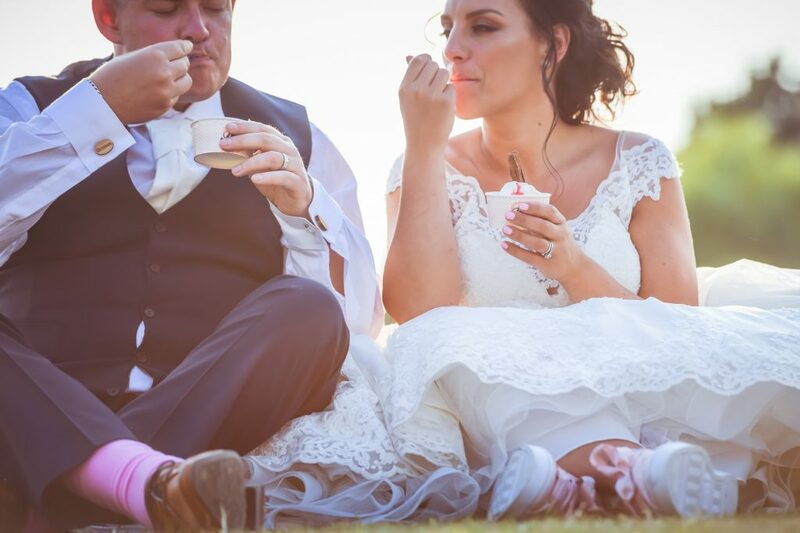 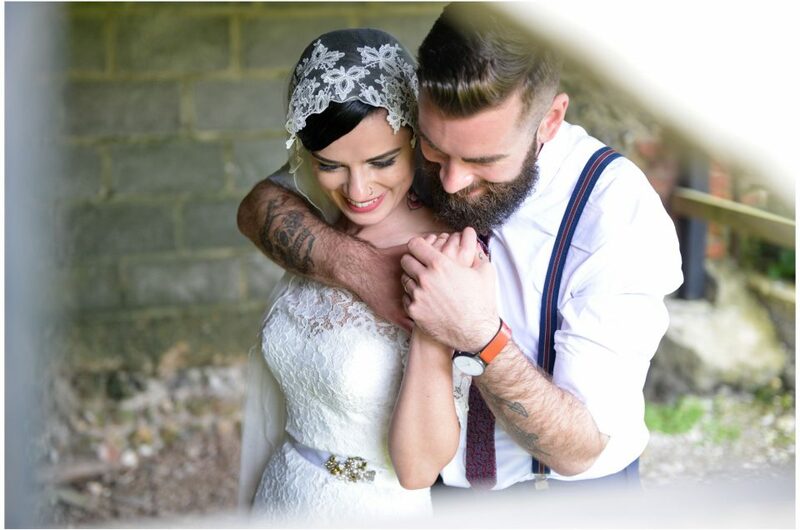 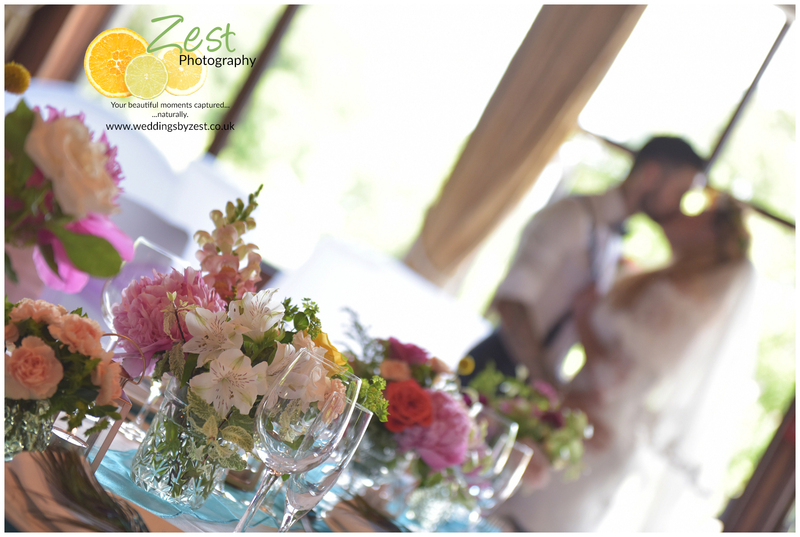 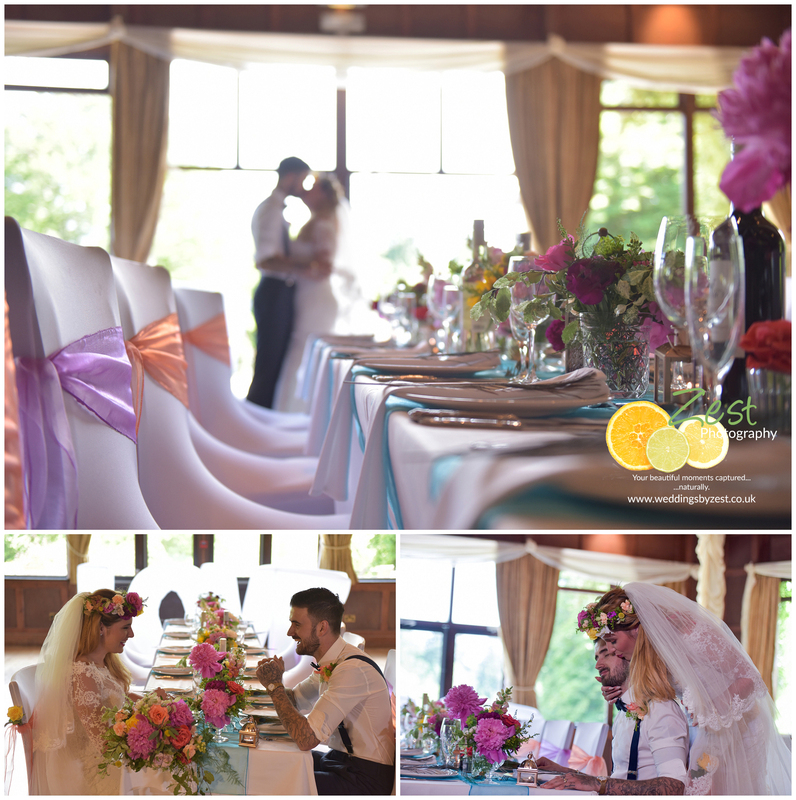 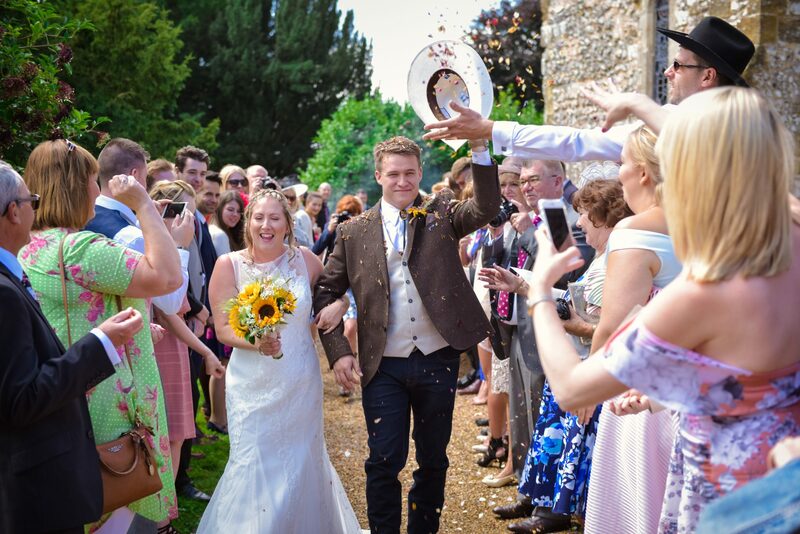 We love them as they offer the opportunity to meet couples face-to-face and, just as importantly, keep us in touch and up to date with all of those lovely suppliers that make weddings so yummy! 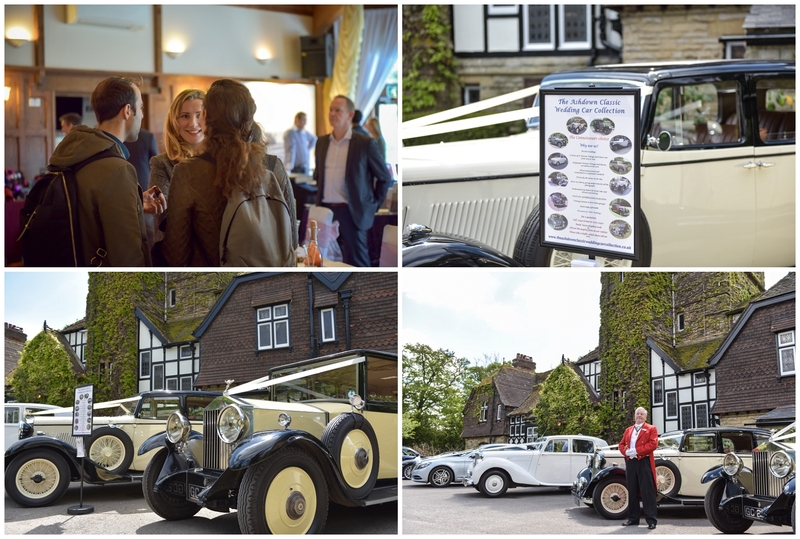 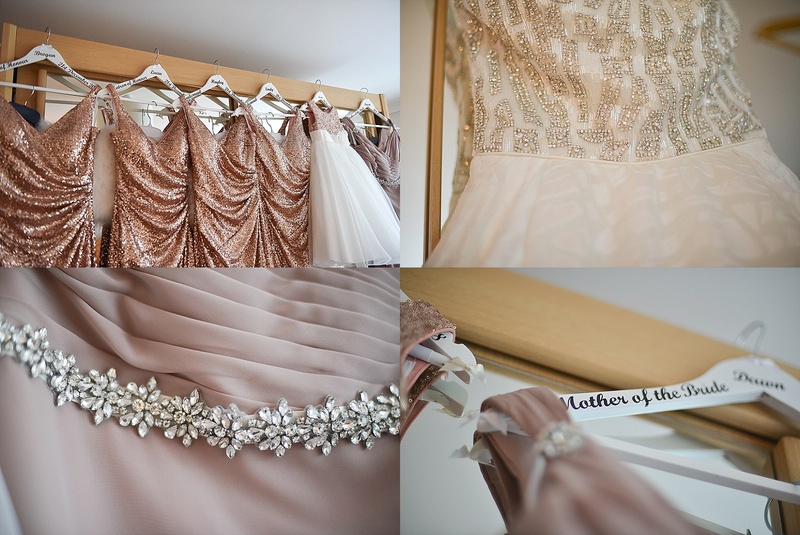 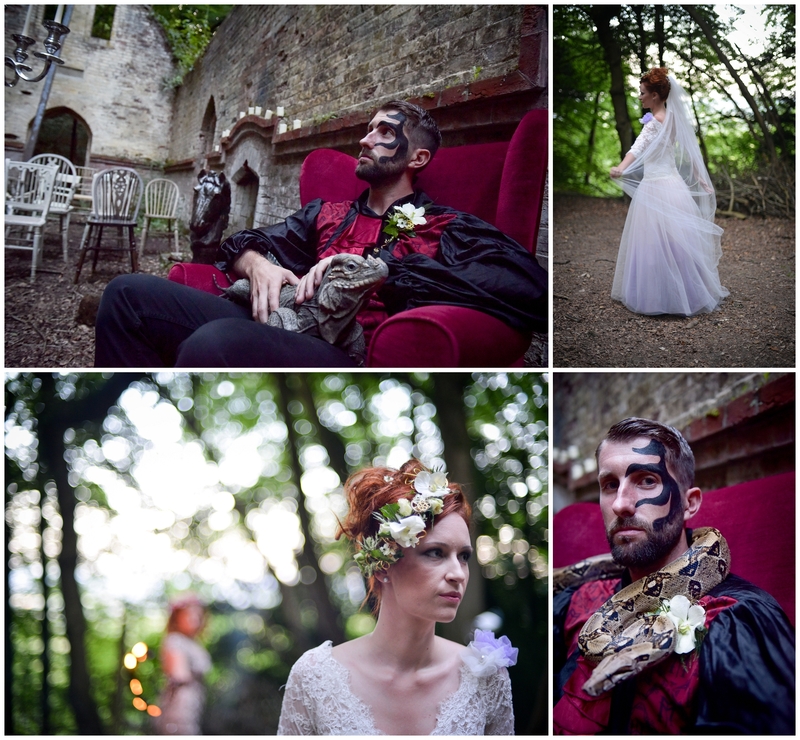 This wedding fayre, however, was something really rather special. 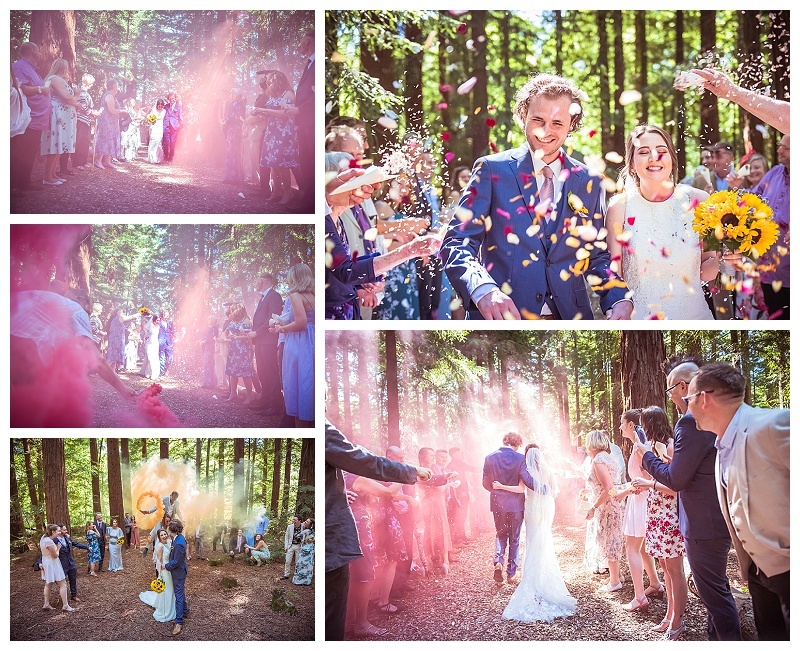 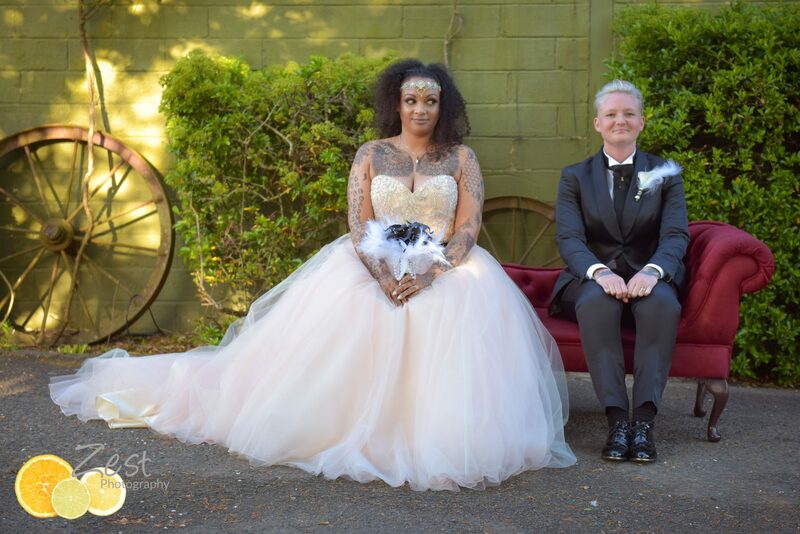 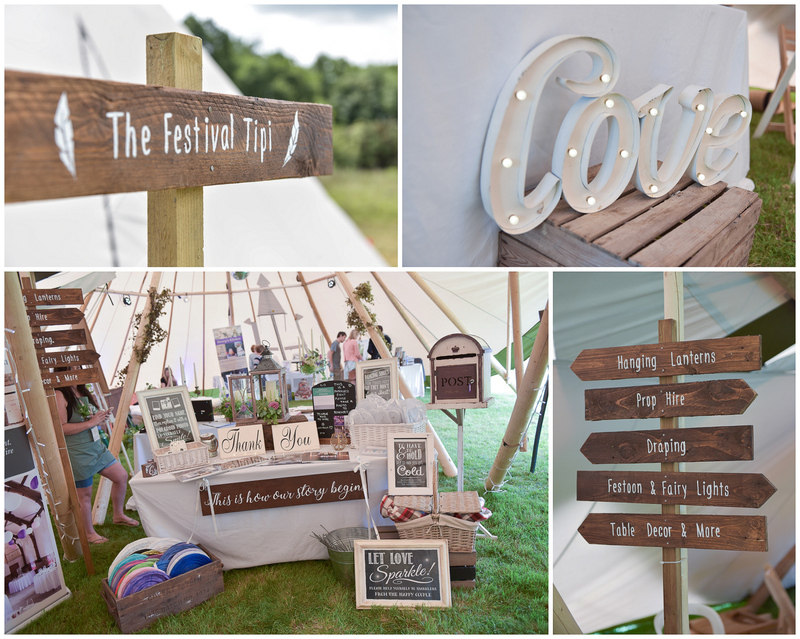 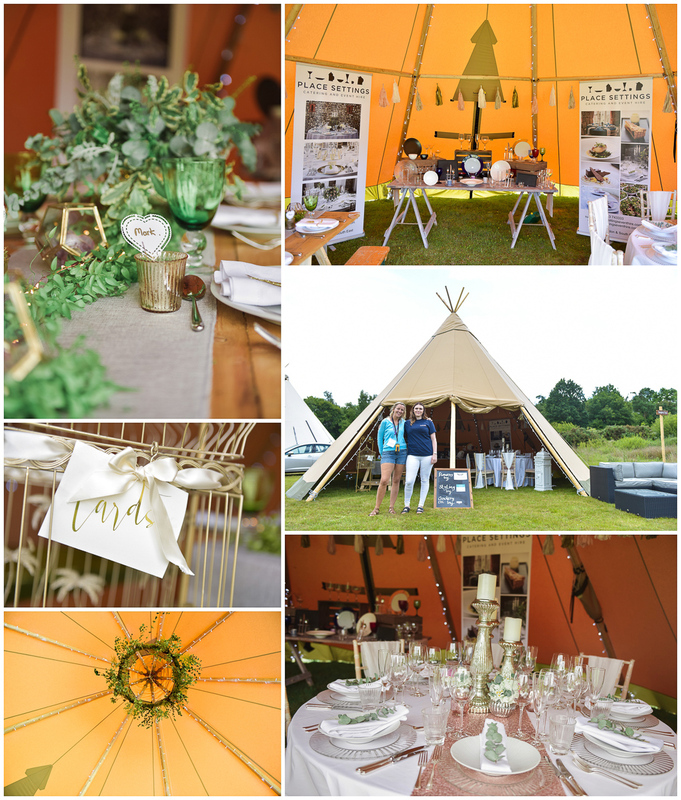 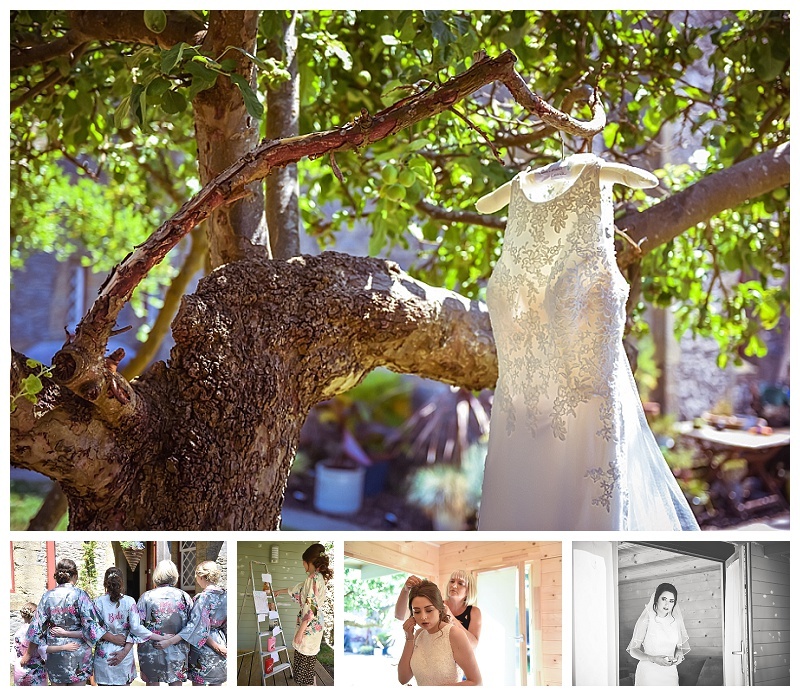 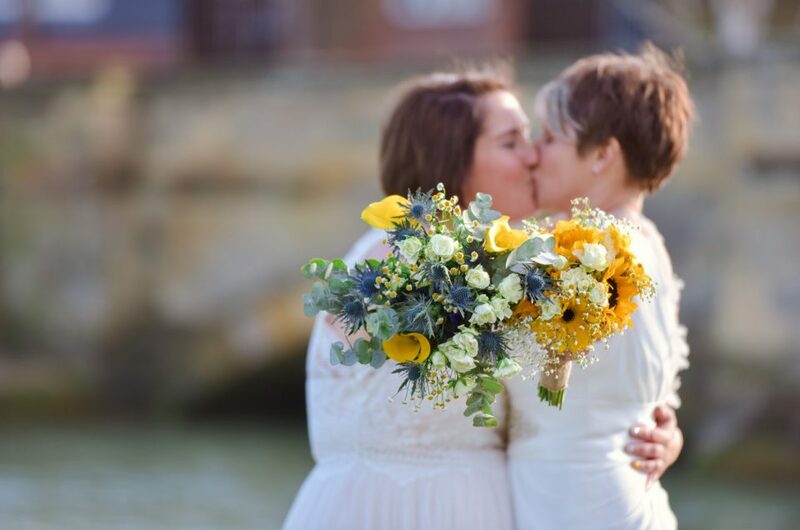 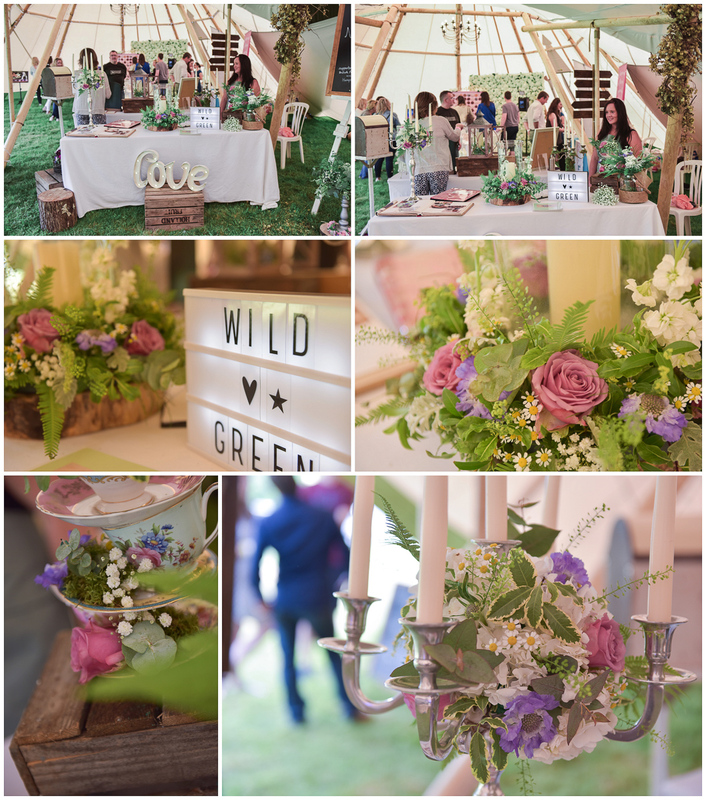 Let’s take you back two years to a time where two leading industry experts Sara Ellis of To Have and To Hire and Emma Pentony of Wild and Green had a dream to create the Souths first outdoor, festival styled wedding event. 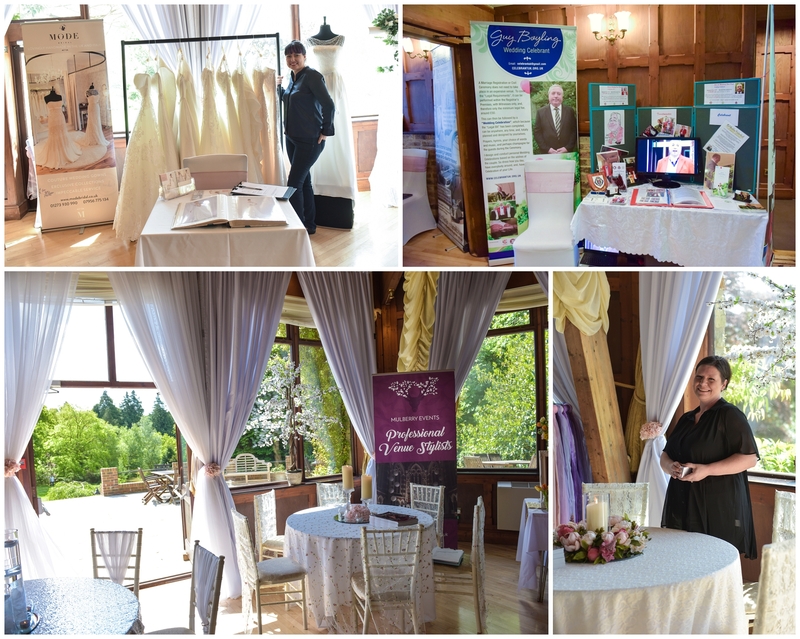 Bored of the stereotypical white tablecloth styled, Sunday outing they dreamed, not just of another wedding fayre, but a proper day out for like minded people. 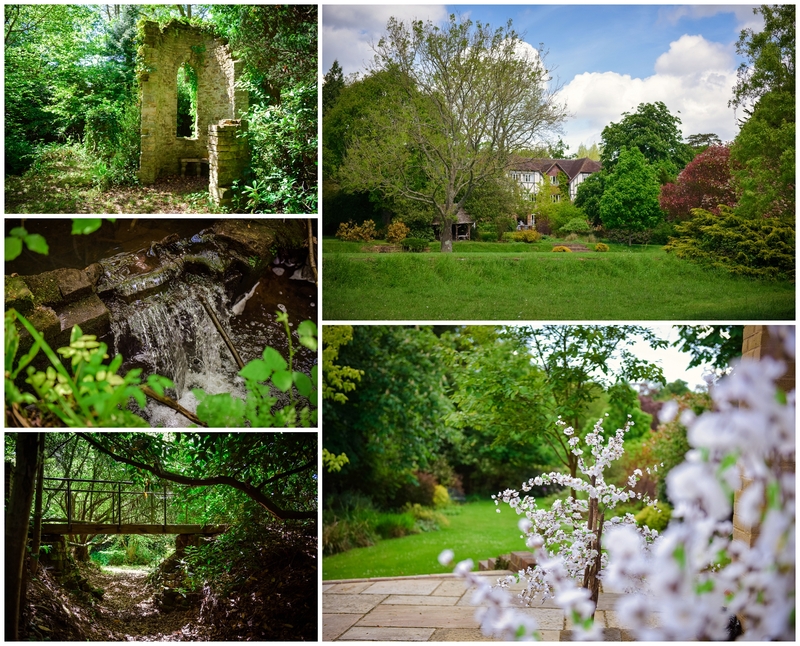 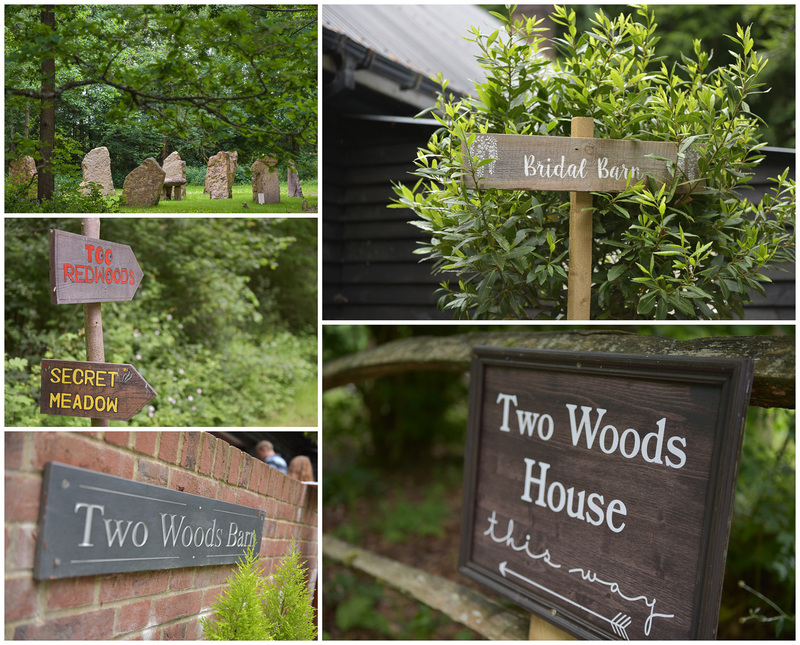 Fast forward to 2017 and the ladies stumble across ‘Two Woods’ a most beautiful Sussex woodland estate owned and managed by a forward thinking couple, Mark and Jade. 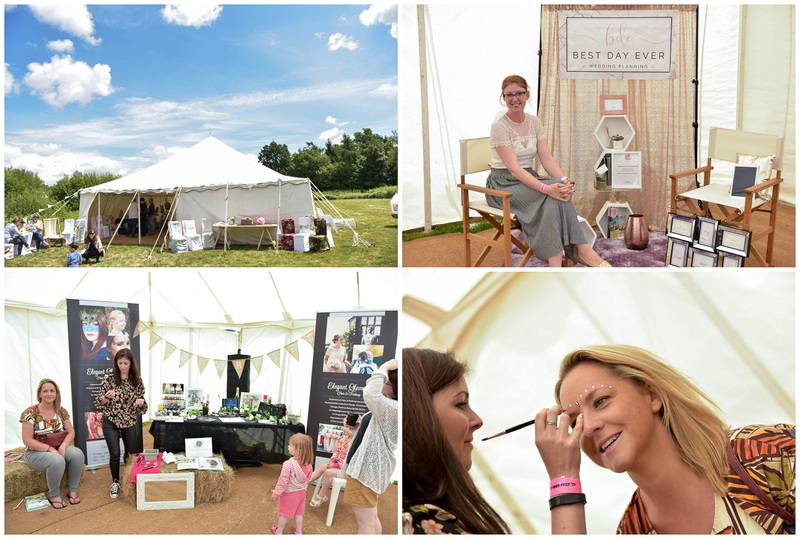 From there Sussex Wedfest was born! 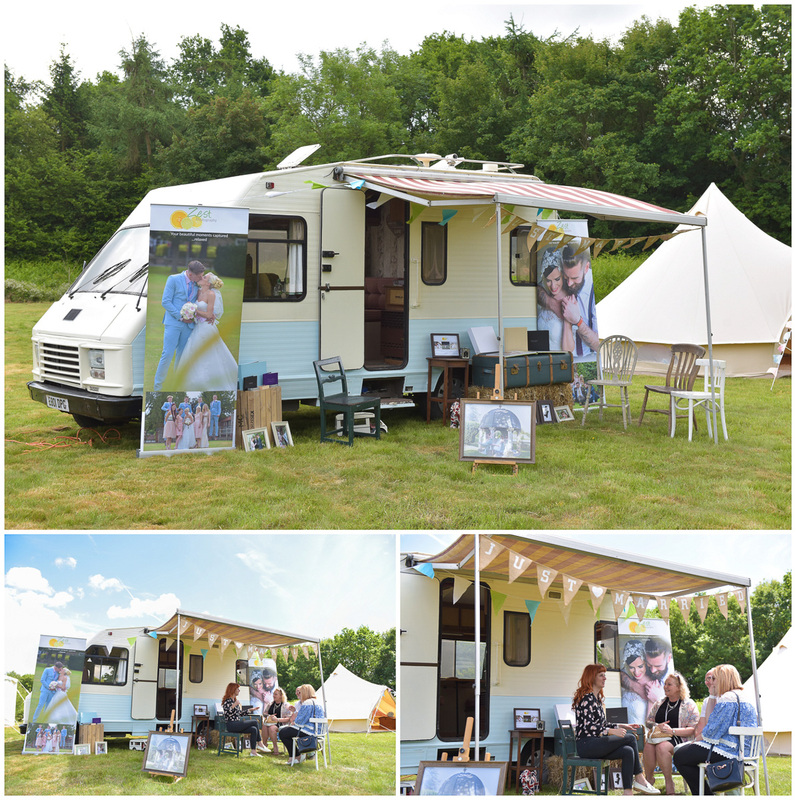 Zest were asked to bring ‘Ugly Ethel’ along as a consultation room to help couples that wanted to discuss the in’s and out’s of photographing their greatest adventure and we jumped at the chance! 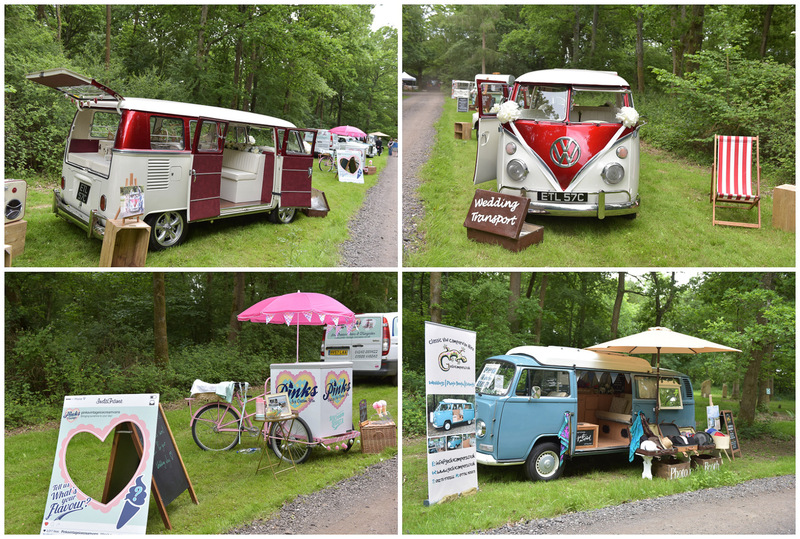 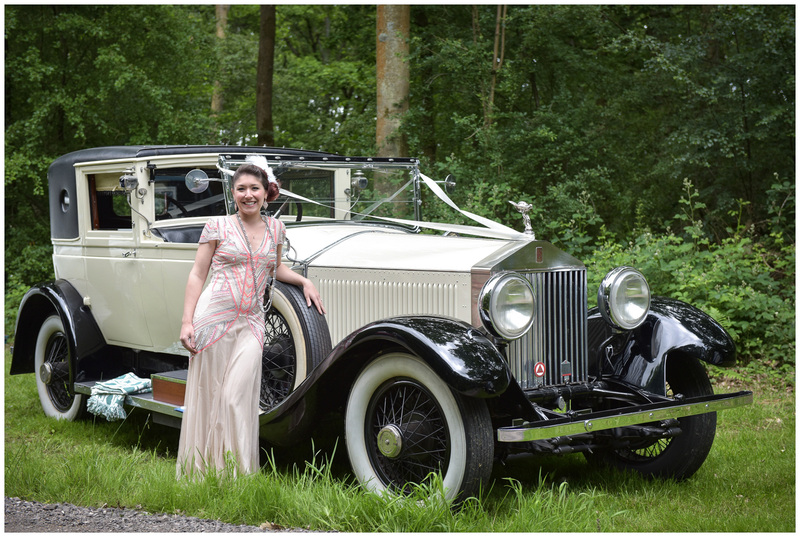 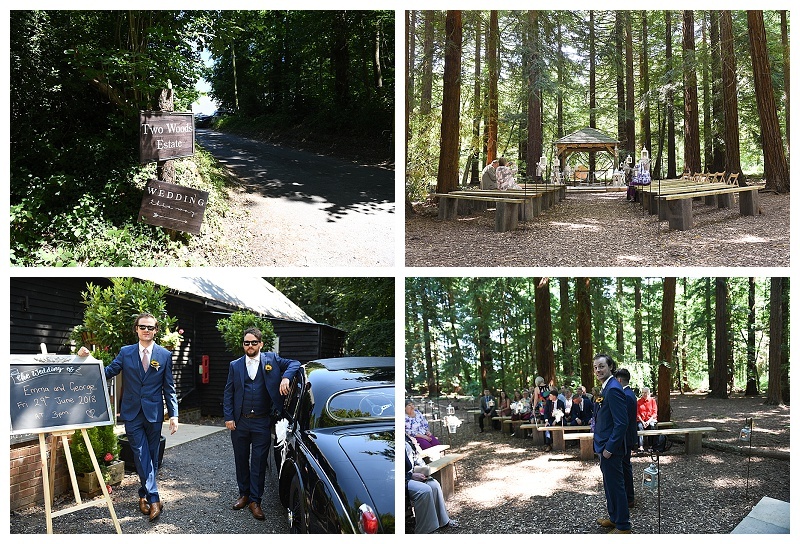 After much planning and preparing (not to mention a good make-over for Ethel), we rocked up last Sunday to Two Woods. 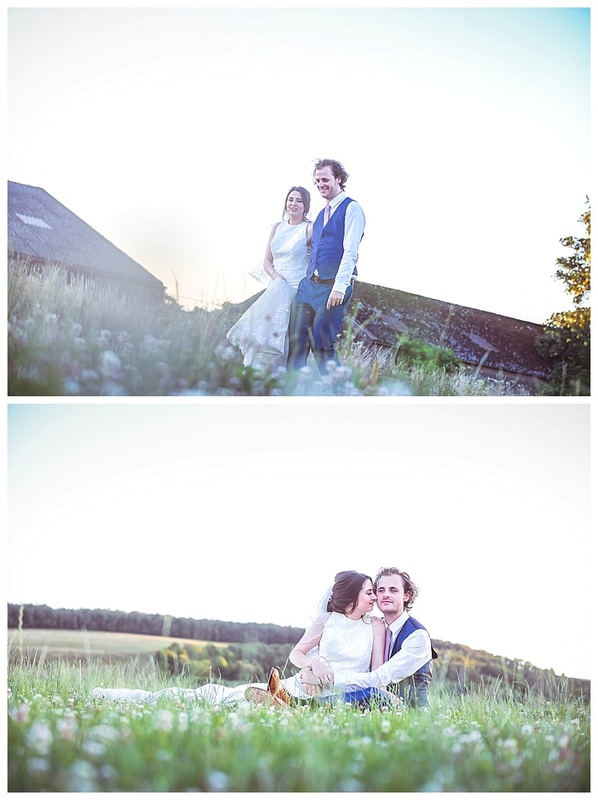 As we bounced and swayed our way up the long windy roads and headed across the fields to our pitch in the Secret Meadow, we saw the makings of the day unfold. 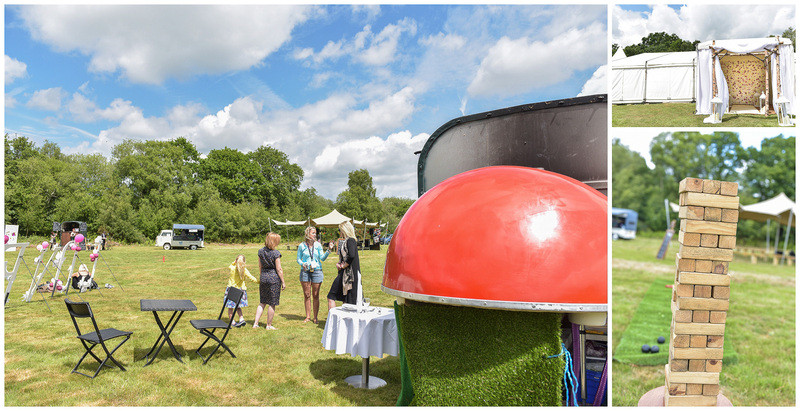 Dotted all around the large fields and along the driveways were little vintage caravans, horseboxes, cars and even an old milk float. 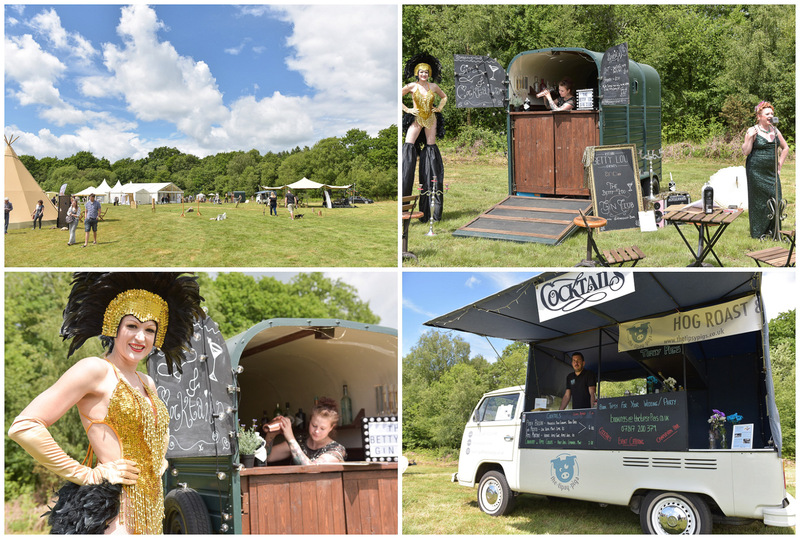 All dolled up and showing off their new weddingy roles as gin bars, cocktail bars, photobooths and props – I couldn’t help thinking of a scene from carry on camping! 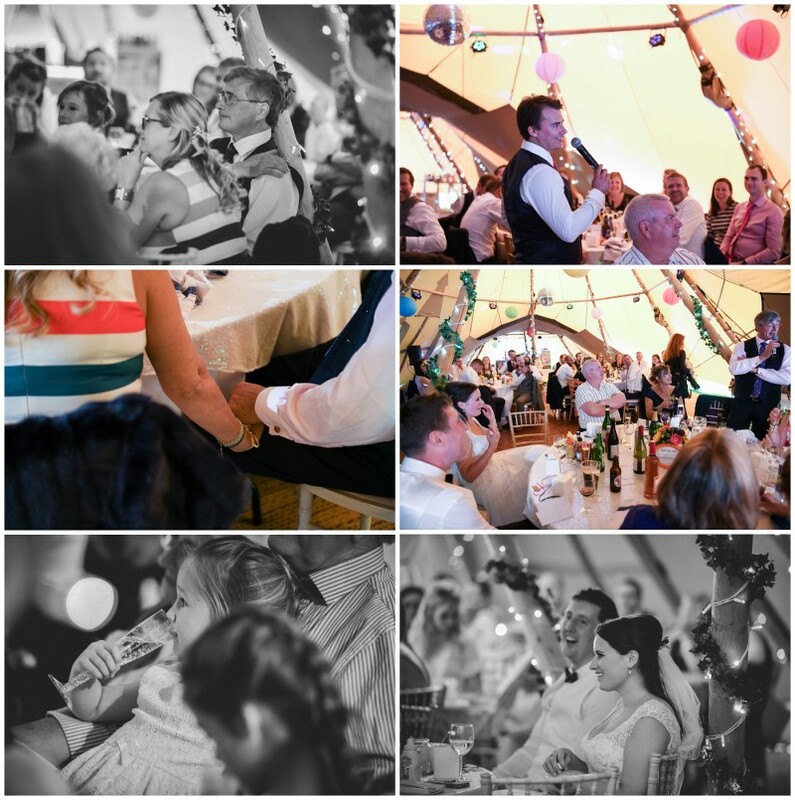 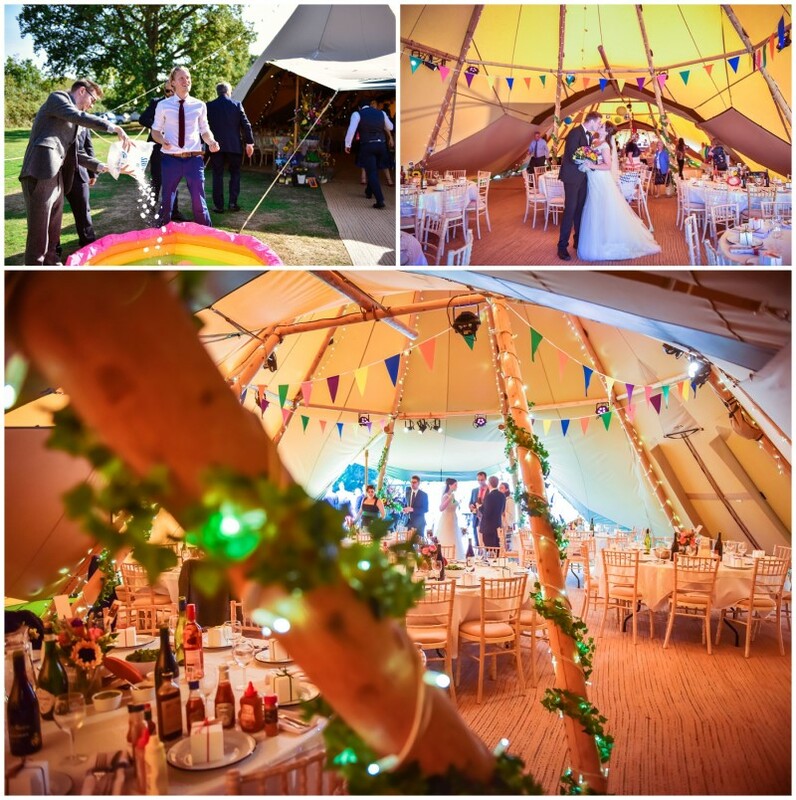 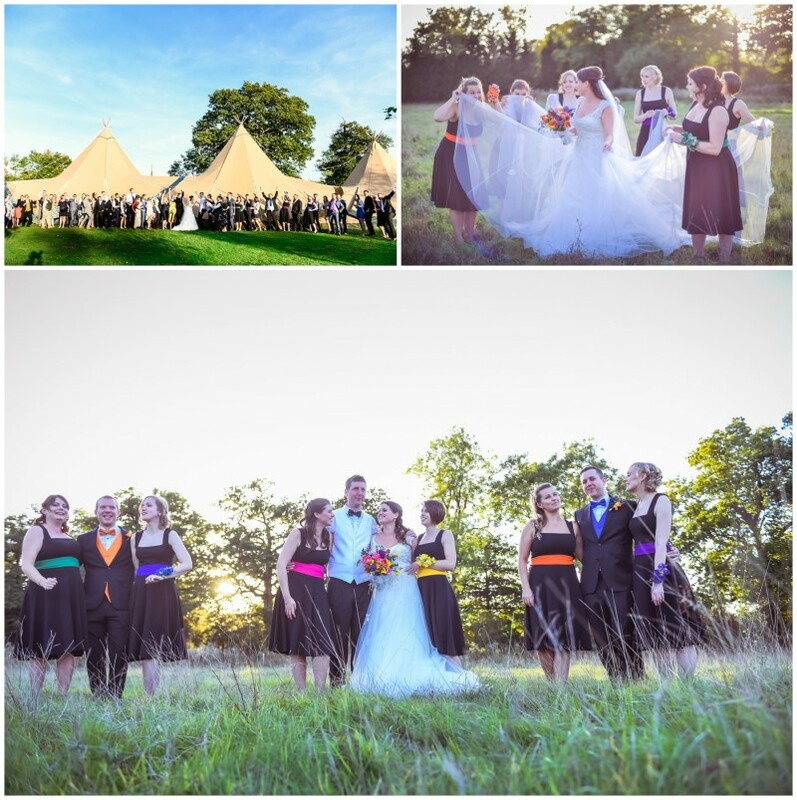 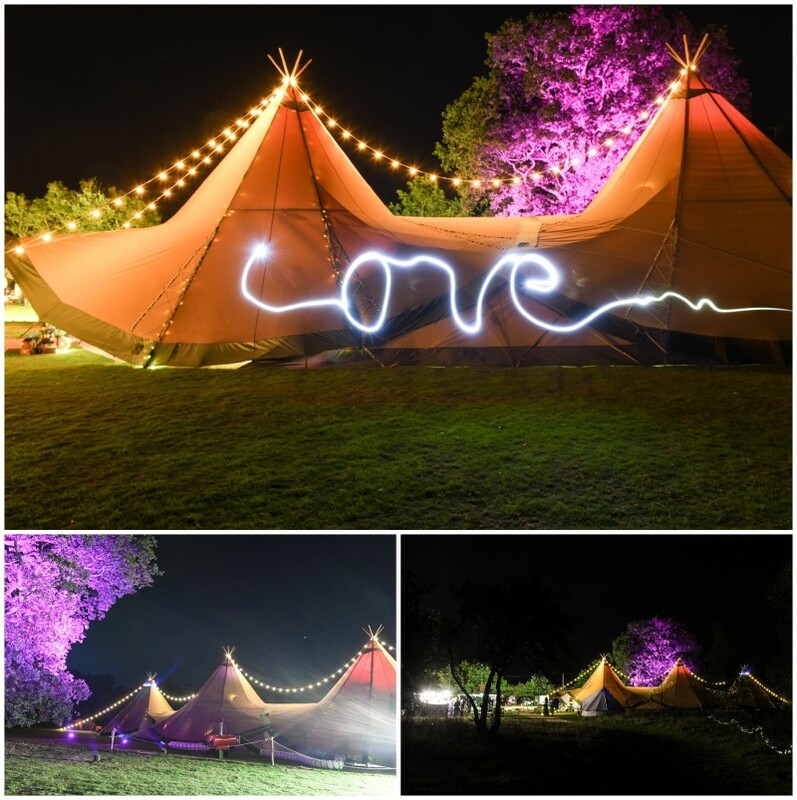 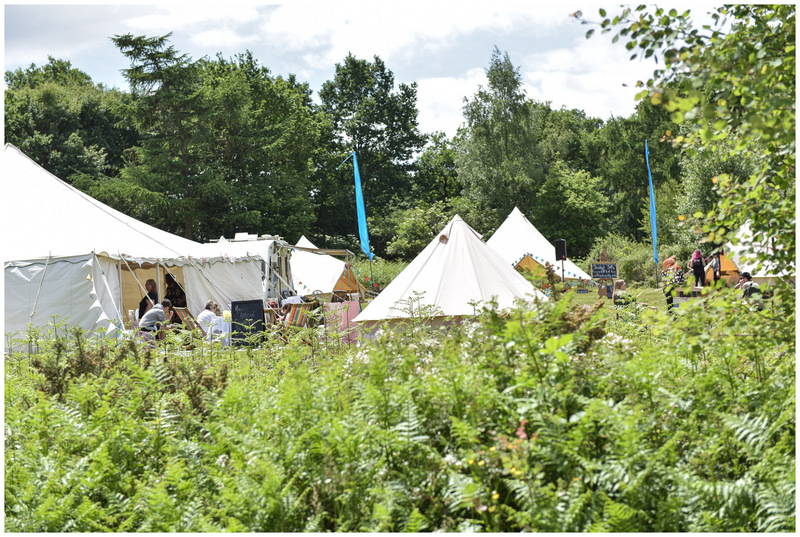 Huge Tipis, Bell tents and marquees were being erected and stages were being built. 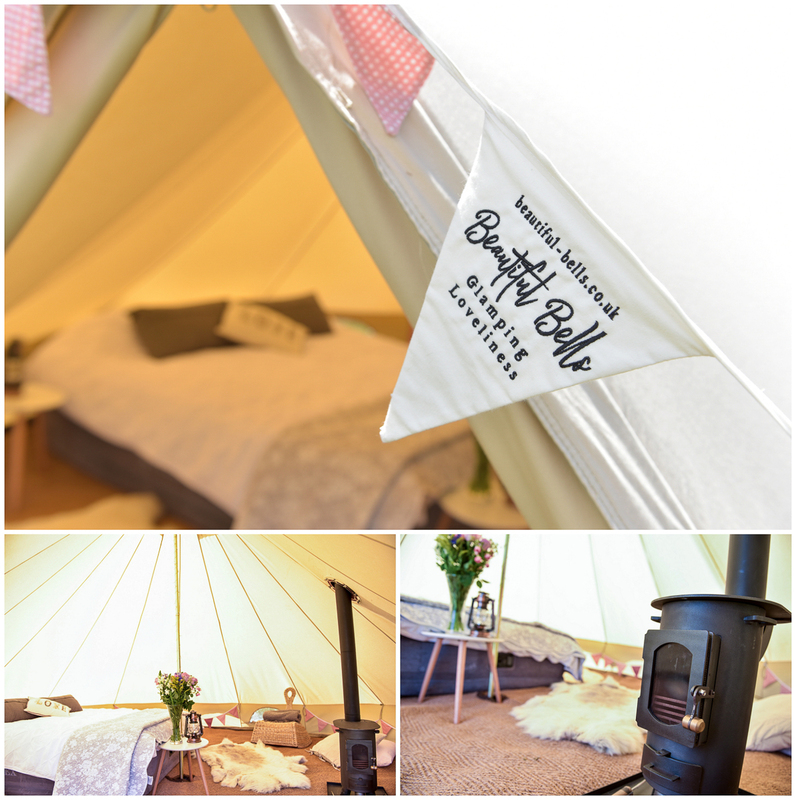 Yurts were being carefully fitted out with sumptuous furnishings. 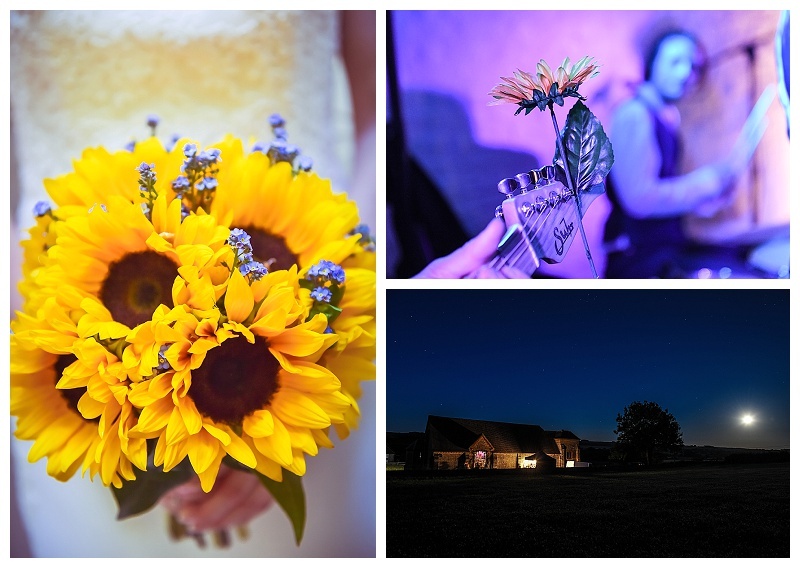 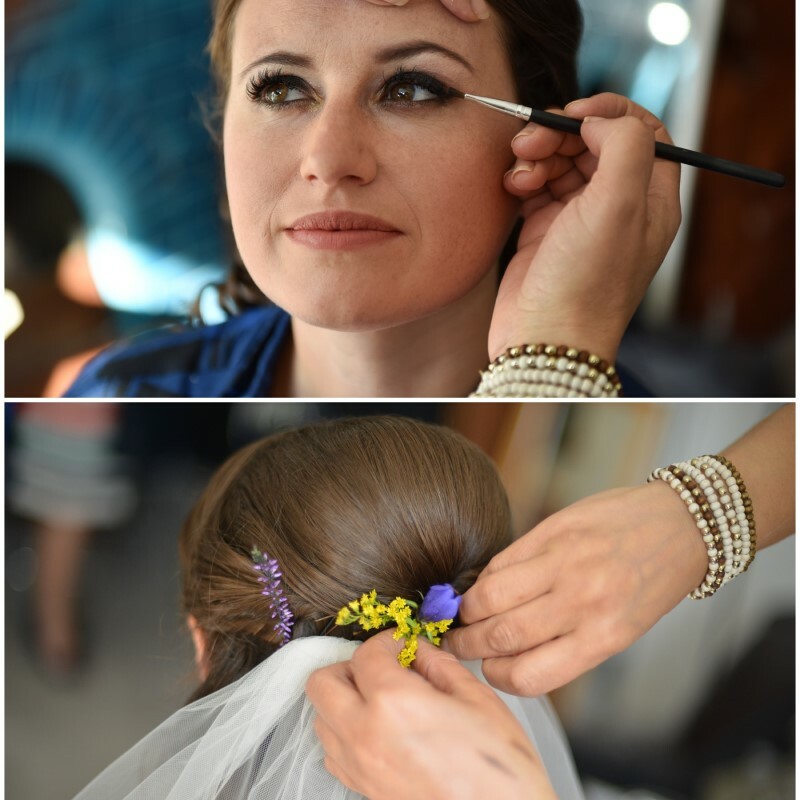 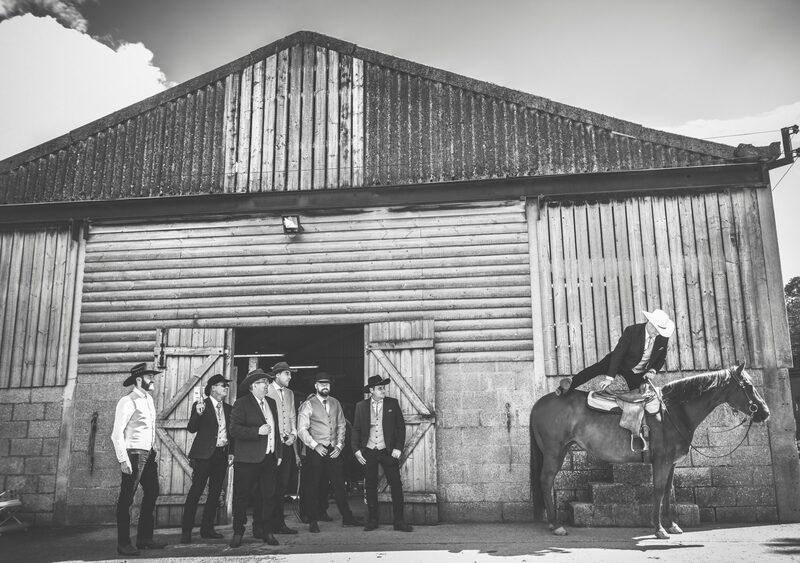 The beautiful Bridal barn was being decked out and teams of staff in hi-viz jackets were busily pointing suppliers in their vans and cars to the right spots to set-up. 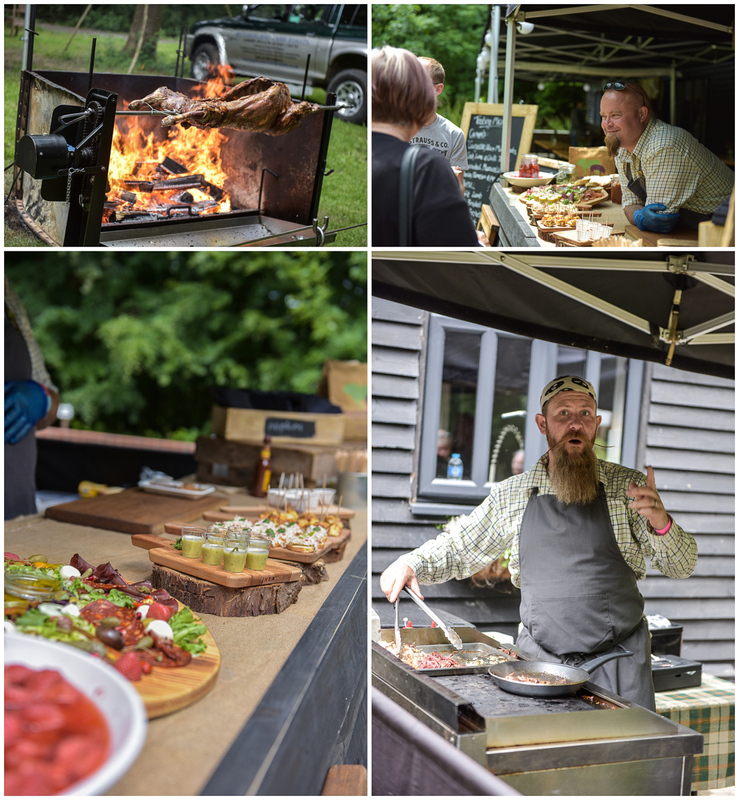 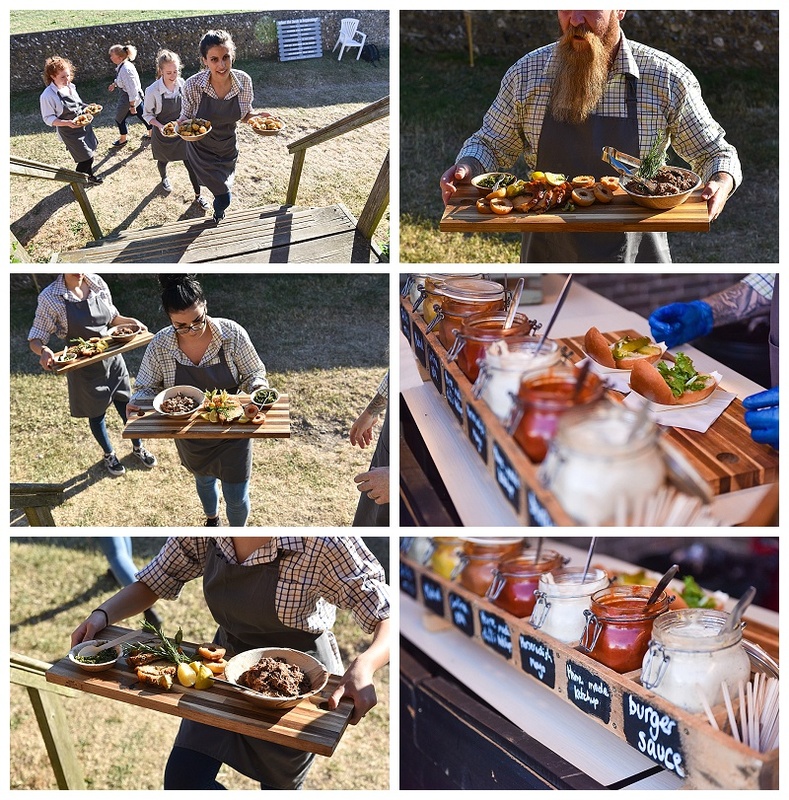 A spit roast lamb was turning slowly over an open fire and canapés were being created. 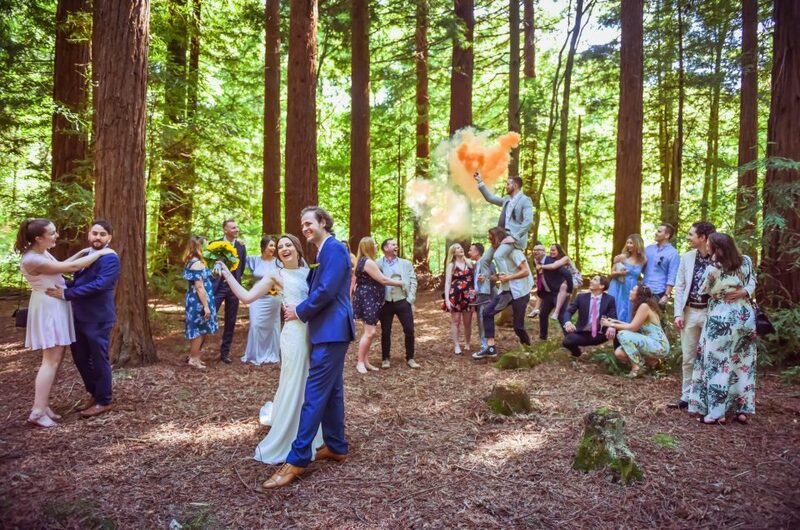 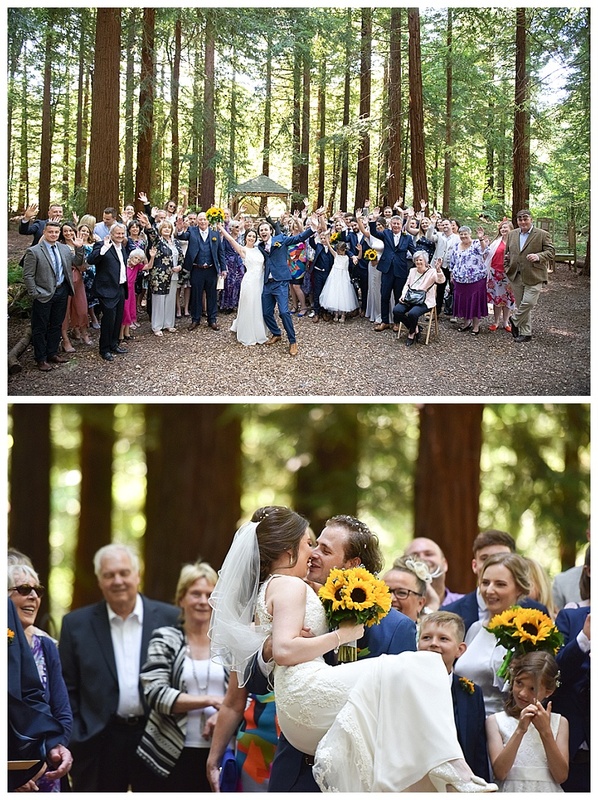 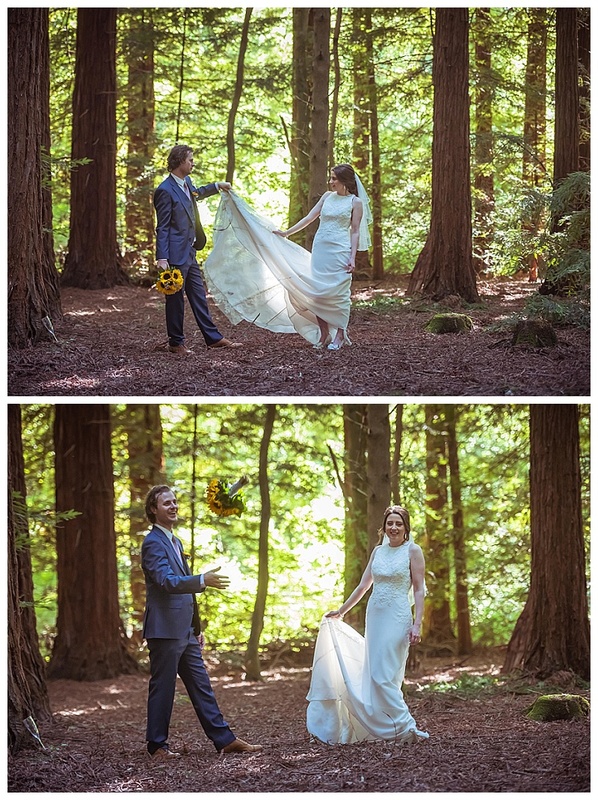 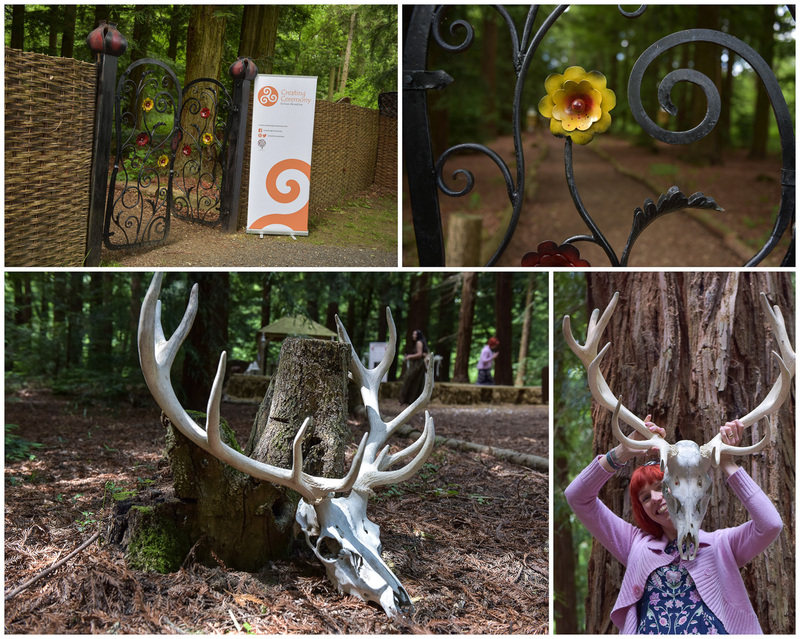 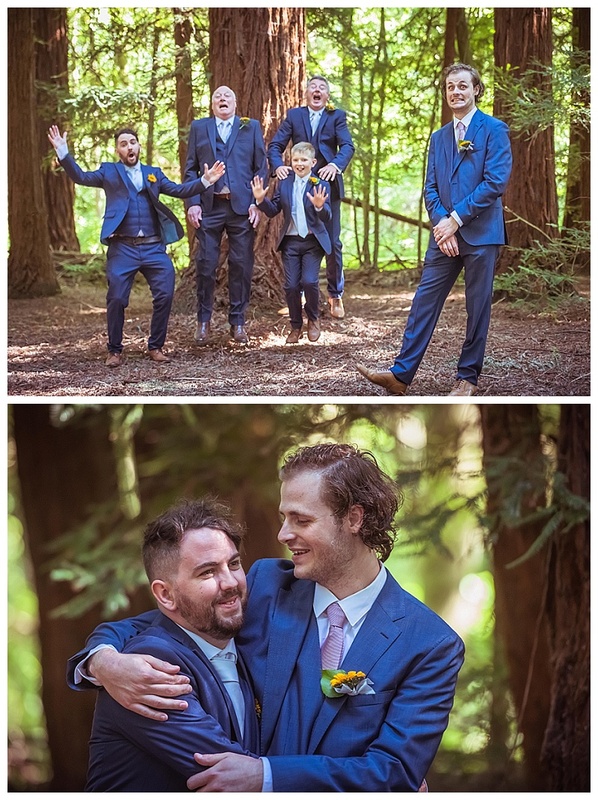 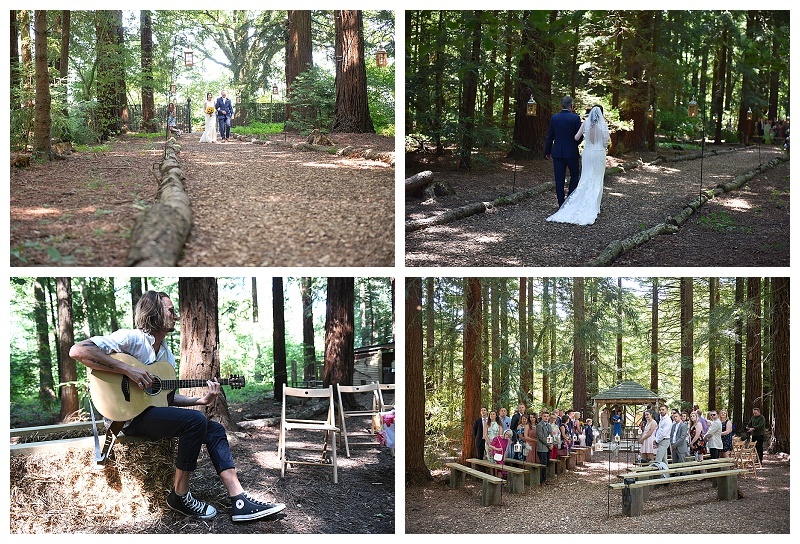 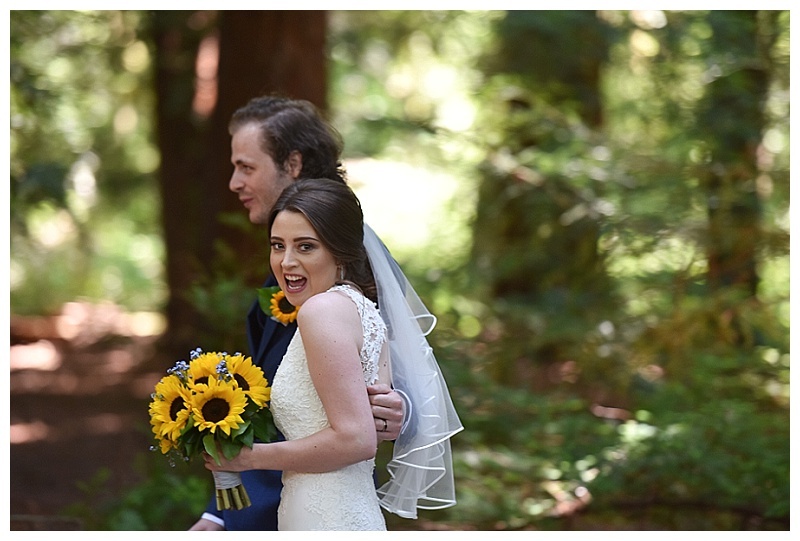 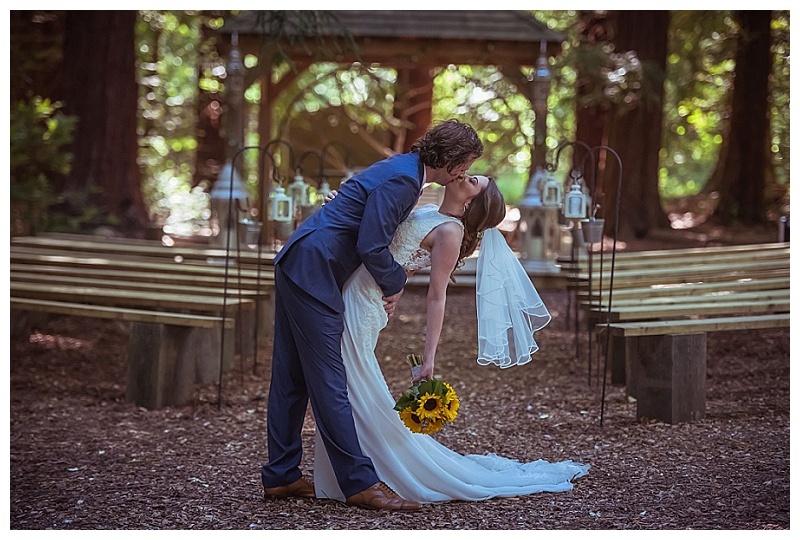 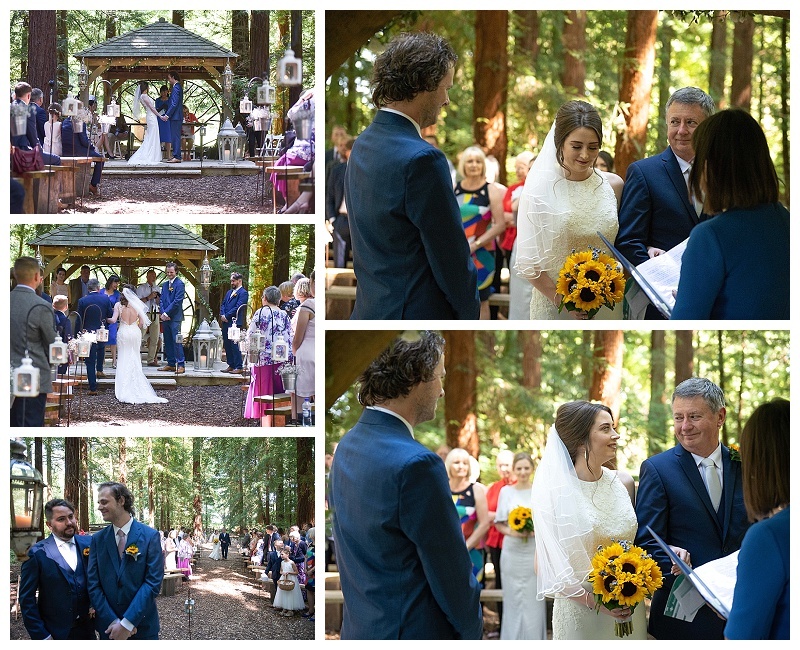 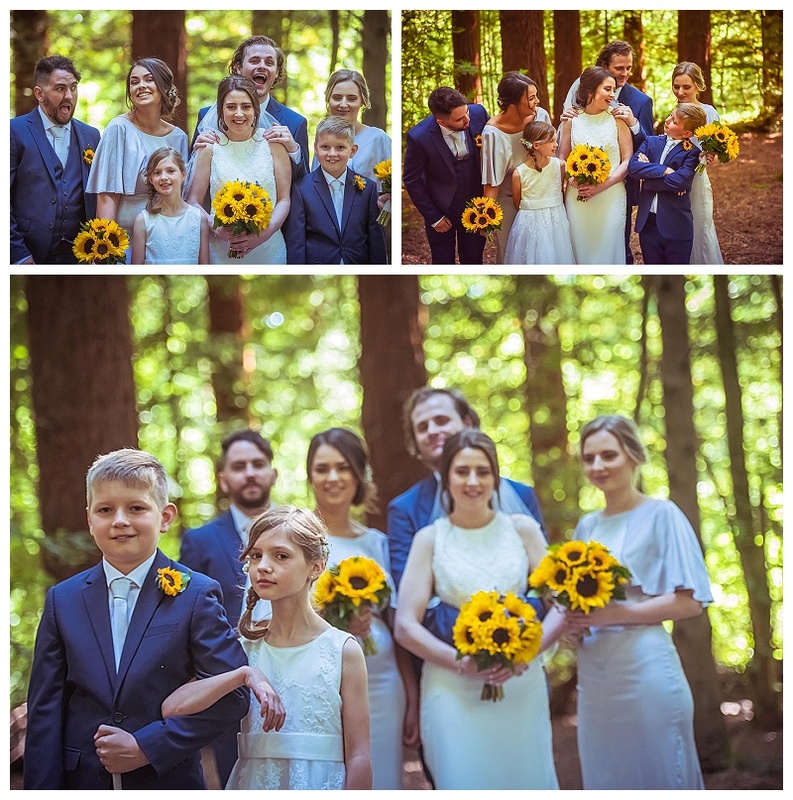 And the amazing, focal point of the site – the little outdoor ceremony site nestling amongst the huge redwood trees at the end of a long, lantern lit path had the sounds of an enchanting opera singer supported by a little girl in a faery style dress practicing a Gaelic dance. 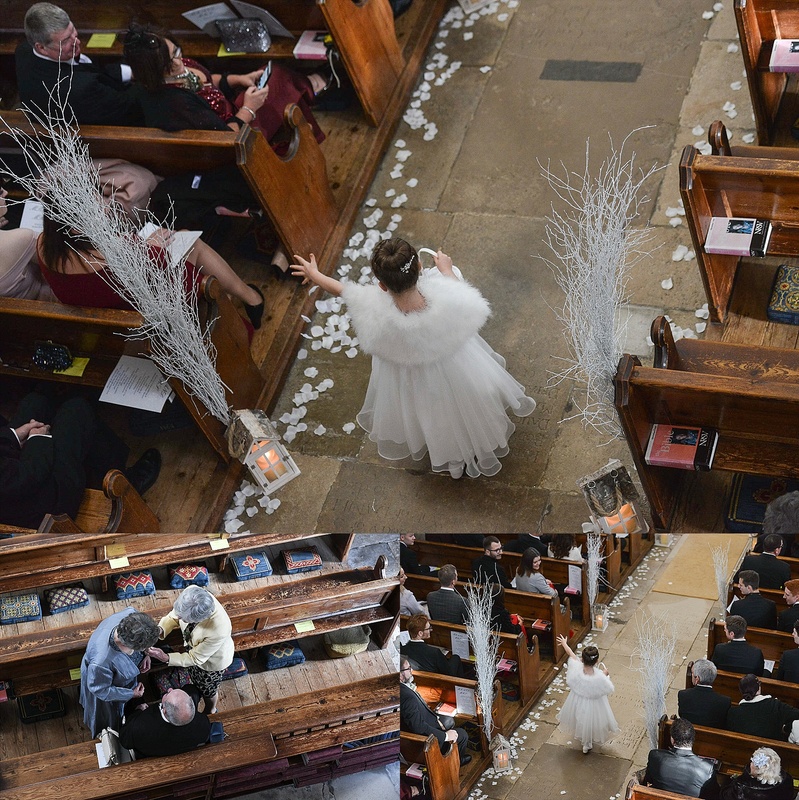 Singers and musicians were tuning up and running sound checks and suppliers were expertly setting out their stalls for the hoards of couples that were soon to arrive. 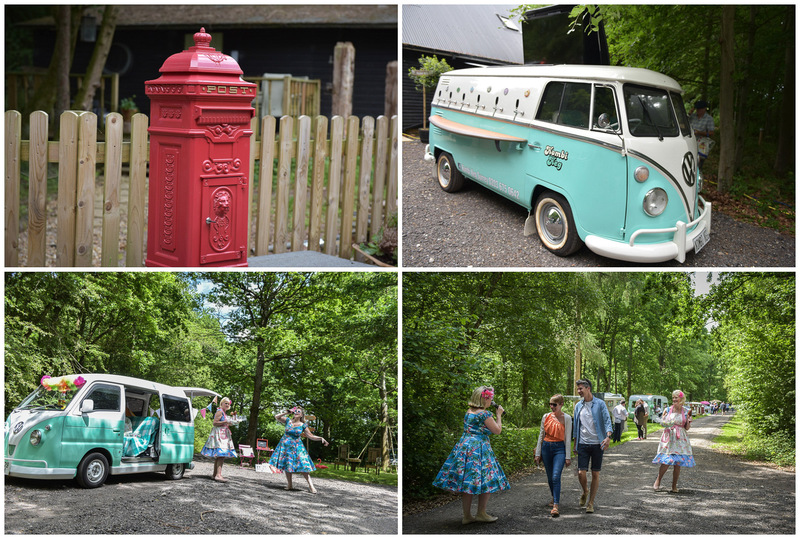 Indeed couples did begin to arrive and, like the suppliers in their vans, were efficiently directed to suitable parking and Sussex Wedfest was declared open. 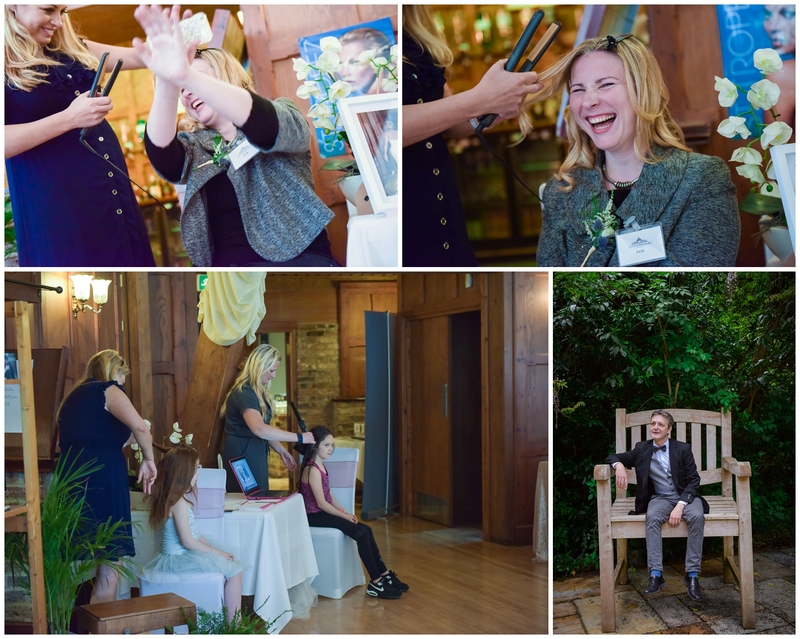 This was indeed an event like no other. 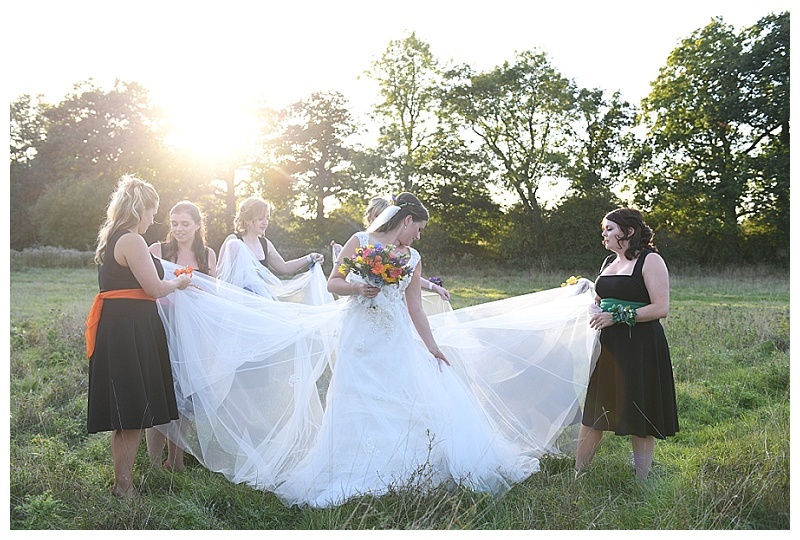 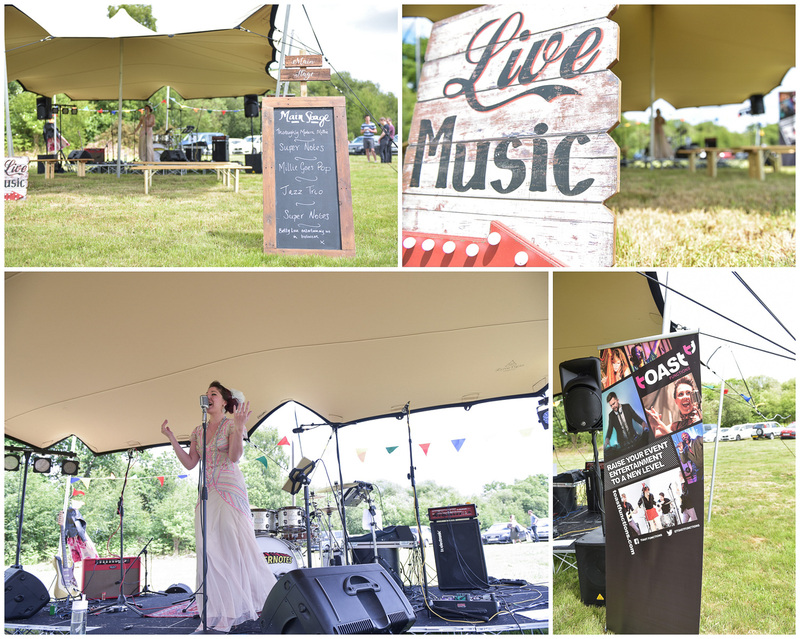 A fusion of summer music festival with a wedding fayre. 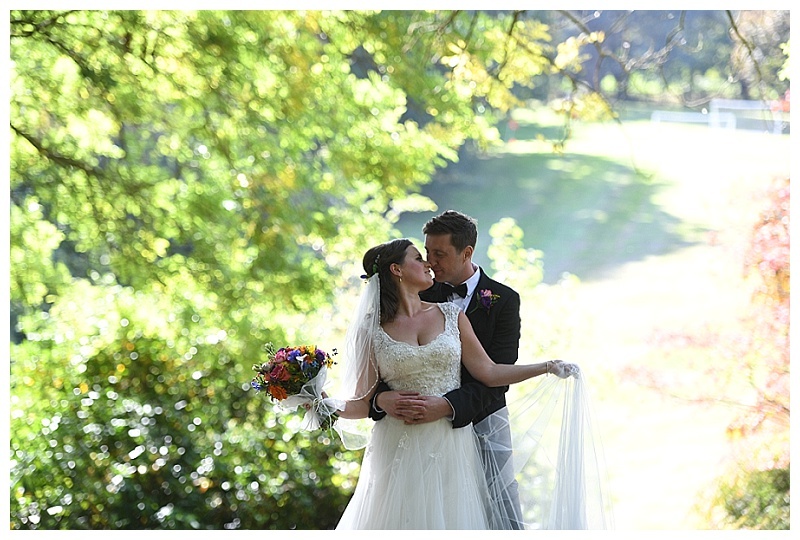 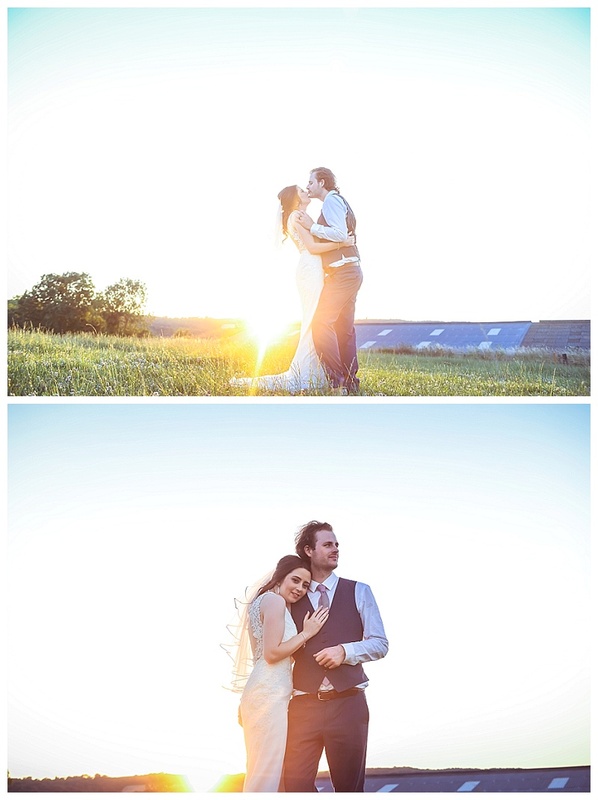 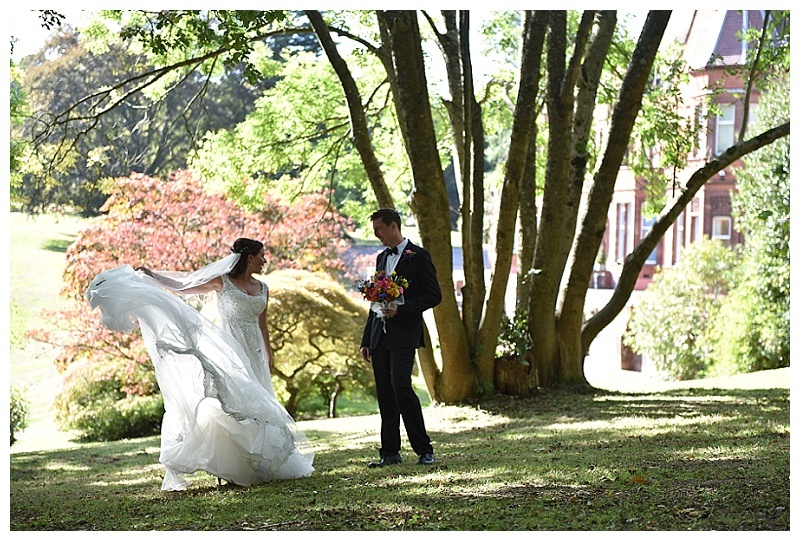 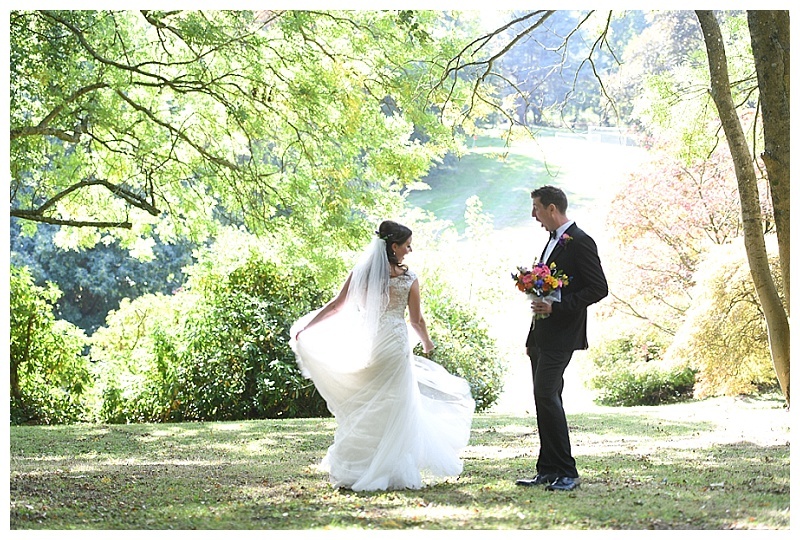 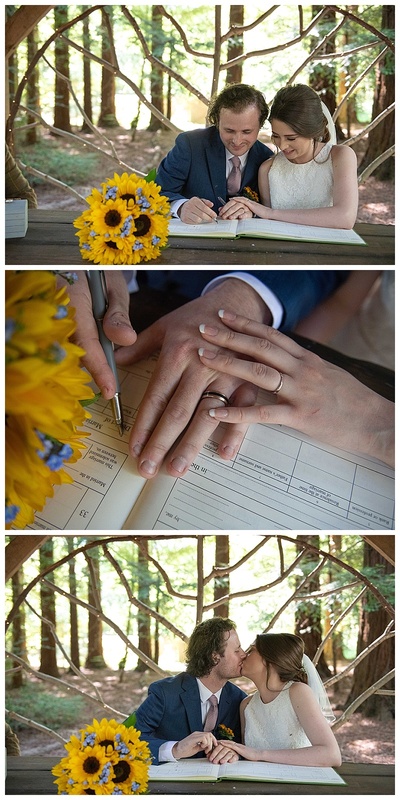 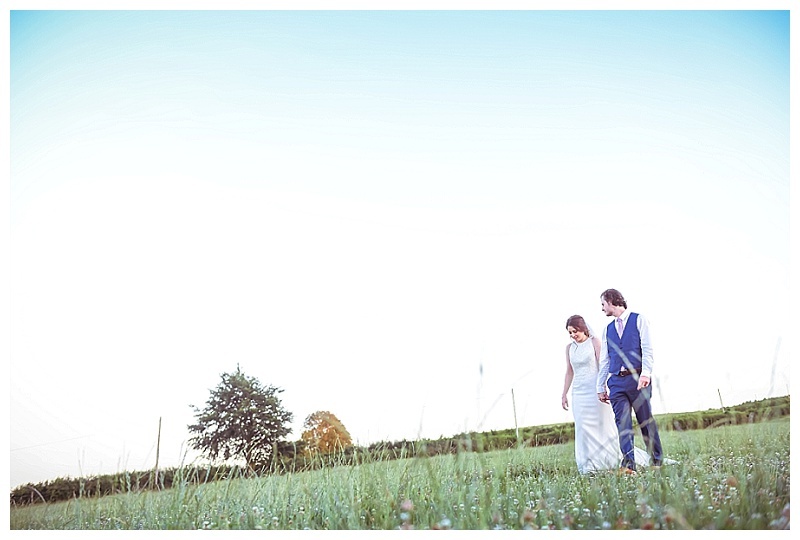 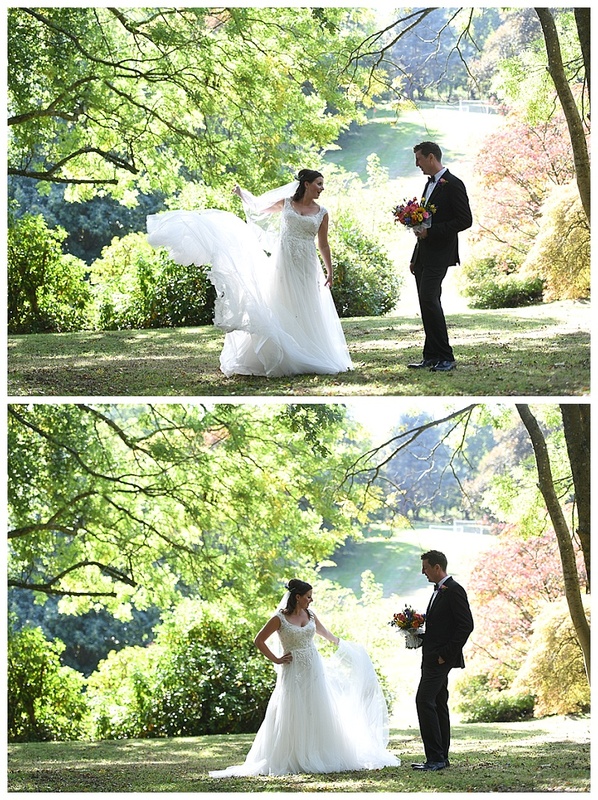 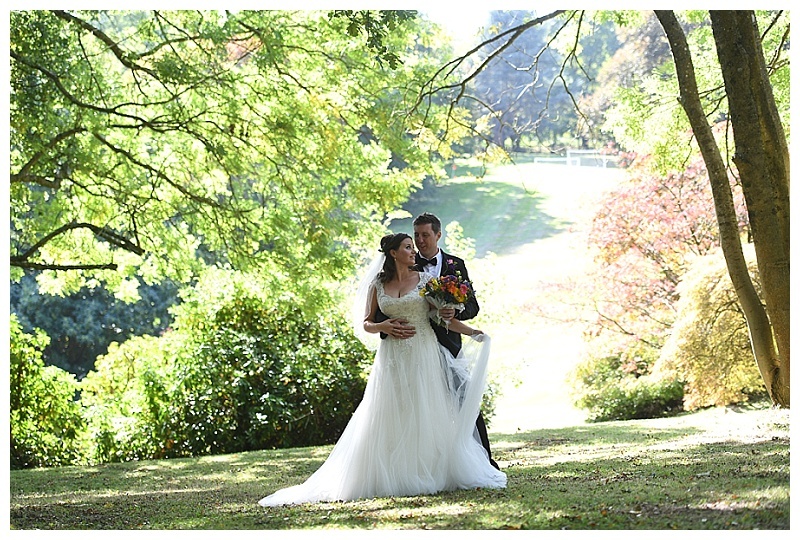 Couples enjoyed a relaxed wander through the meadows, fields and forests. 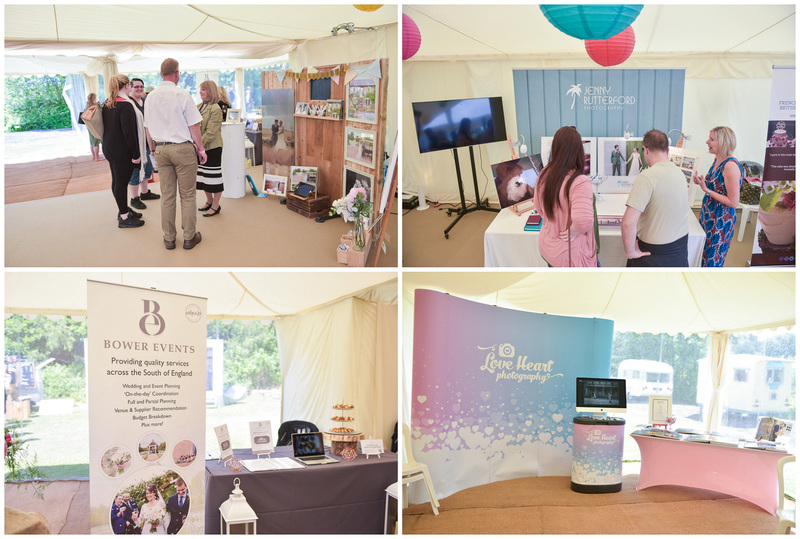 They stopped and chatted to experts about their plans, gathered advice and information and, as this was a ‘paperless’ event – moved onto the next having taken photographs of the stand and placing a tick (or cross) against the corresponding logo in their festival styled lanyards. They floated around sipping cocktails, eating glorious food and listening to the music drifting through the trees. 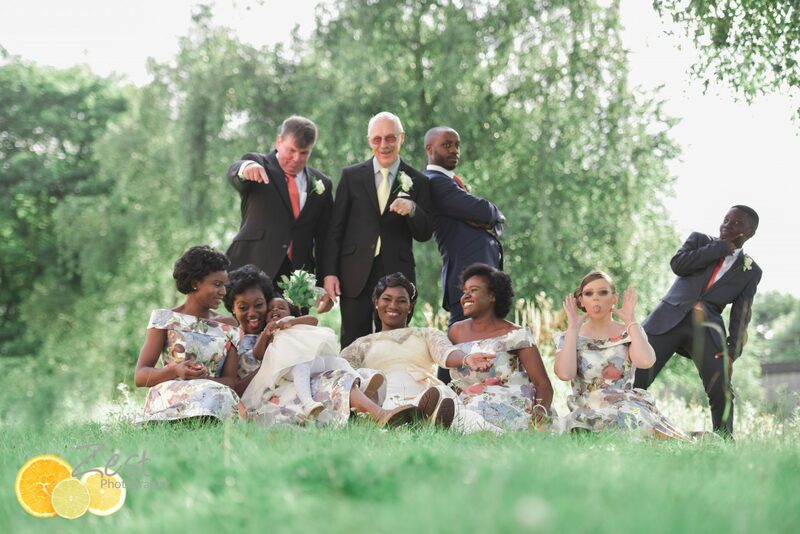 Little groups of lovers, soon to be Husbands and Wives, sat in groups in the grass and compared notes. 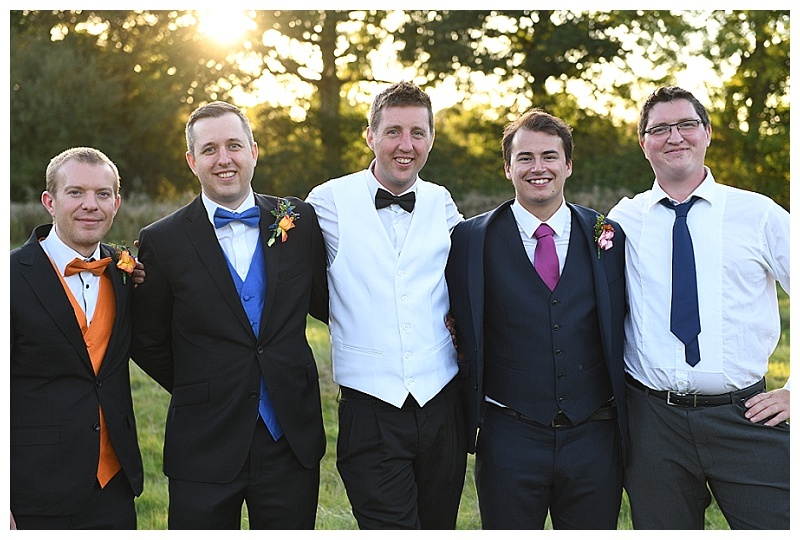 Strangers before the event but now united with a common interest. 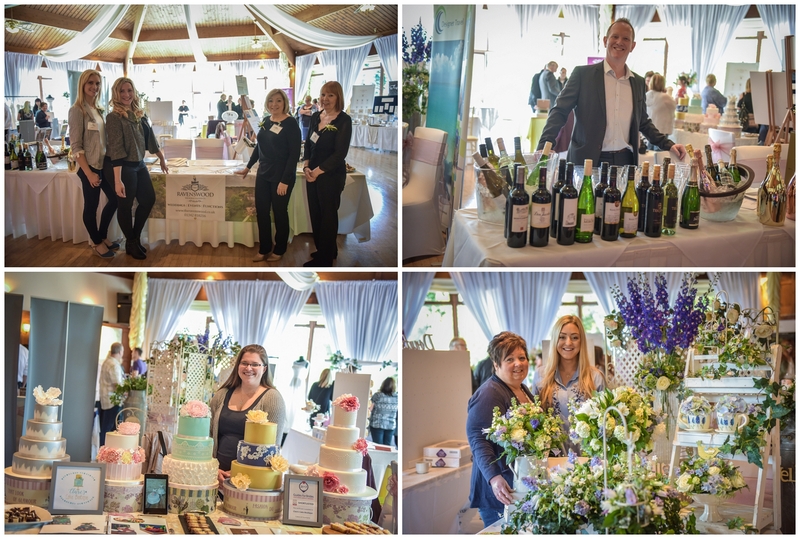 Exhibitors mingled and swapped tales of wedding days past and wedding days to come and compared notes on styling and trends. 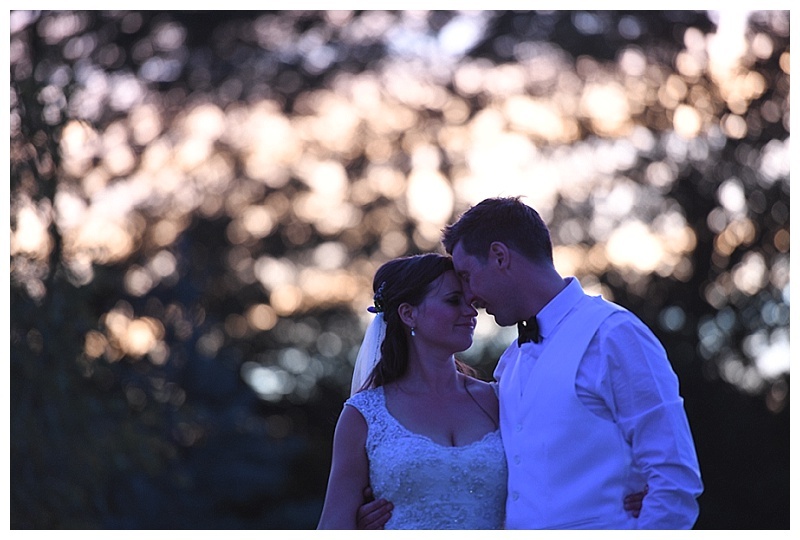 The day came to a close and couples wandered back to their cars. 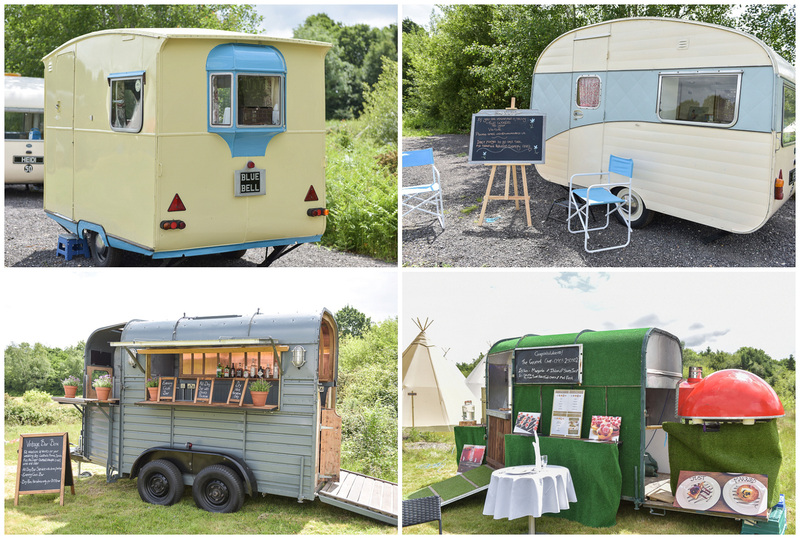 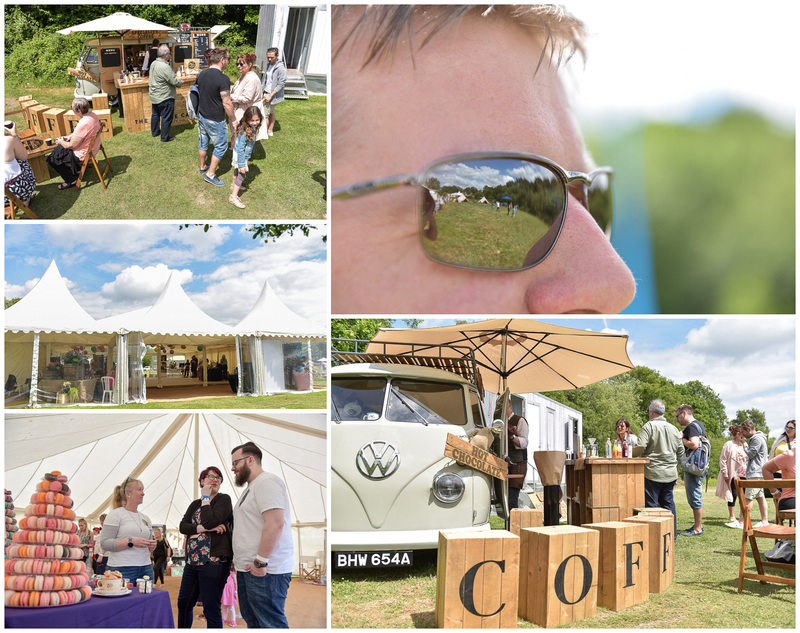 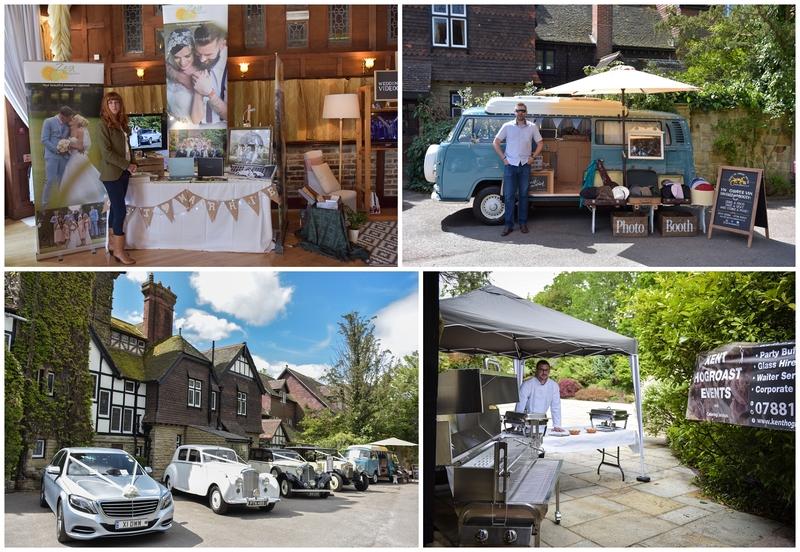 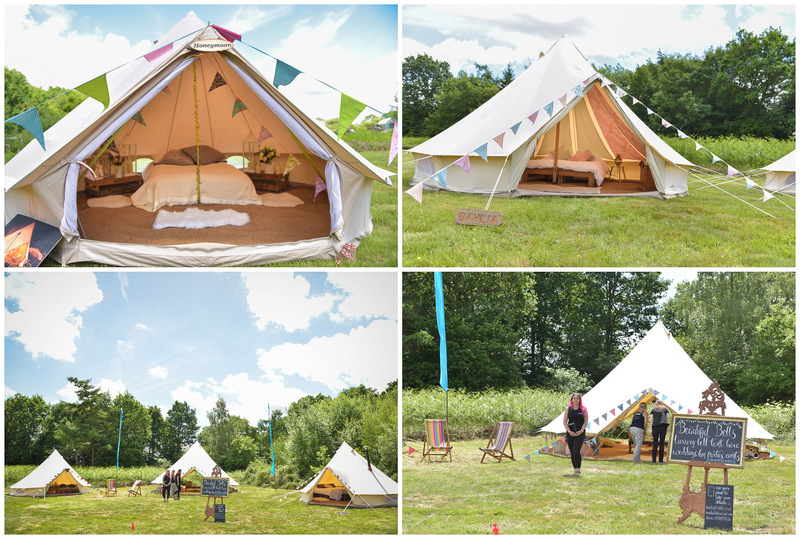 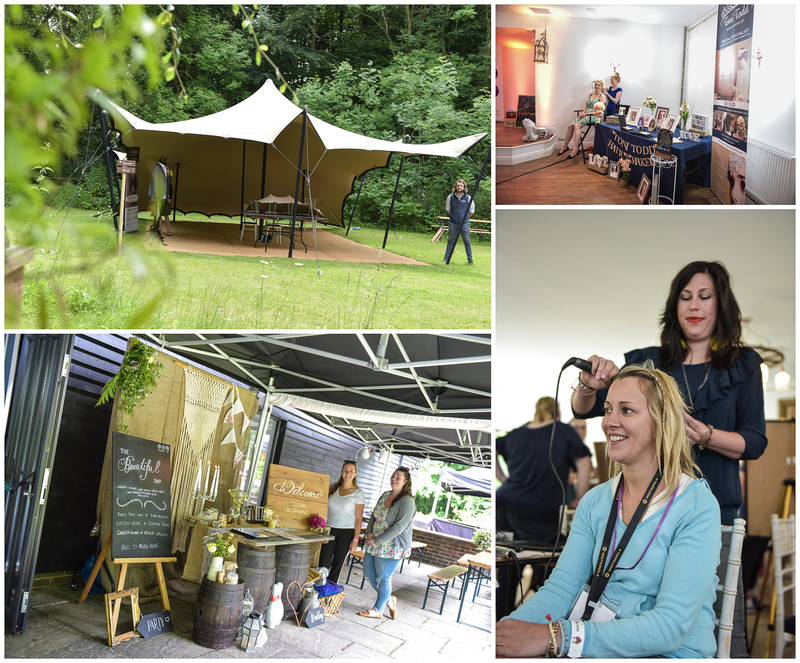 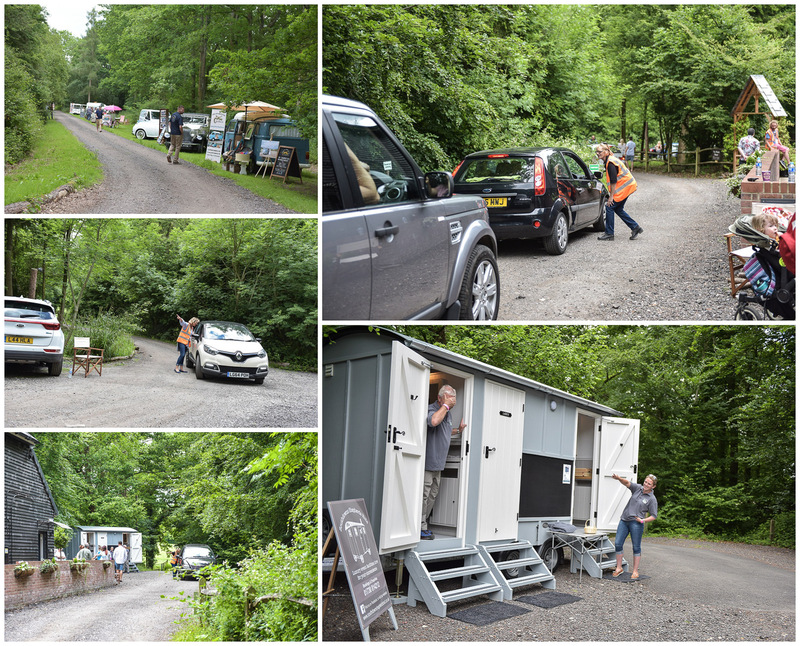 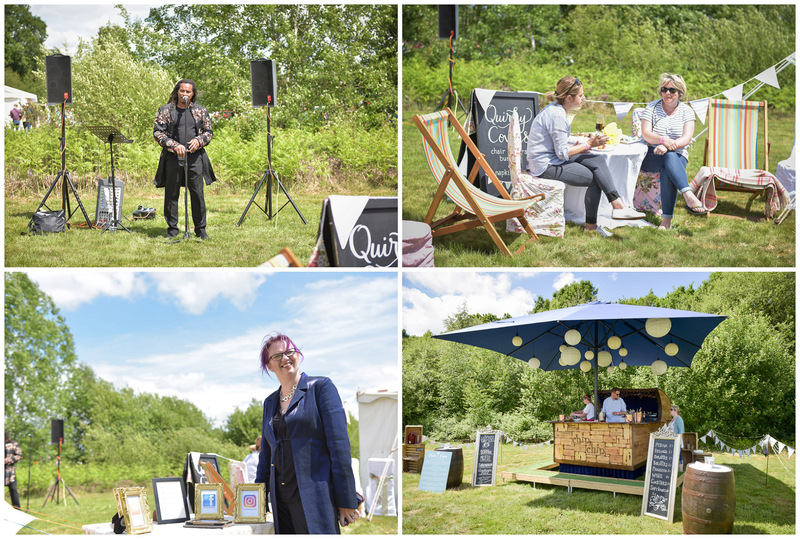 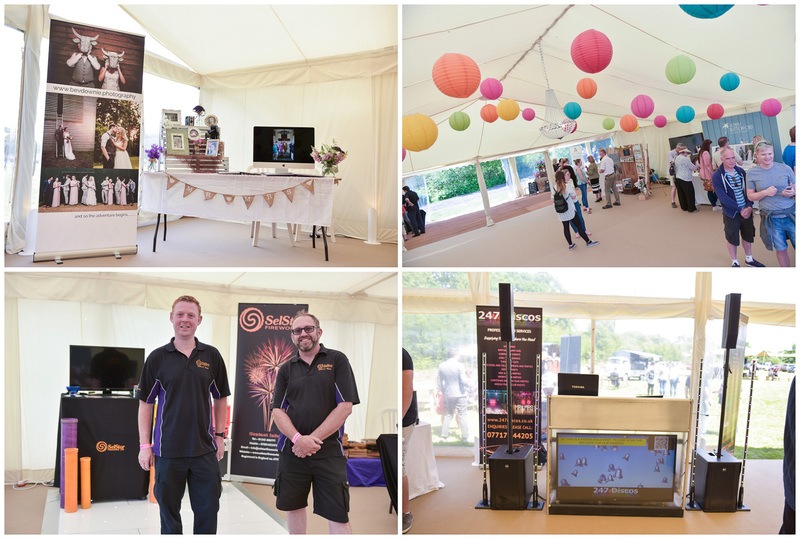 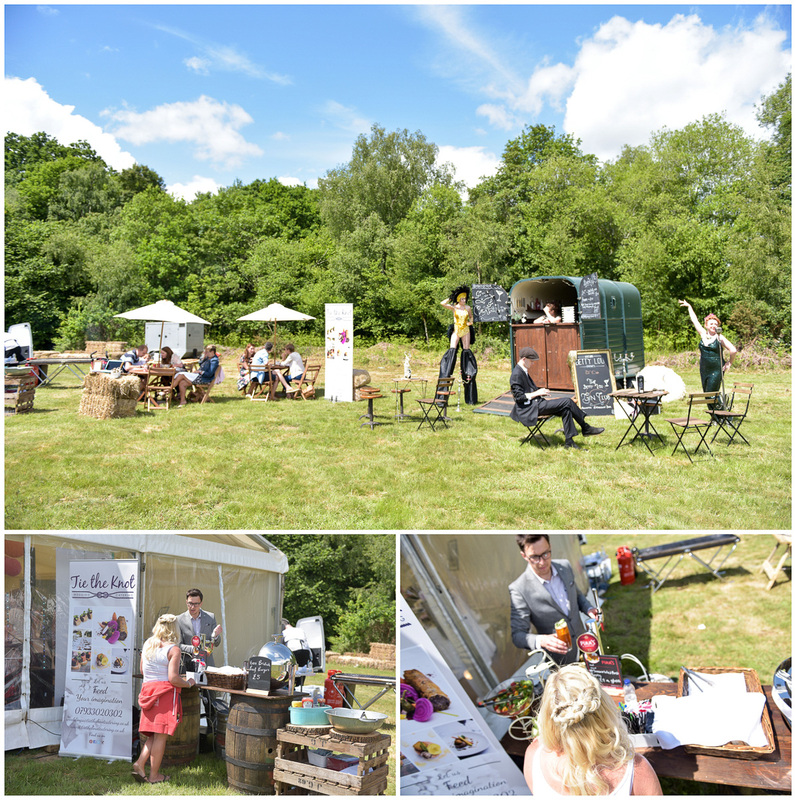 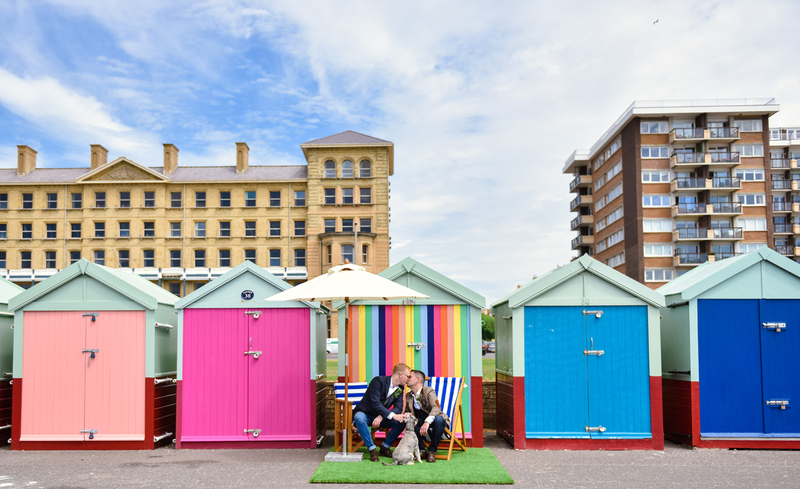 Suppliers started packing away and we couldn’t help but feel the urge to break open a beer, light a camp fire and sleep in Ethel for the night – maybe next time at the September Wedfest event! 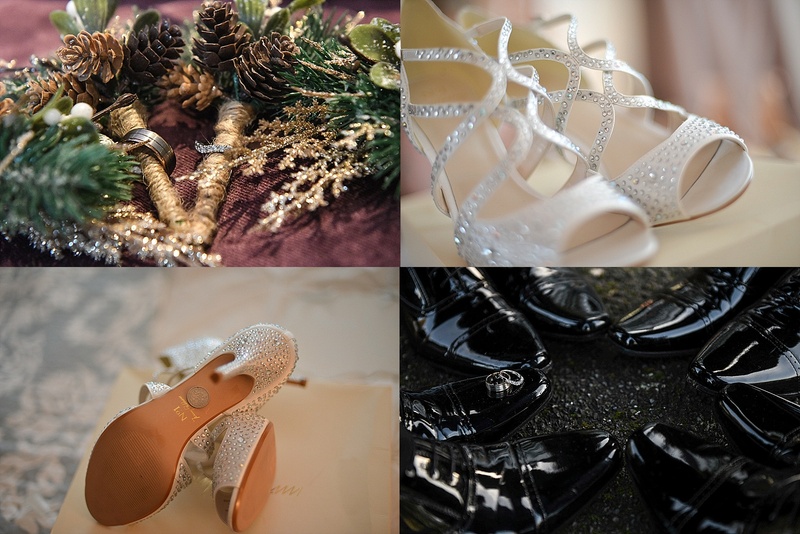 For a full list of suppliers please scroll to the bottom of the page. 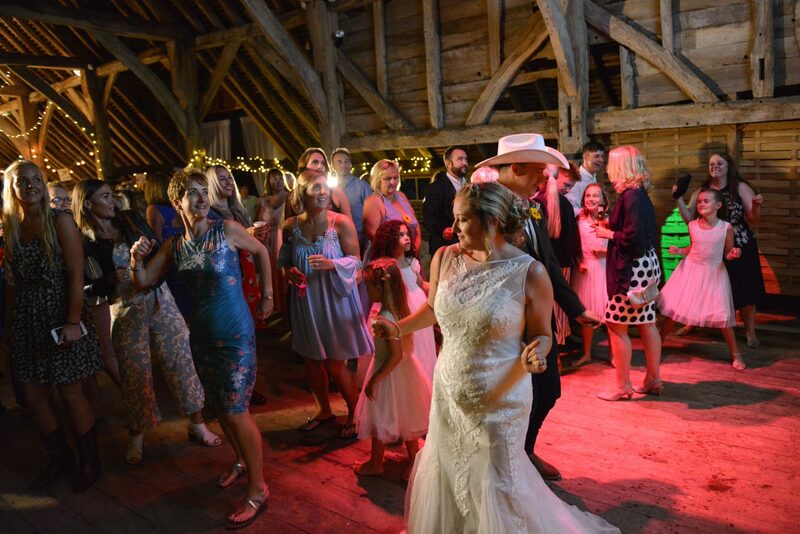 So, we heard that an old friend has just became a partner in a country venue and she asked us to come up and take a look. 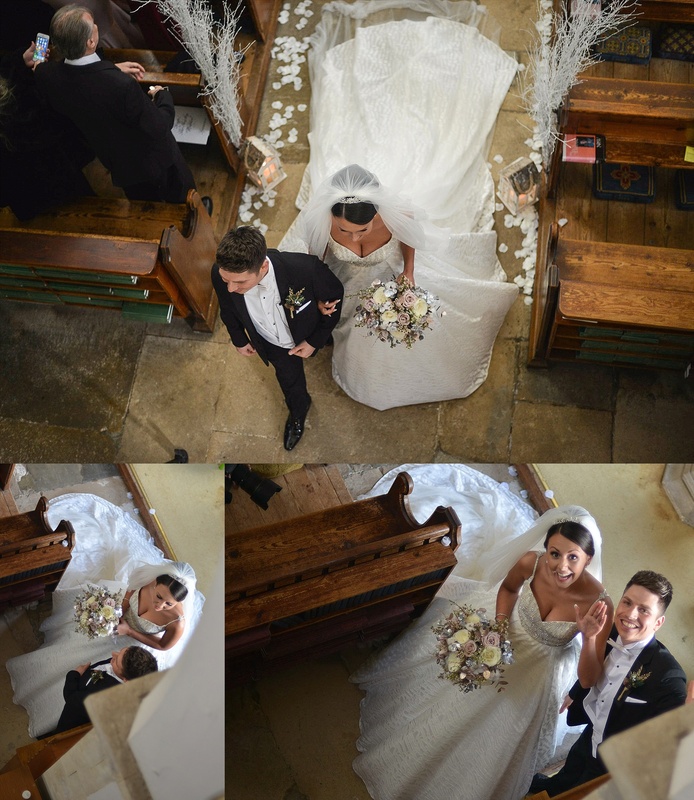 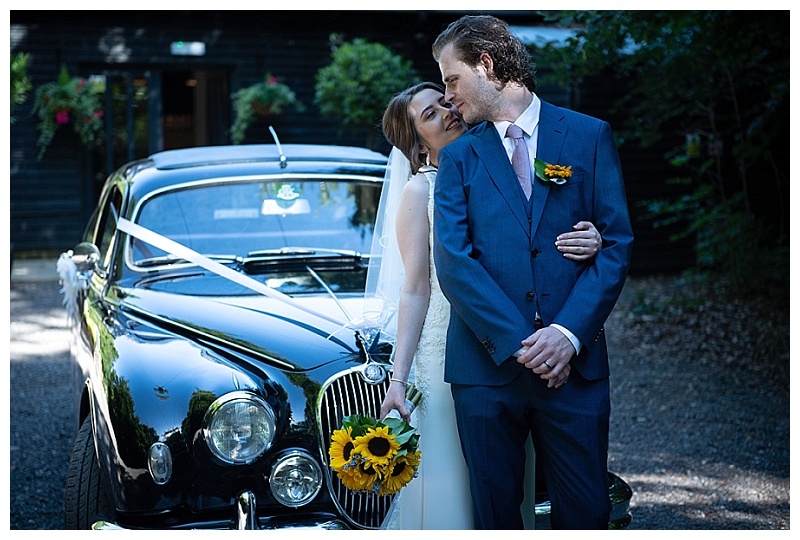 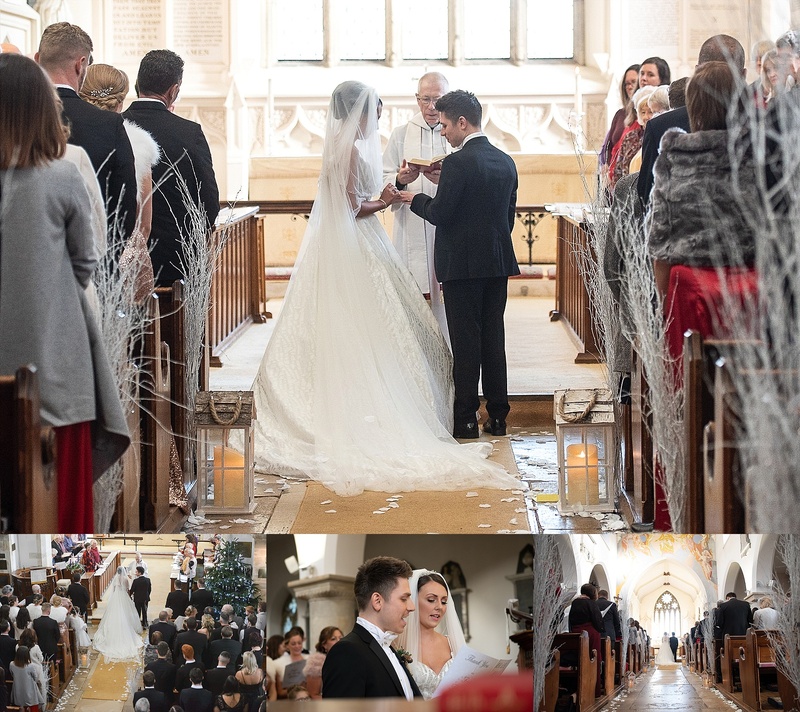 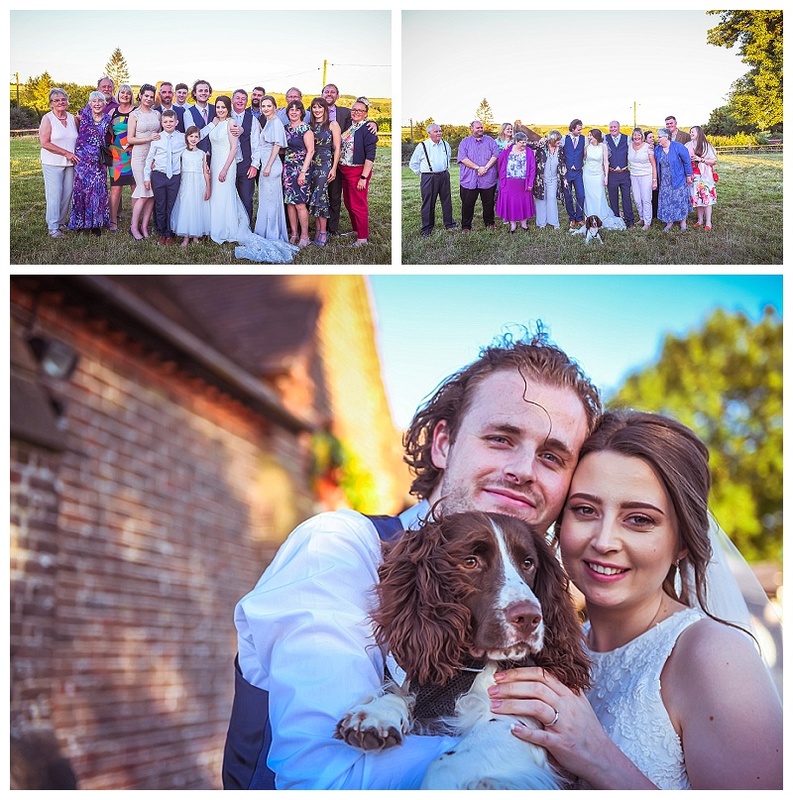 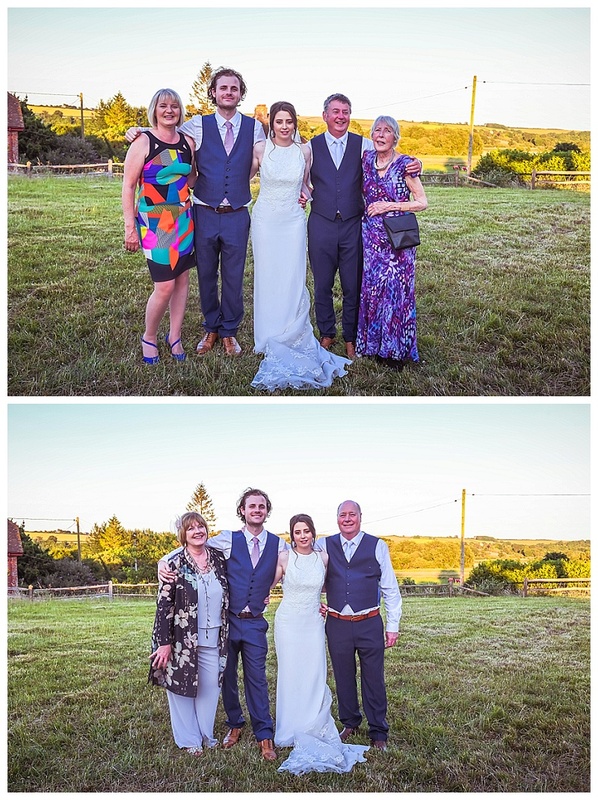 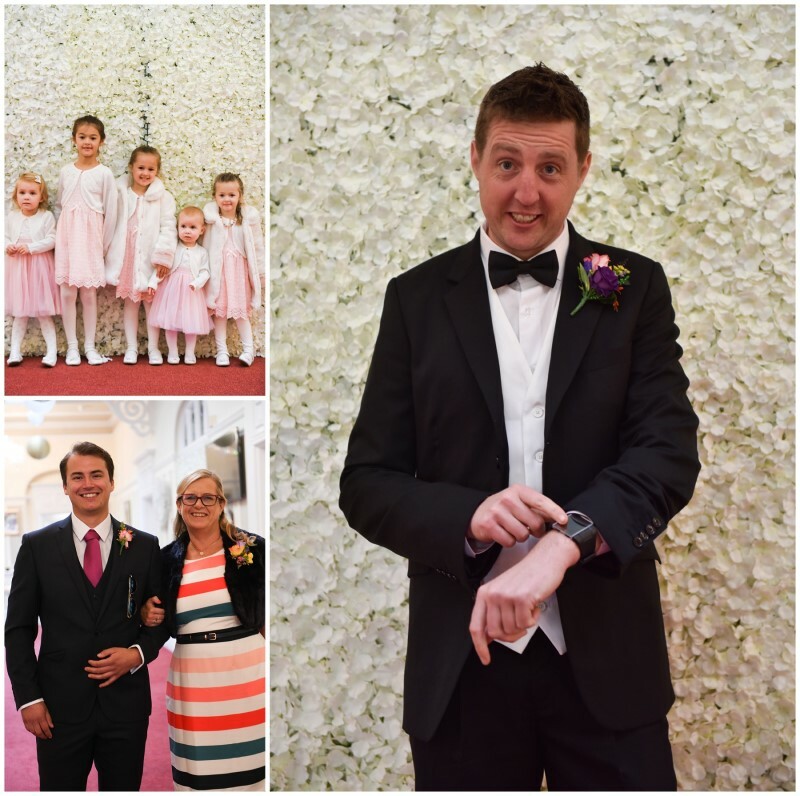 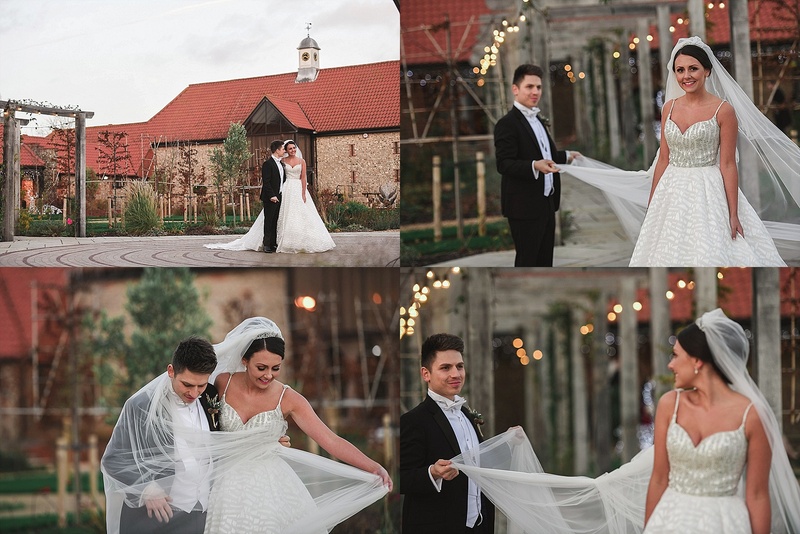 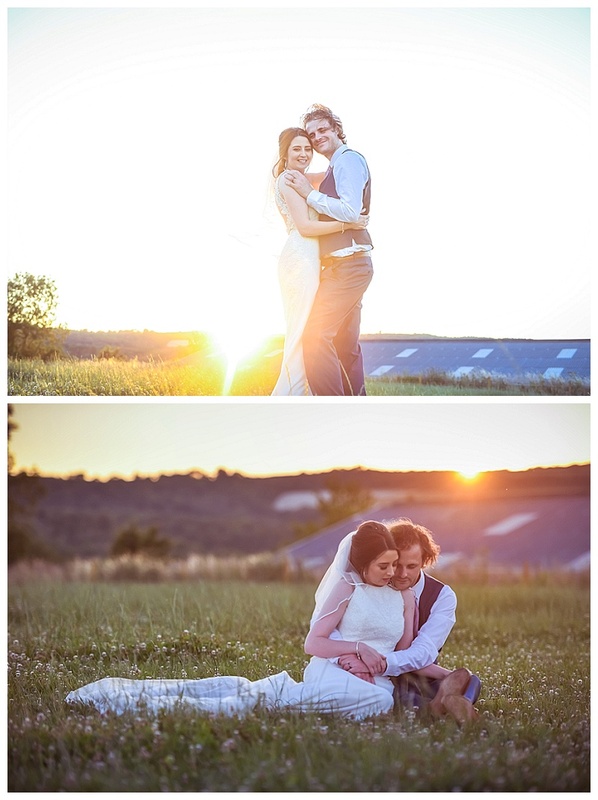 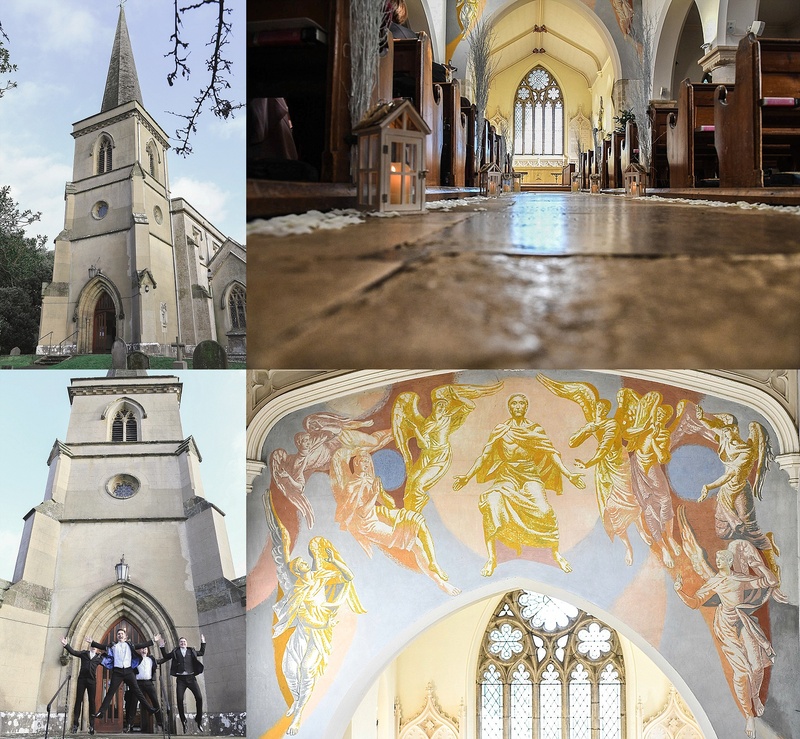 When we arrived we were gobsmacked at the sheer scale and possibilities that this place had to offer and realised that, with Sam’s enthusiasm and experience as a Wedding Photographer, this was going to be one to look out for. 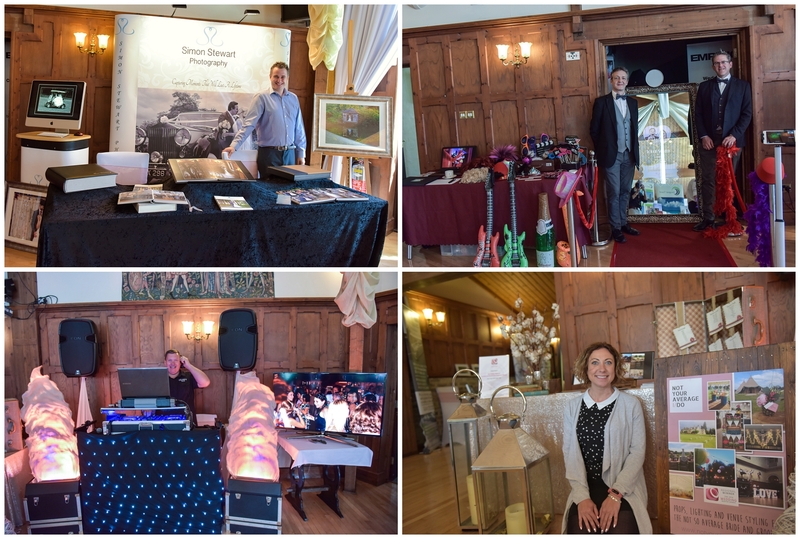 Later on we heard that Empirical were to hold a wedding fayre at The Ravenswood and they invited us along to exhibit – of course we said yes! 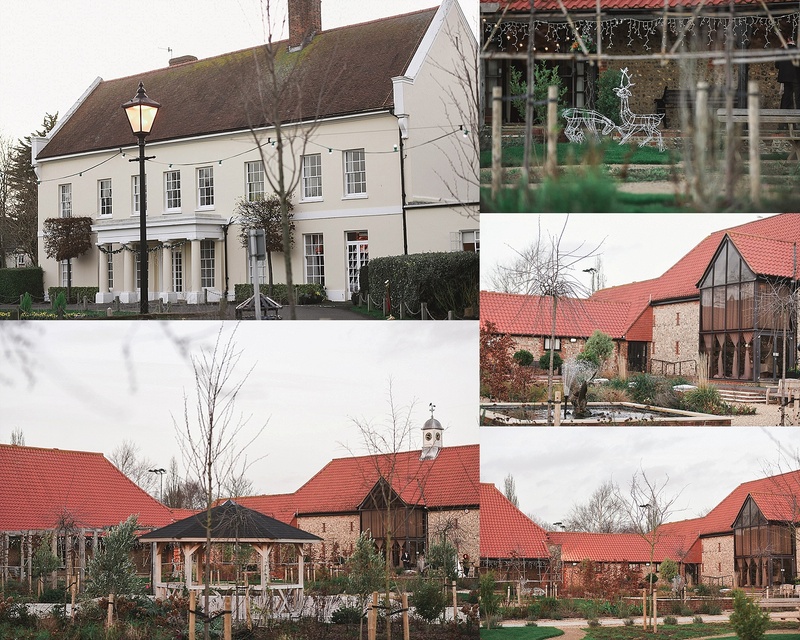 The thing about The Ravenswood is that it gives very little away as you approach it. 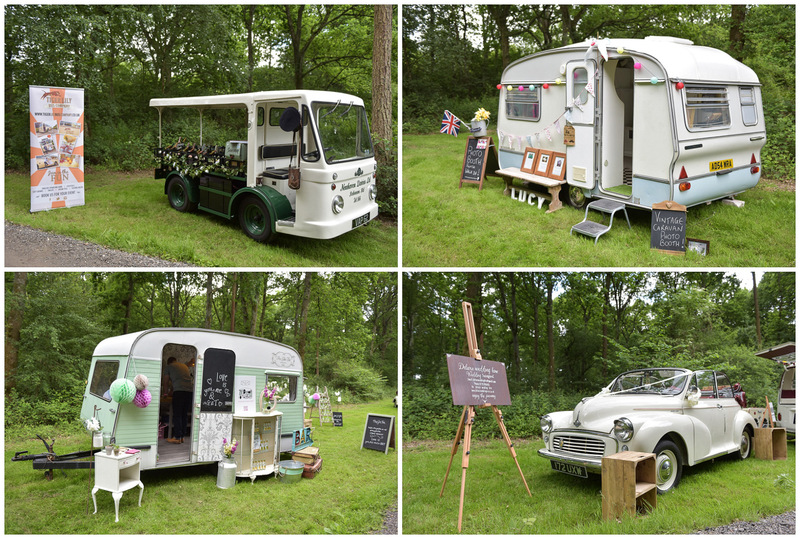 The display of vehicles from a very old vintage Rolls Royce to the bang up to date Aston Martin and the quirky camper reflected the depth of style attainable here. 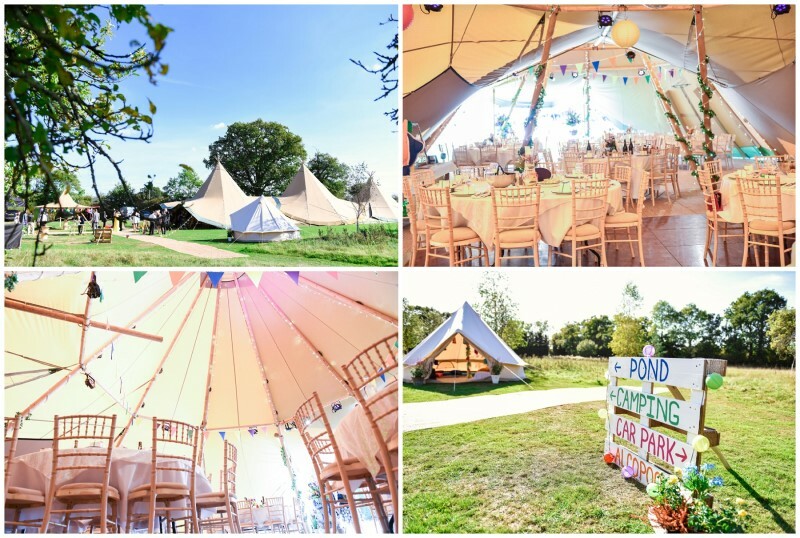 Yes it’s large and yes it obviously has history but does that really cut it in the, er, cut-throat world of the wedding venue? 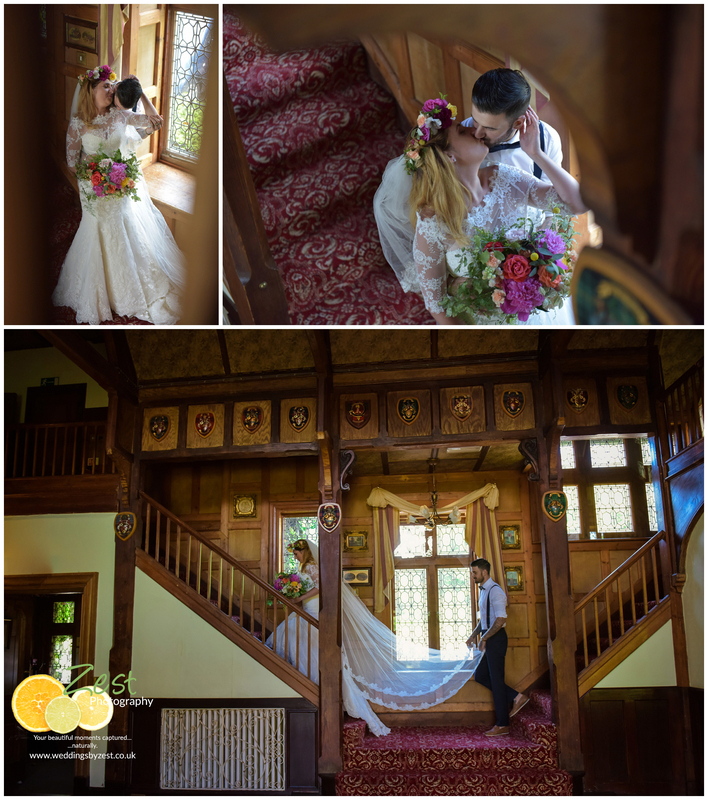 From our previous meeting we knew that it had more to offer but weren’t ready for what lay behind those very old oak panelled doors. You see the thing about this venue is the way it presents itself. 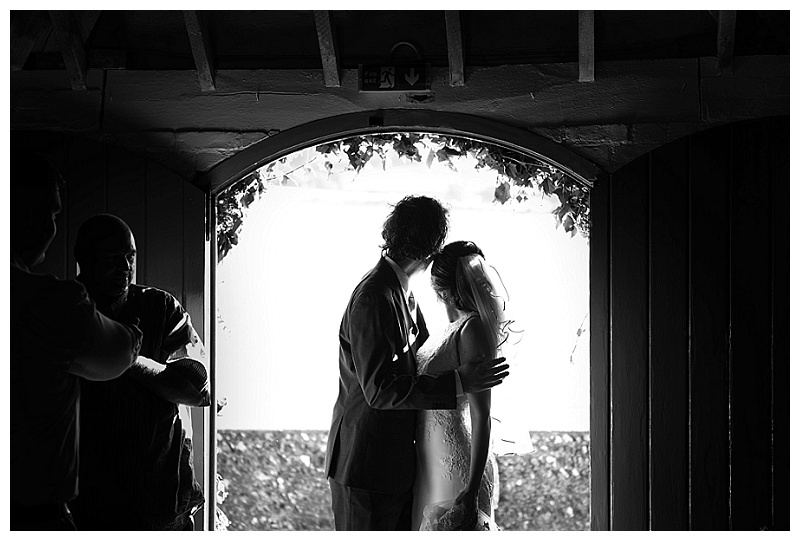 Walk through the door and you get the feeling of history, of parties, of revelry and maybe even a little tragedy. 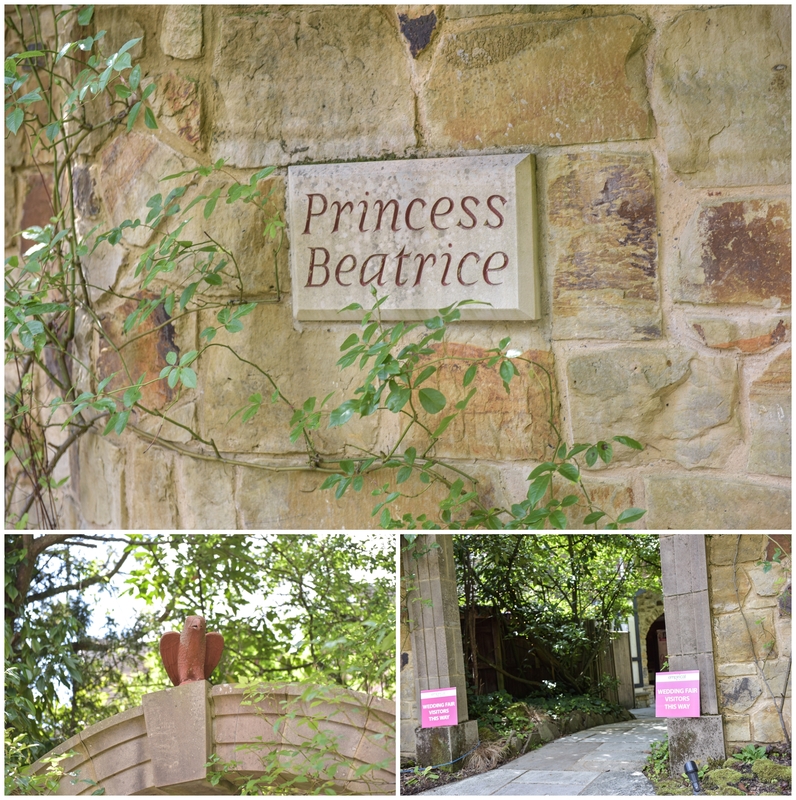 Move through to the Princess Beatrice Suite and everything starts to become clear. 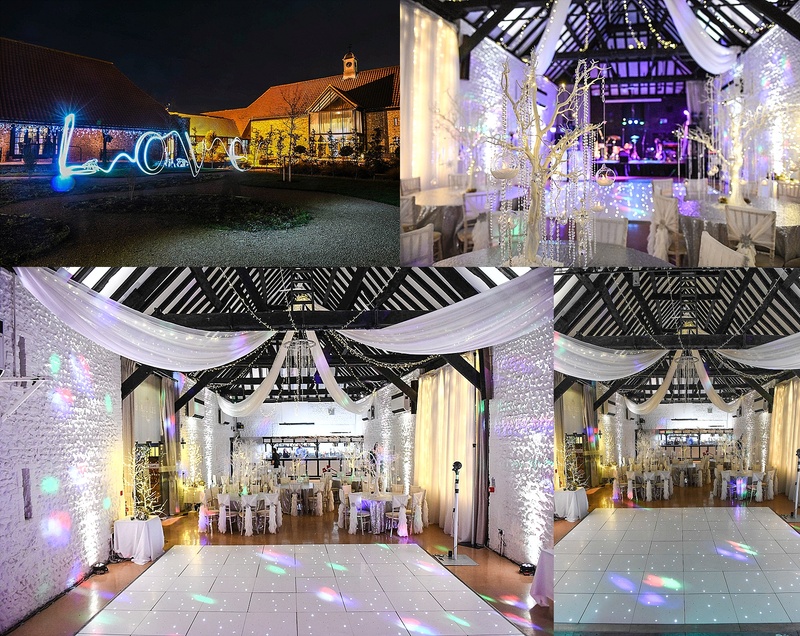 Empirical had teamed up with Mulberry Events to set the room up in magnificent style, no mean feat as the huge ceilings must be 30 to 40 feet high. 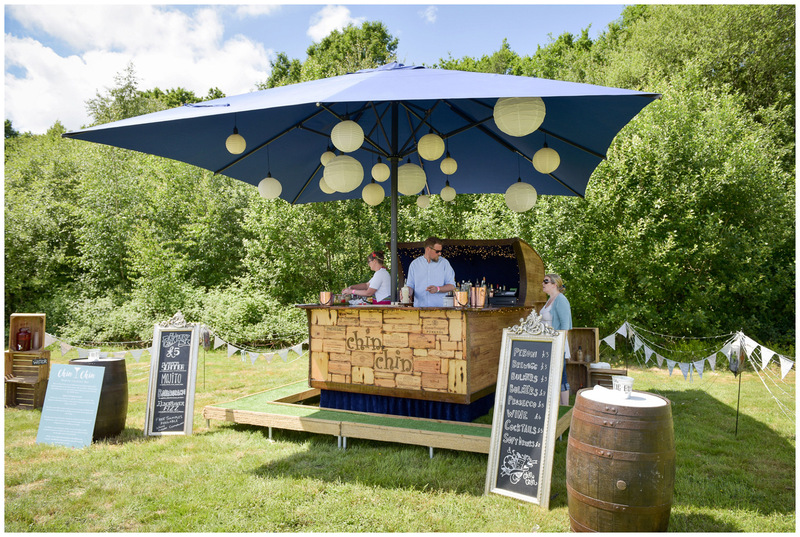 A permanent bar is nestled neatly in amongst the wonderful oak panelling and you get a feeling of space, style and magic – without losing that all important historic vibe. 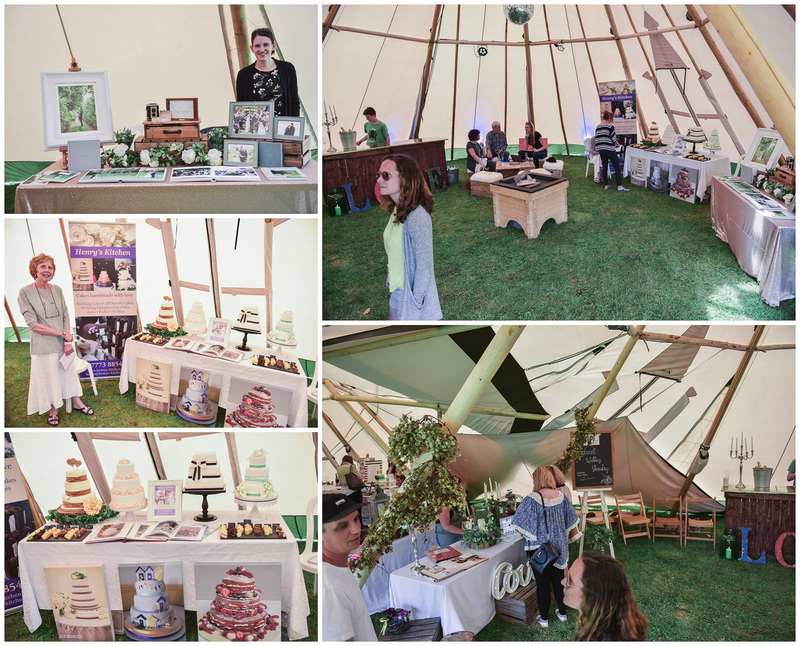 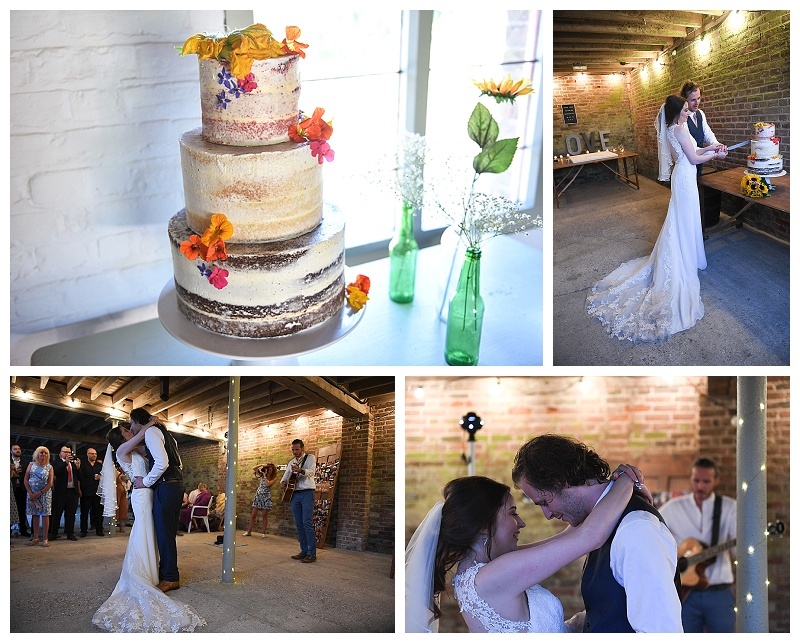 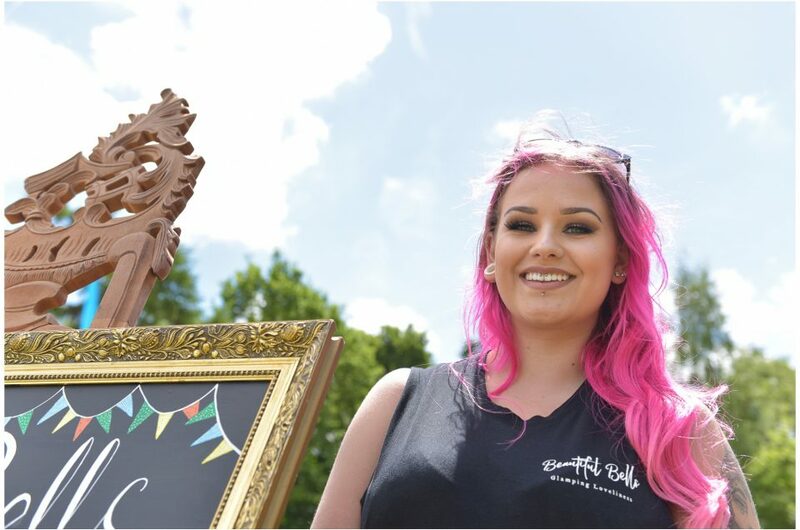 Suppliers had gathered from all sorts of locations to help Sam and her team re-launch this great venue and to advise would be Brides and Grooms on the latest cakery, fashion, food and flowers to name a few. 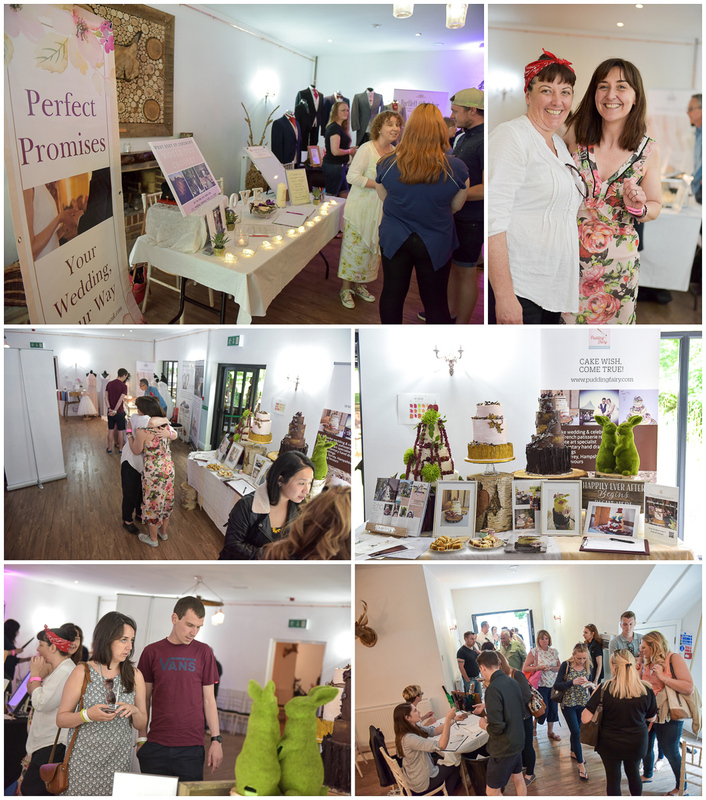 Empirical had thoughtfully laid the exhibitors out so that the couples could float through, free glass of prosecco in hand, without missing anything. 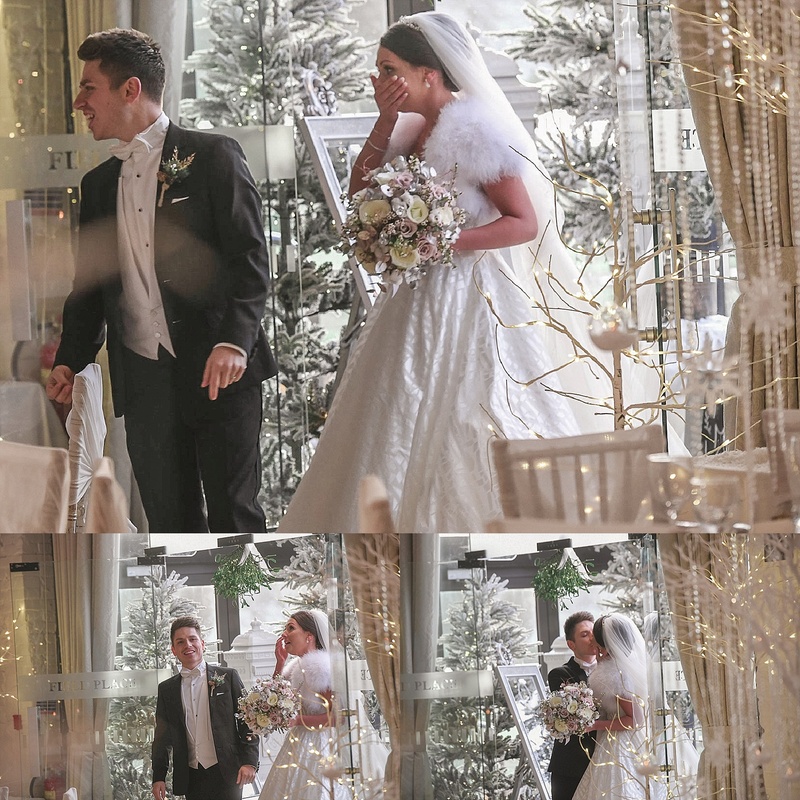 The room is encased in large glass doors and windows bringing in tons of light and opening onto the glorious patio area which hinted at the treat that was to come. 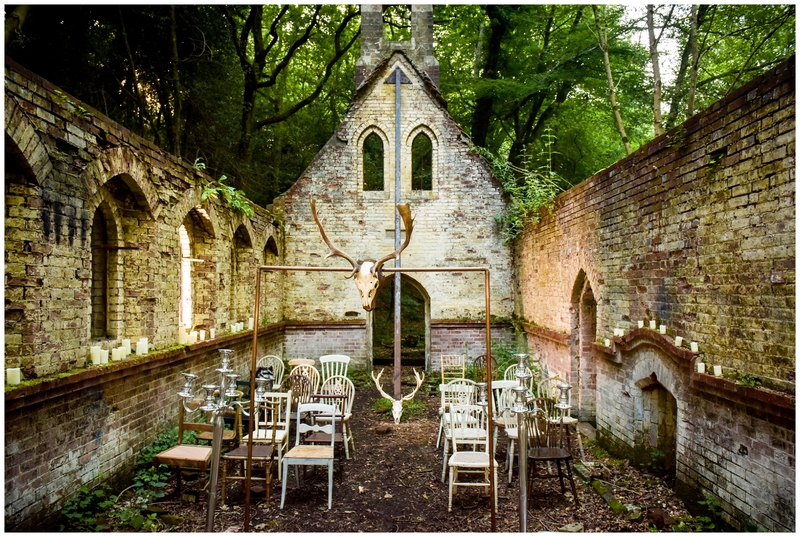 For nestling neatly amongst the earthy, mature gardens and next to the ornamental fountain and giant chair (see pics for explanation) is an outdoor chapel that most other venues could only dream of! 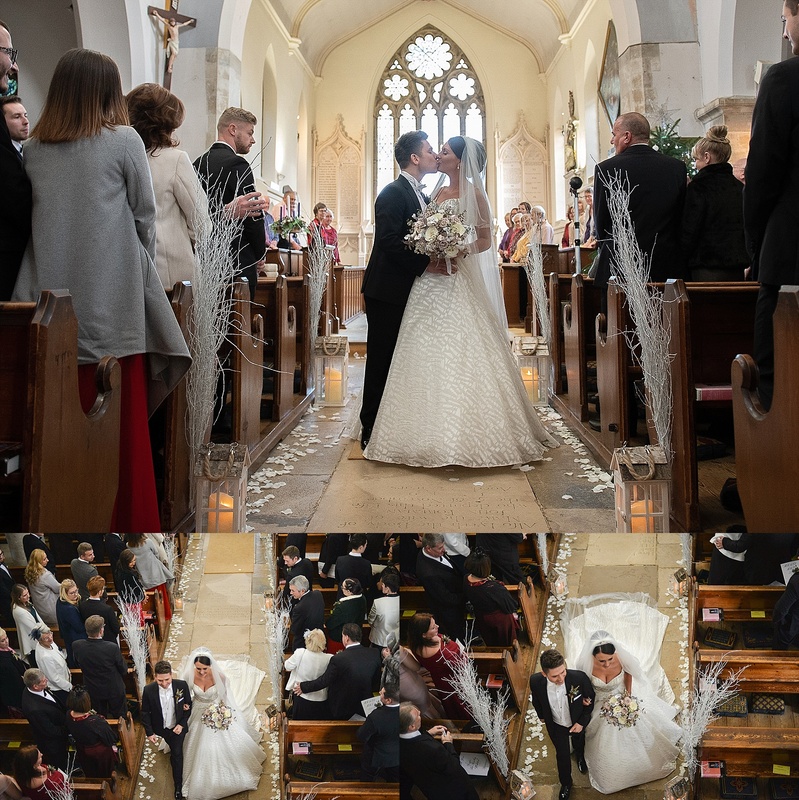 Set out in wedding style with the obligatory chair covers and giant ‘LOVE’ letters and masses of florals, the chapel was perfect. 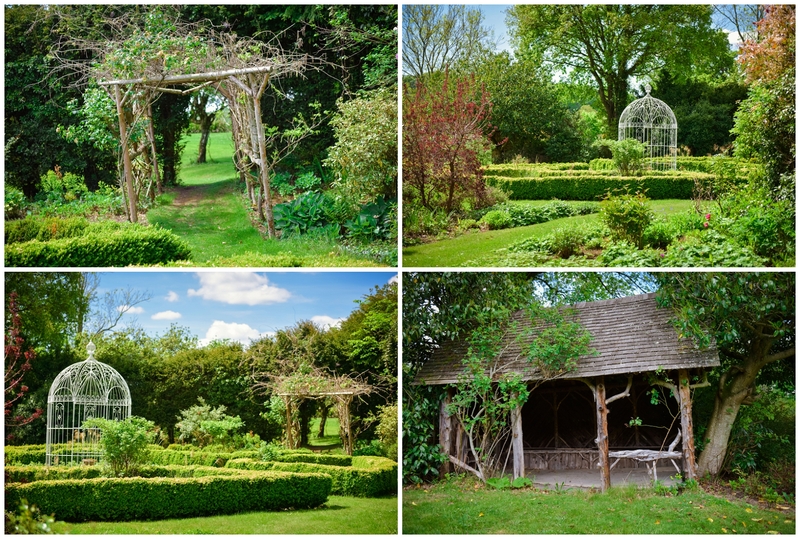 The gardens, oh the gardens! 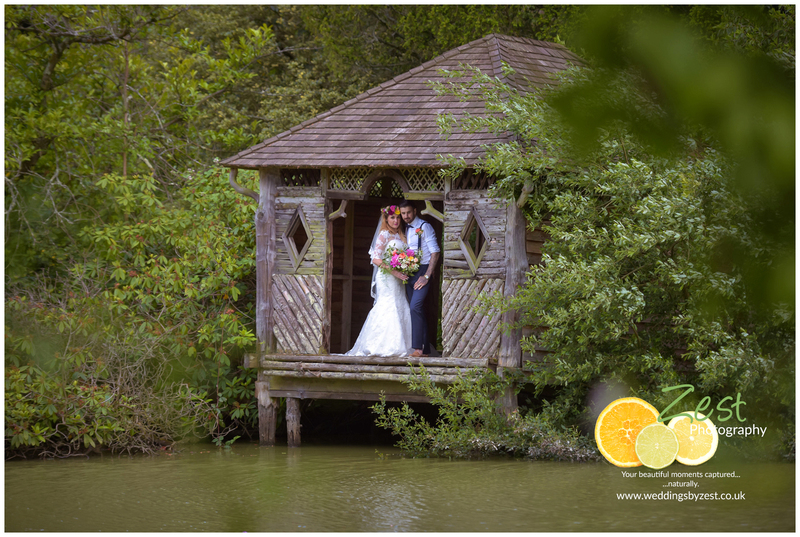 With 4 lakes, a folly, a giant birdcage thingy (what ARE they called anyway) a boat house, a little bridge and…and…the list goes on! 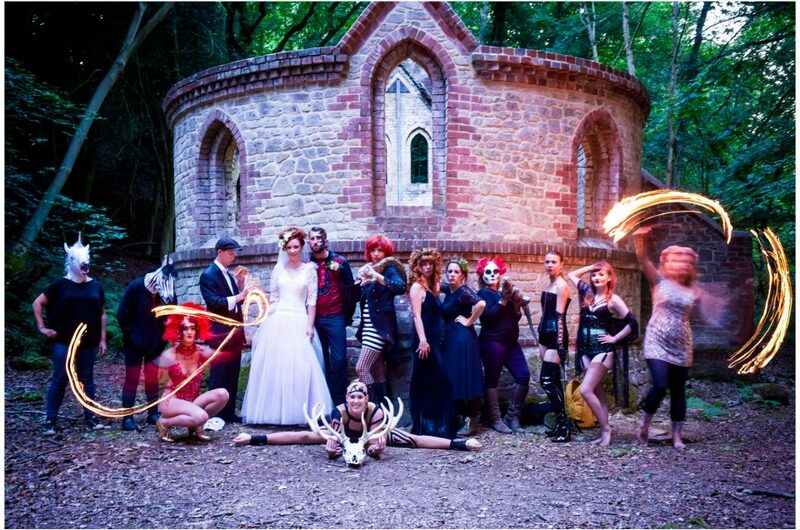 This is why and where The Ravenswood will succeed. 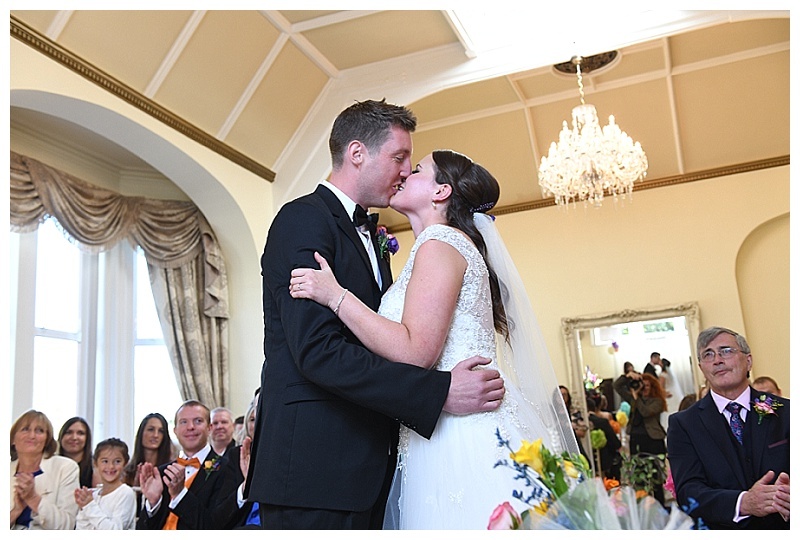 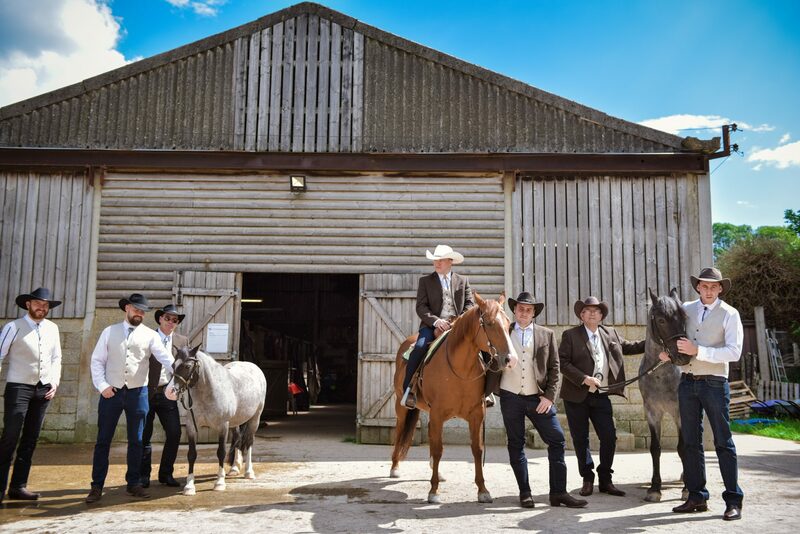 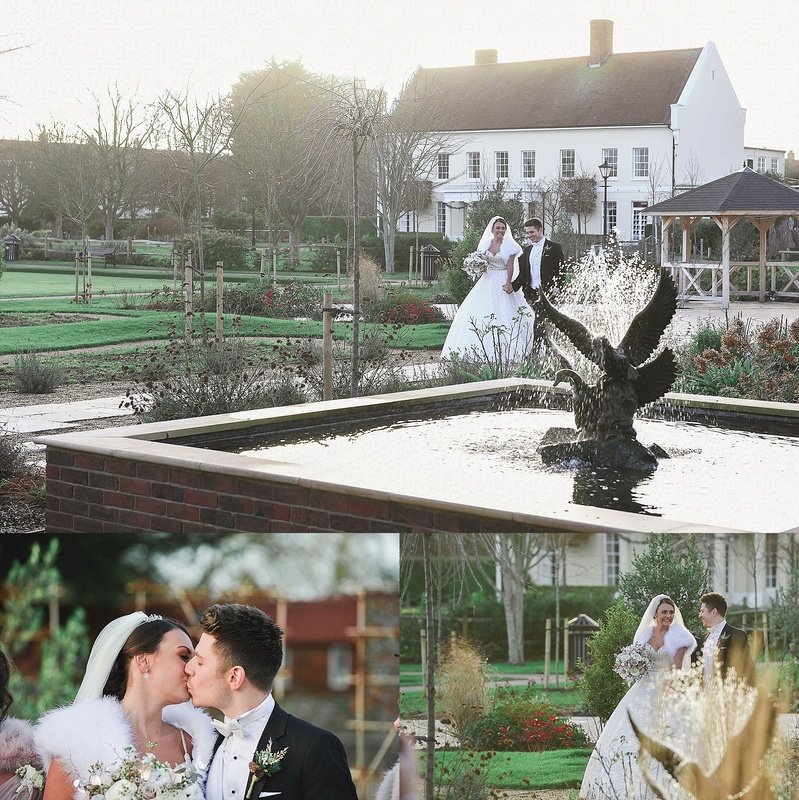 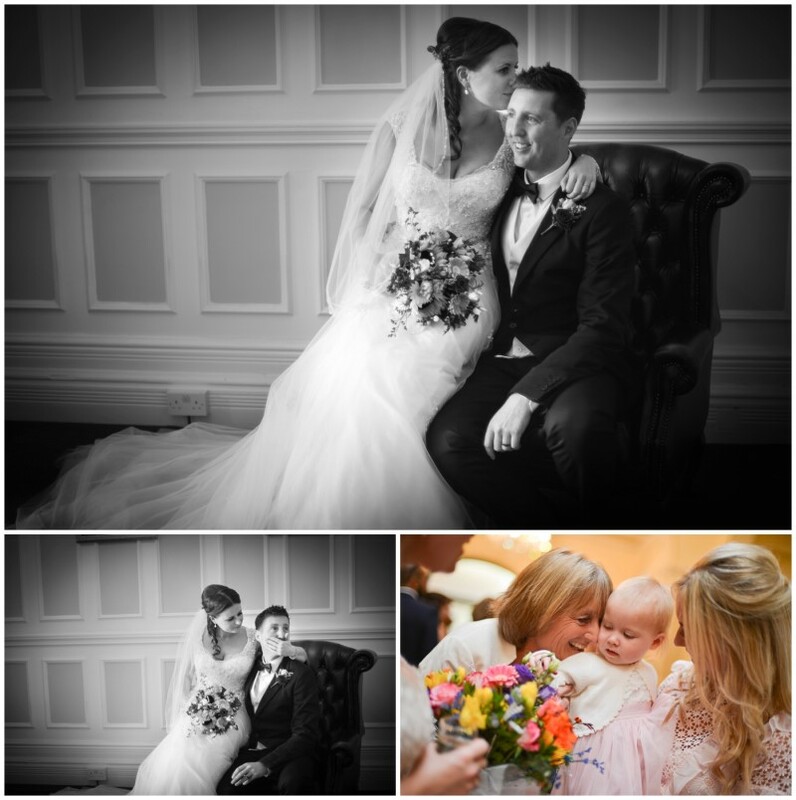 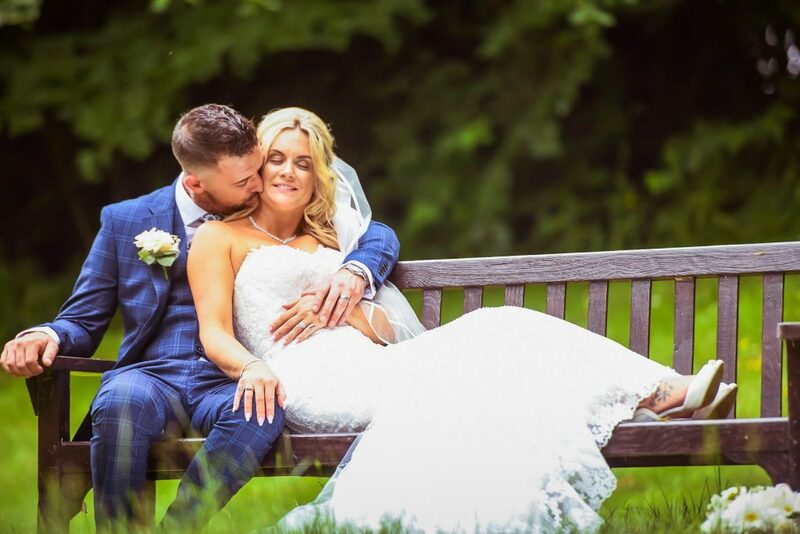 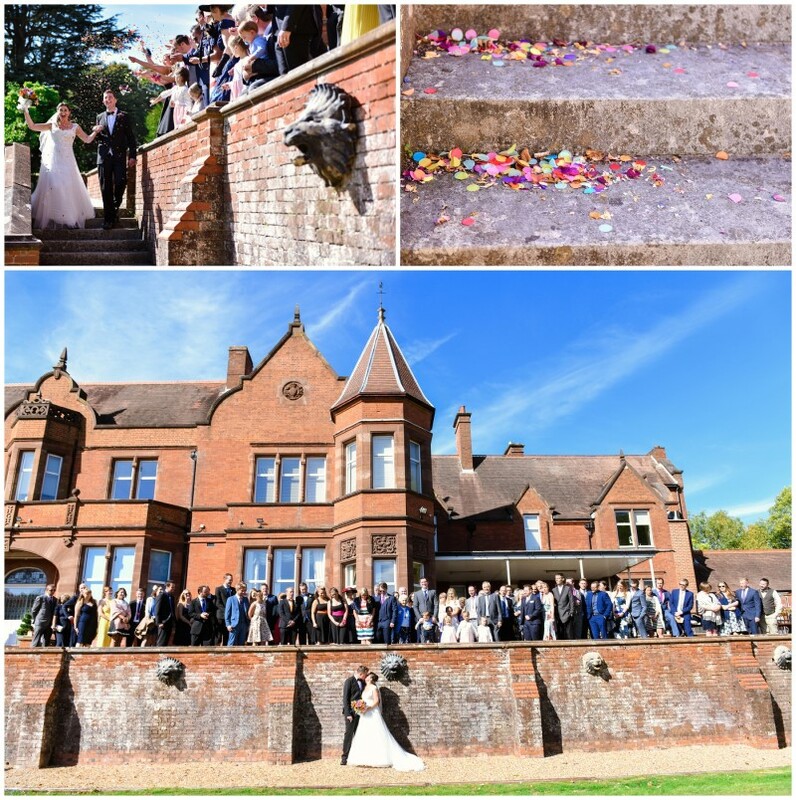 The perfect blend of outdoor wedding, classic, historic interior, grandeur, photographic opportunities by the bucket load and that huge suite with it’s fab bar – not to mention a very young and enthusiastic team of people determined to make a couples dreams come true. 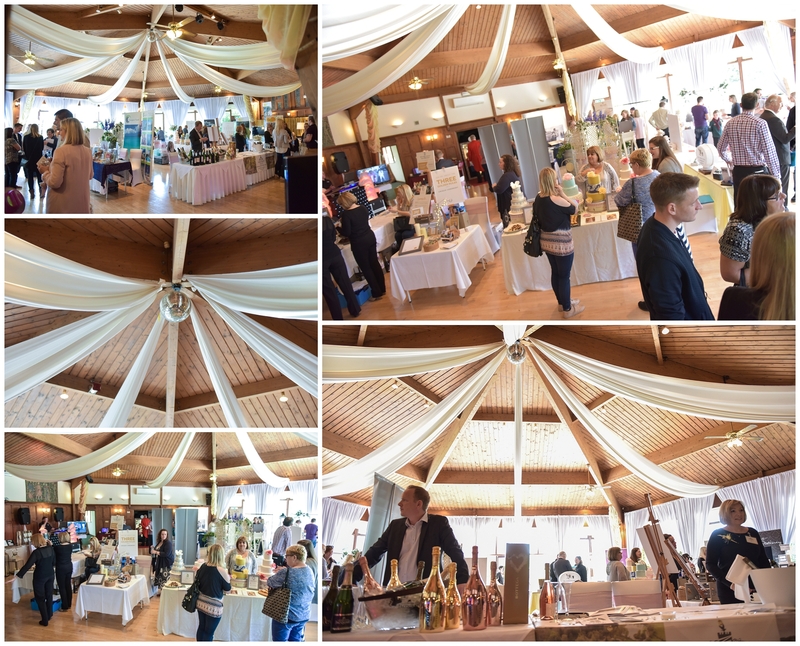 For a full list of exhibitors please scroll to the bottom of the page.